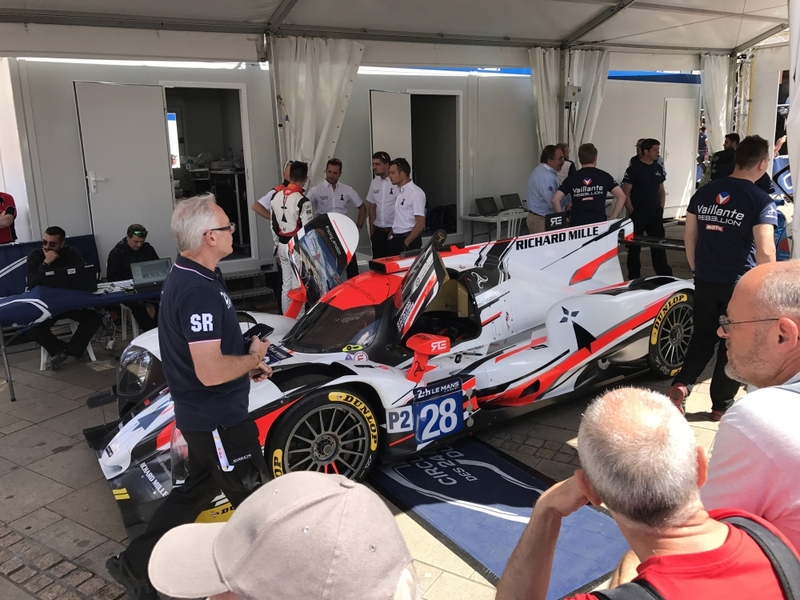 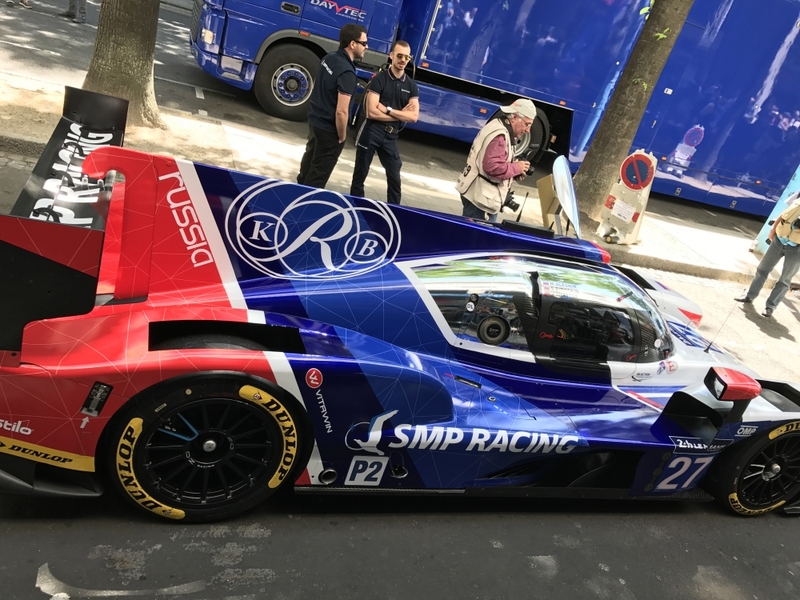 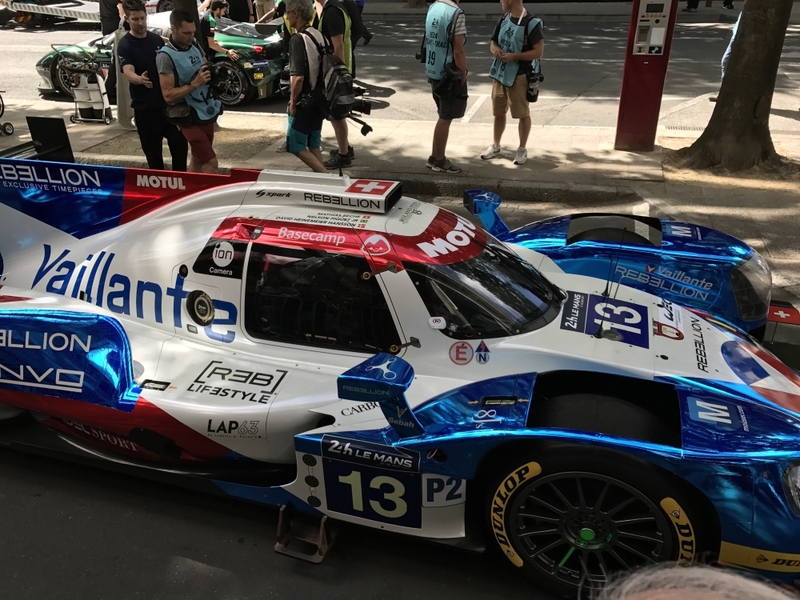 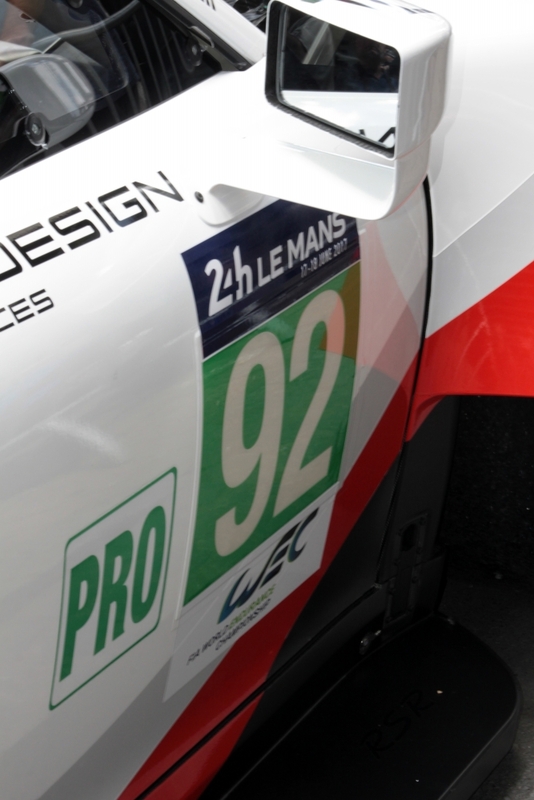 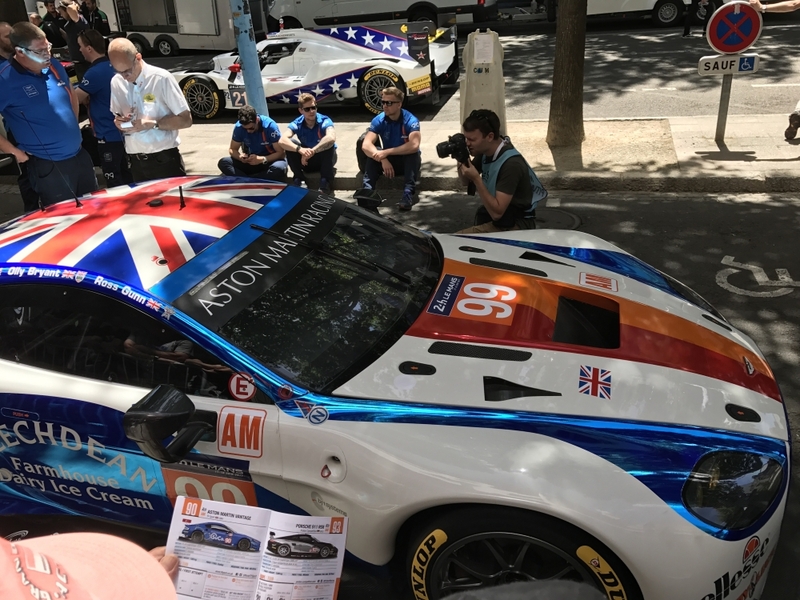 As I'm fairly sure I've said before in these pages (probably several times), there is something rather special for me about waking up on the Monday morning after my first night in my Le Mans 'home'. 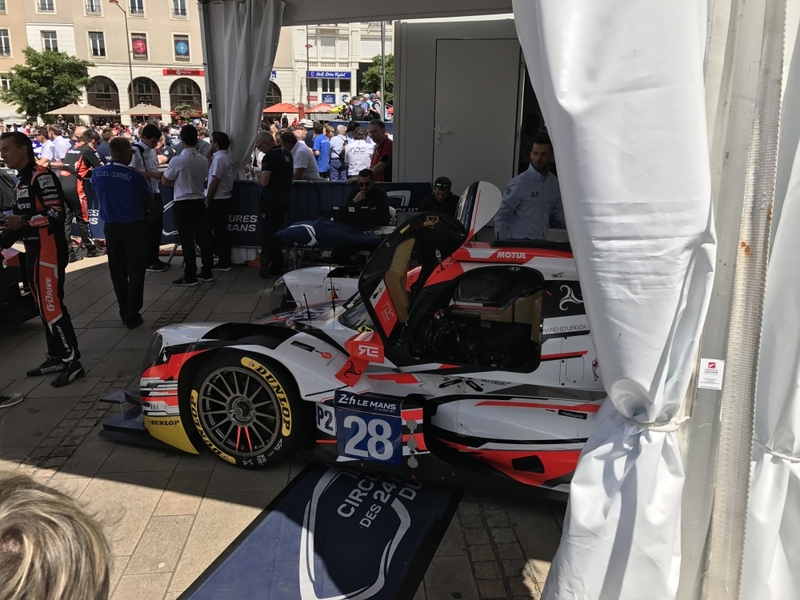 This year's event had of course barely started but I was already into day three of my trip. 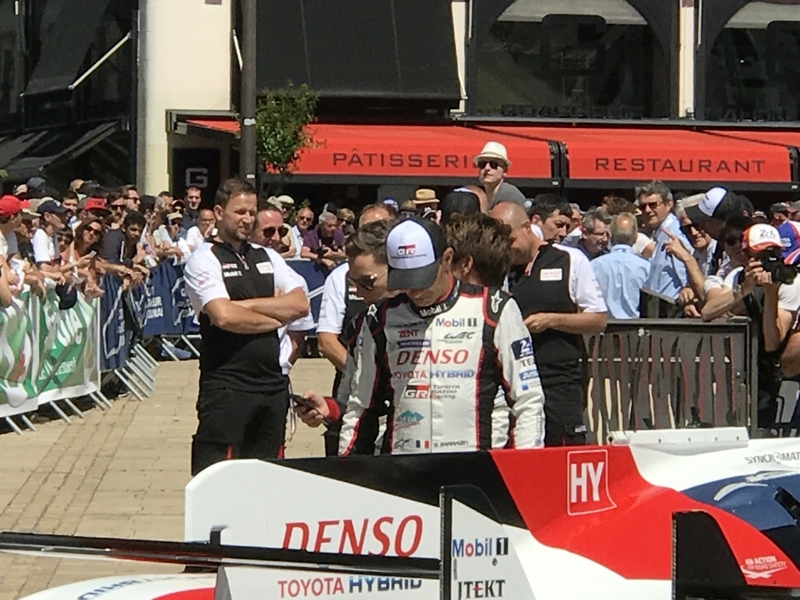 After the heat of Sunday it was thankfully a little cooler that morning and I pottered around in my room, made myself some coffee and I was just beginning to think about jumping in the shower when I was shocked to receive a text from James just before 8.15 am telling me that he was almost ready! 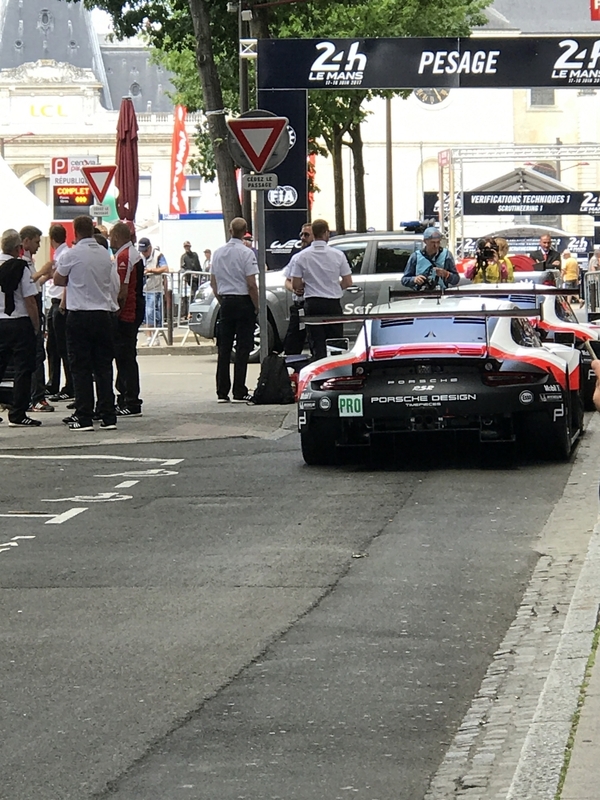 I was shocked because in all the years we've been going to Le Mans together I'd become used to the given fact that James is most certainly not an early riser and would rarely surface before 9.30-9.45. 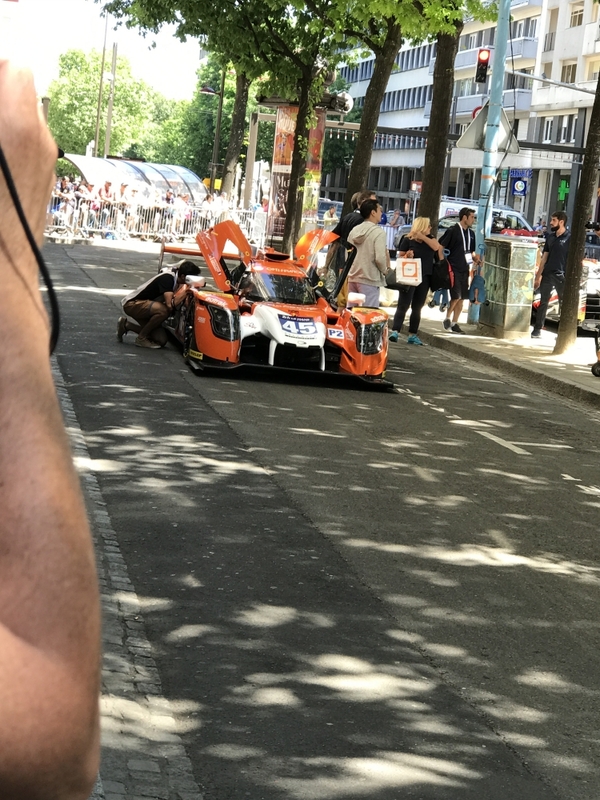 So I quickly showered and dressed and I was ready in about 20 minutes! 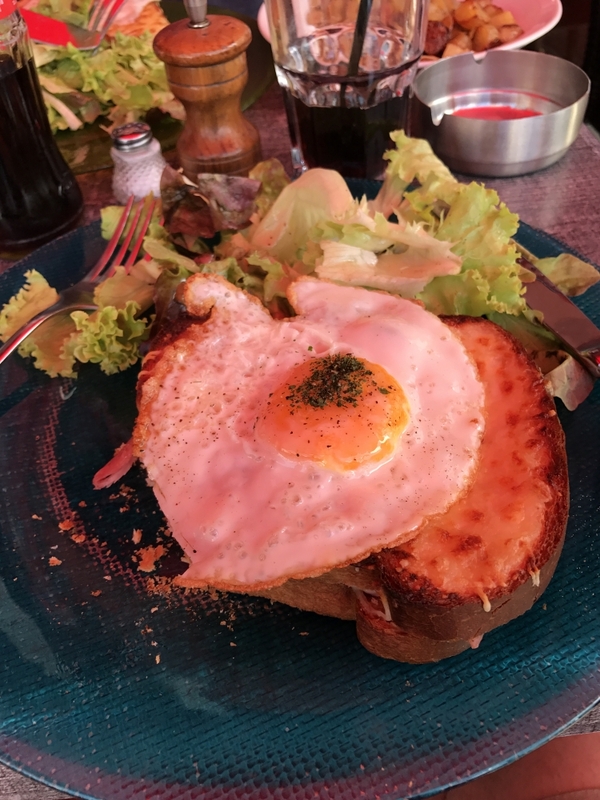 So by the astonishing time (for us) of 8.45 am we were off to the Bar Havane for breakfast for the first time in 2017. 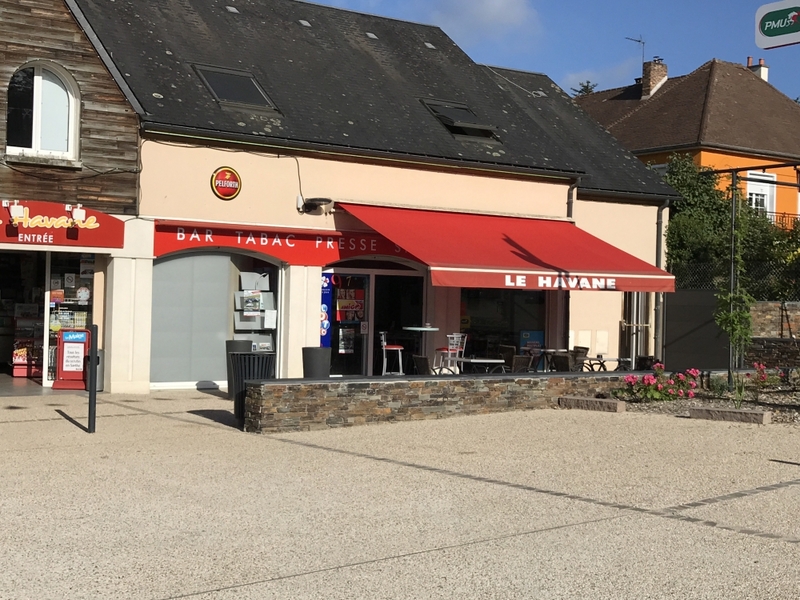 It was good to be back at the bar with it's strong coffee with croissants and pain au chocolat from the patisserie around the corner. 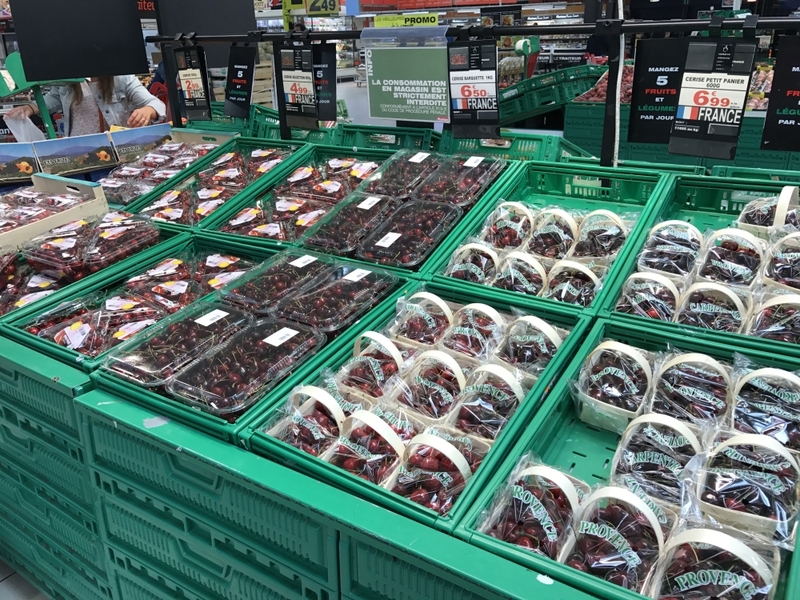 Having enjoyed our fill of coffee and pastries in the warm morning sunshine we decided that now would be a good time to make a trip up to Auchan for provisions where I bought water, cherries, strawberries and some of my favourite almond tuiles. 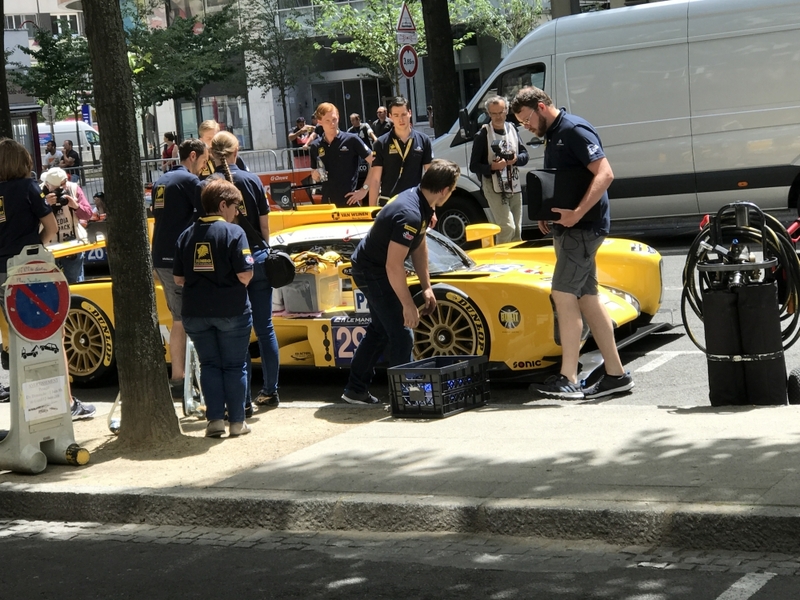 Having returned to the hotel to stash our provisions, we jumped back in the car to head into town for day two of scrutineering. 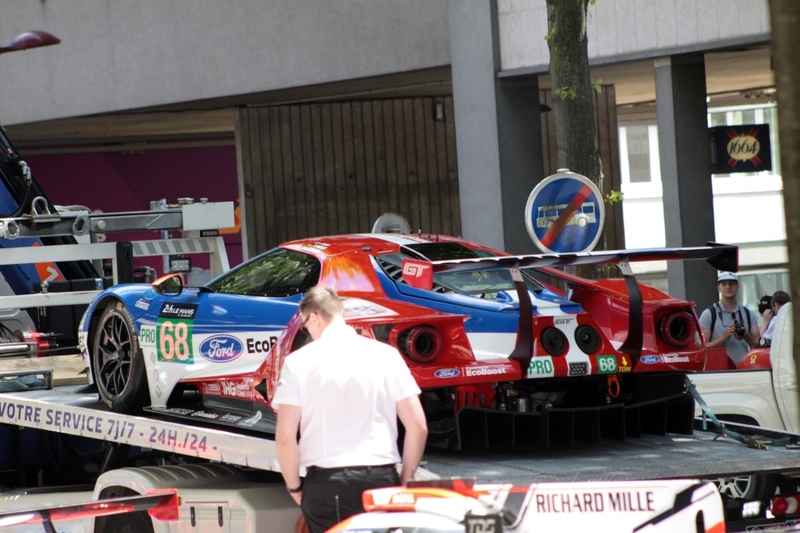 And so began the hunt for the elusive car park! 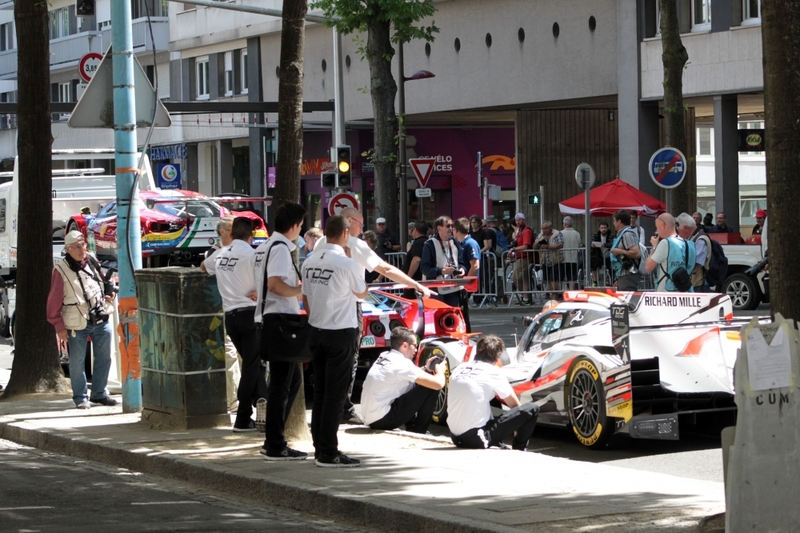 We drove around for quite a while ending up down by the river more than once as well as visiting the station and I was beginning to think that a trip to the car park by the river really was the only option when all of a sudden we found the entrance to another car park, almost hidden, but still within reasonable walking distance of the Place de la République. 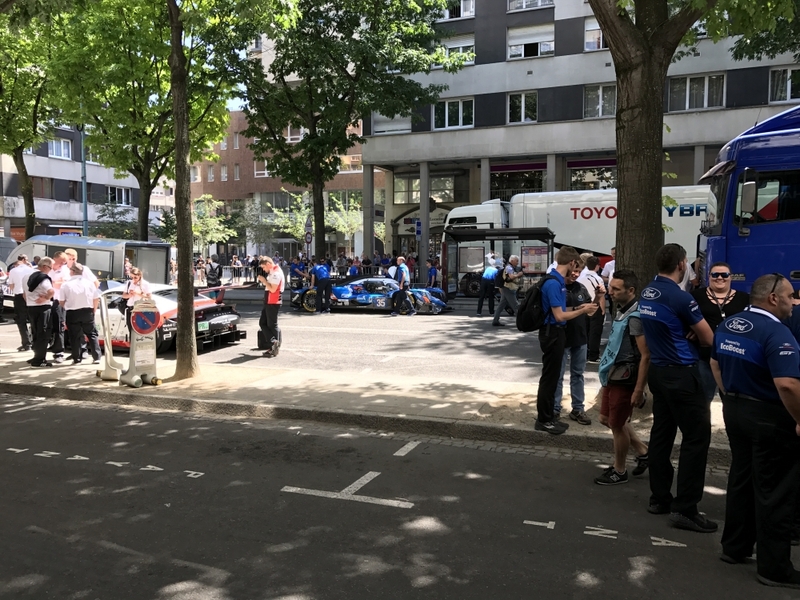 We entered the car park at ground (river) level where there were one or two cars parked and drove up a number of relatively steep sloped floors, all of which were almost entirely devoid of cars until suddenly we reached the top. 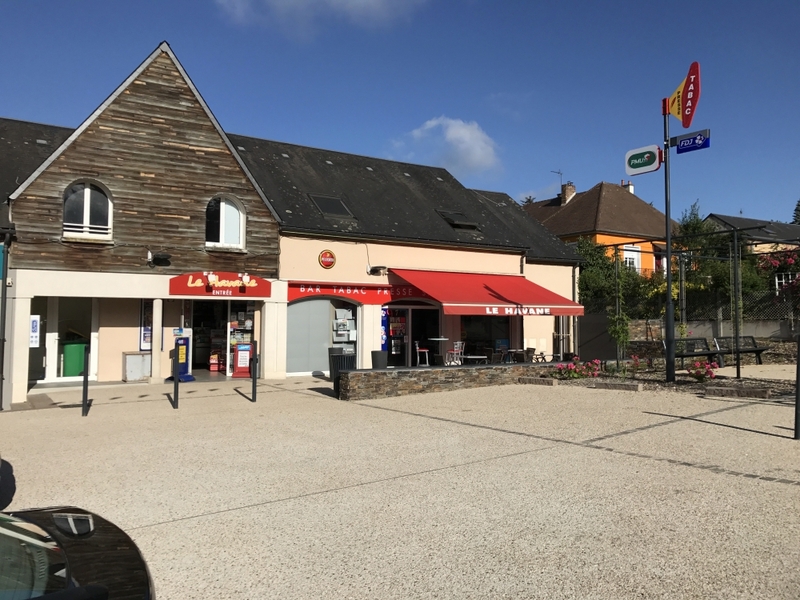 You have to remember that there is a lot of elevation to the town and we were optimistic that having gone up so far we would be pretty much on a level with where we needed to be! 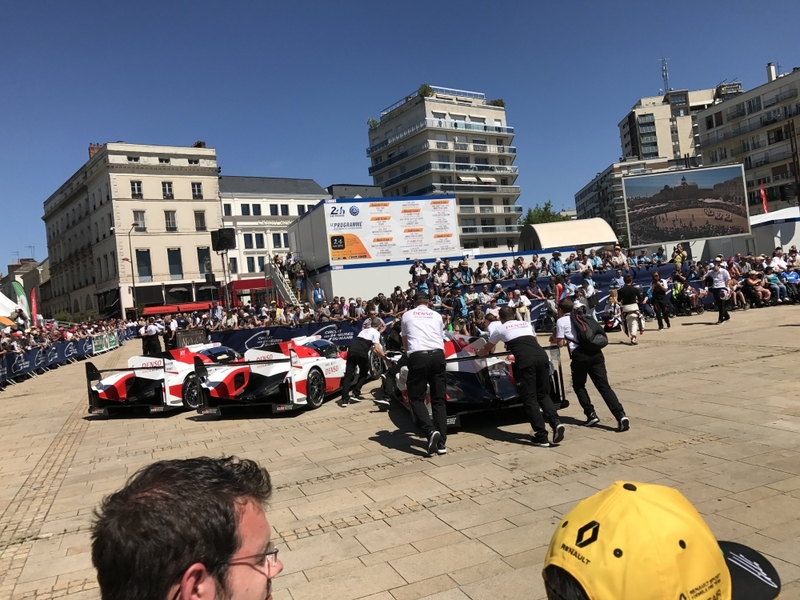 There were a few more cars at the top but there wasn't another soul in sight, just a payment machine where we would have to pay when we left. 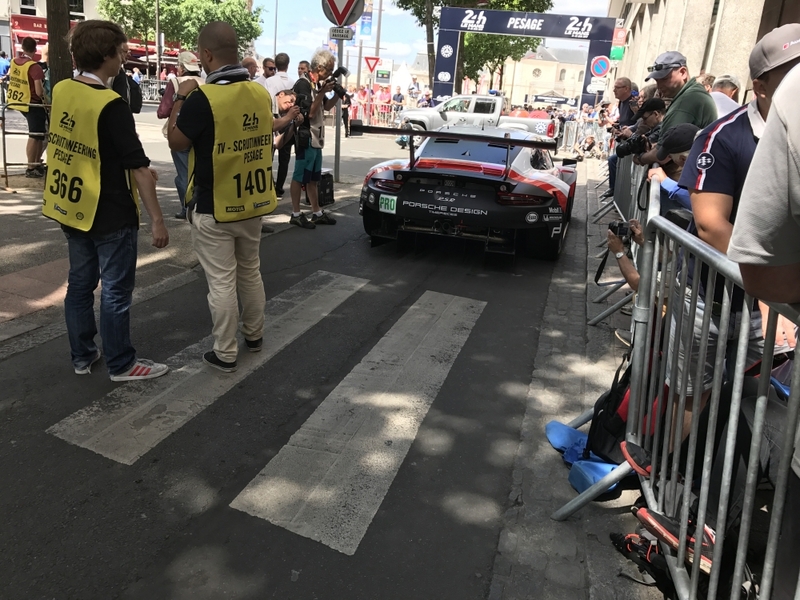 There seemed to be no restriction on parking time so we secured the car and made our way out. 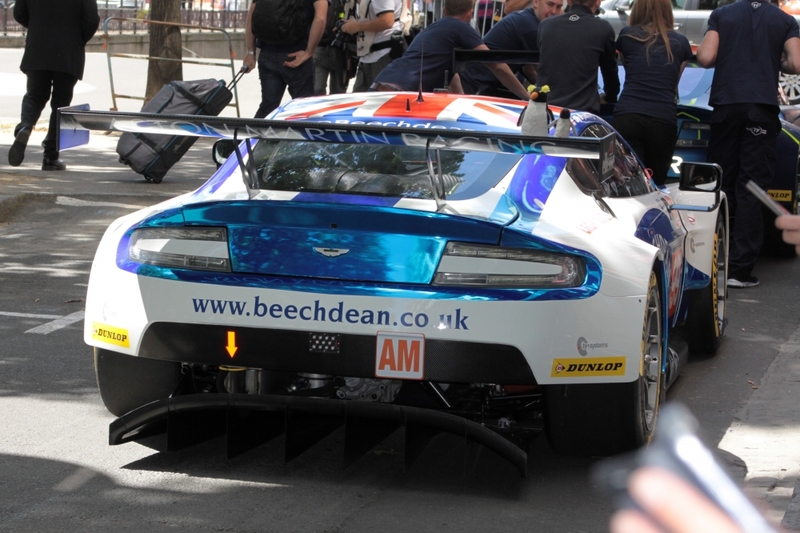 It was actually quite eerie as even when we emerged from the car park, the area at the top was largely deserted. 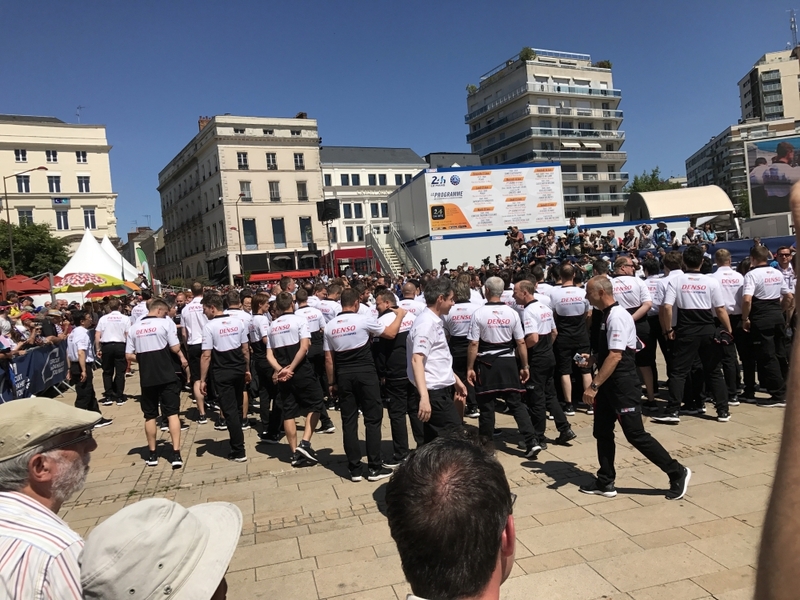 Out in the sunshine we got our bearings fairly quickly and having walked for five minutes or so we found ourselves on roads we recognised and after a 15-20 minute walk we were back in the Place de la République. 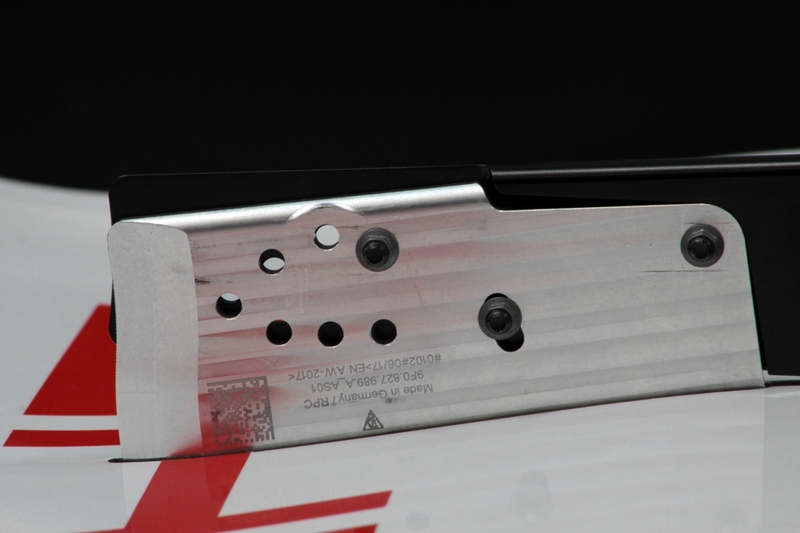 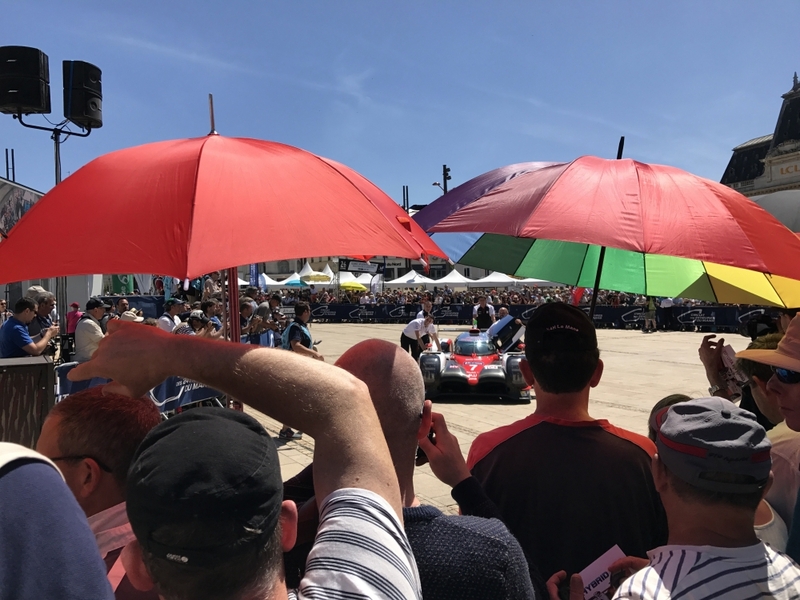 So, having enlivened my story with another 'traditional car park tale, I can now take you back to our day at scrutineering! 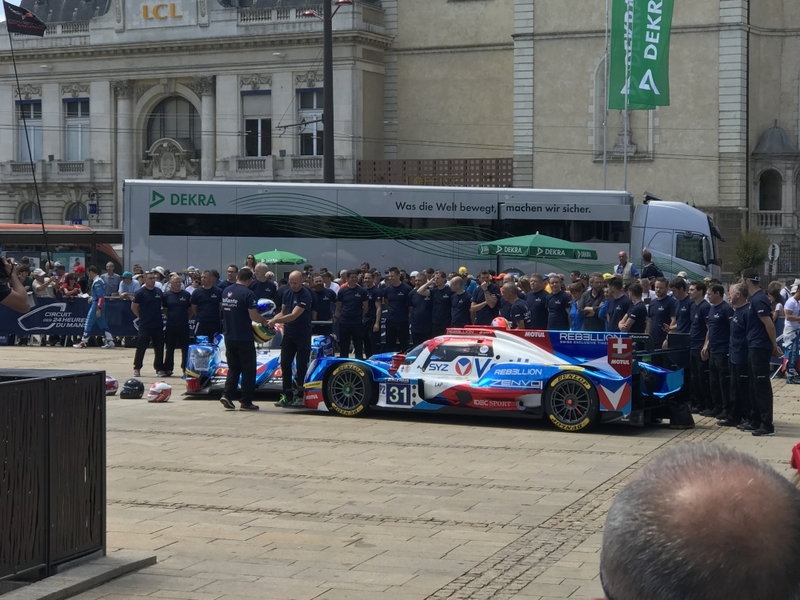 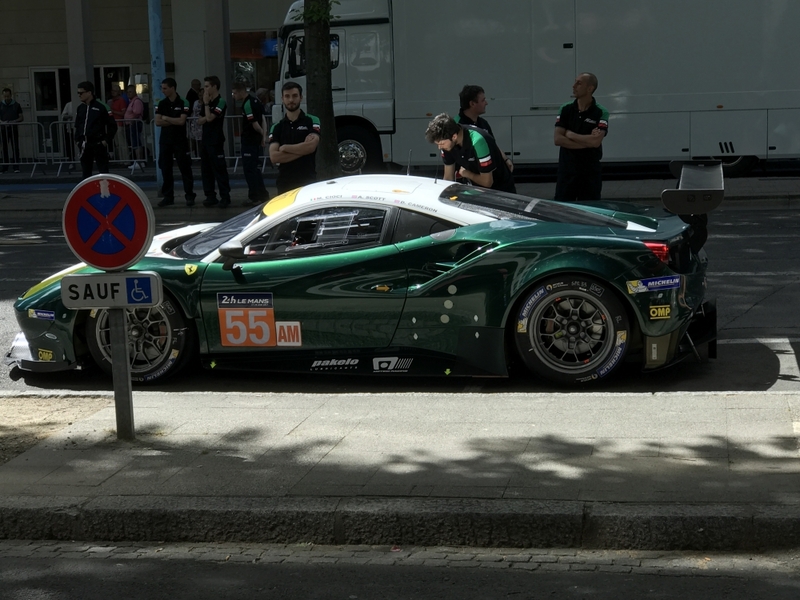 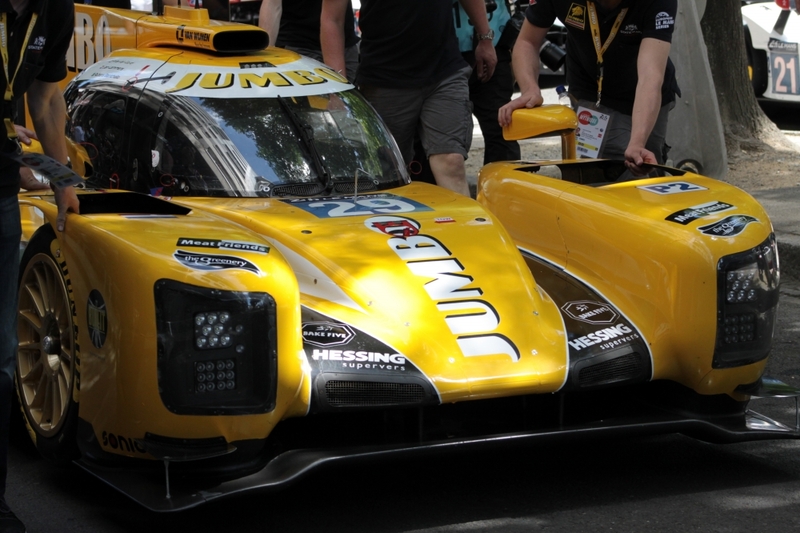 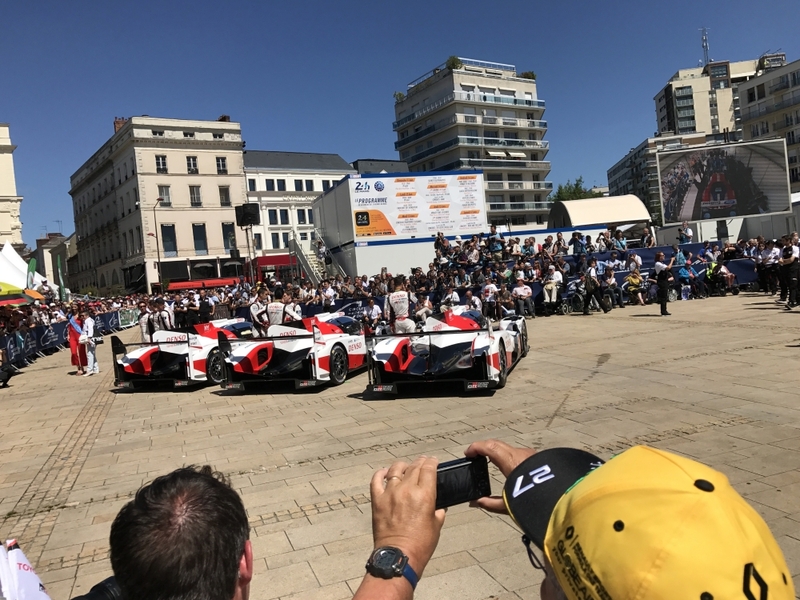 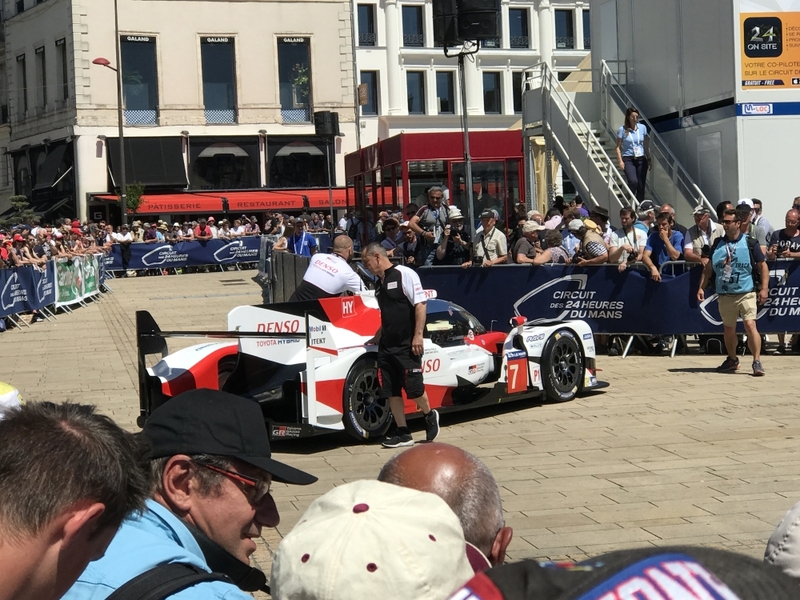 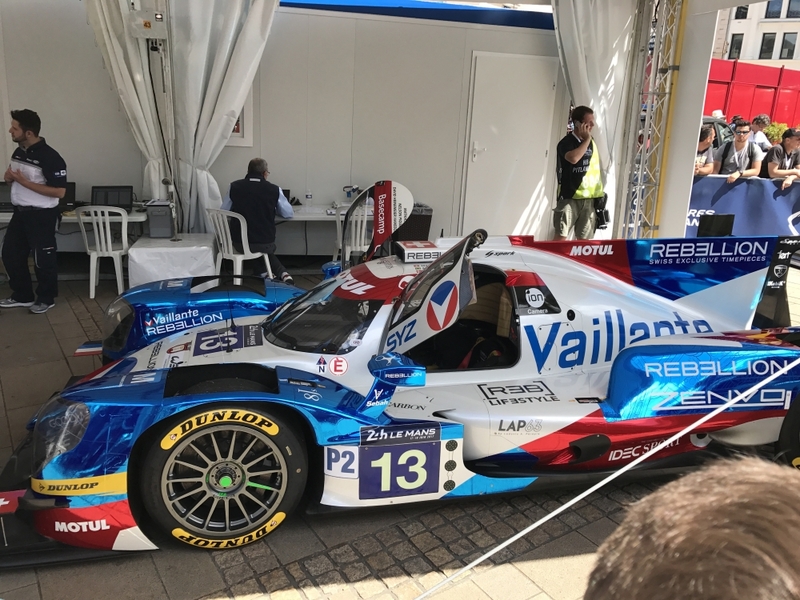 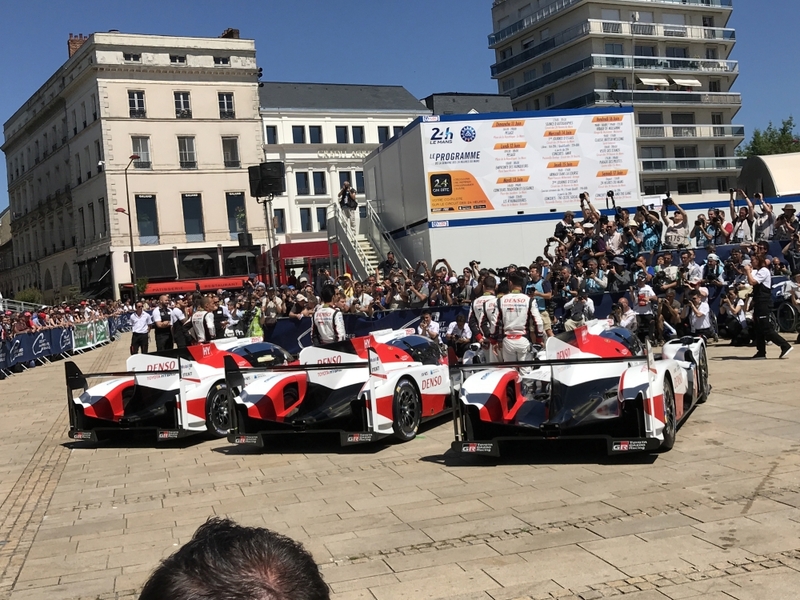 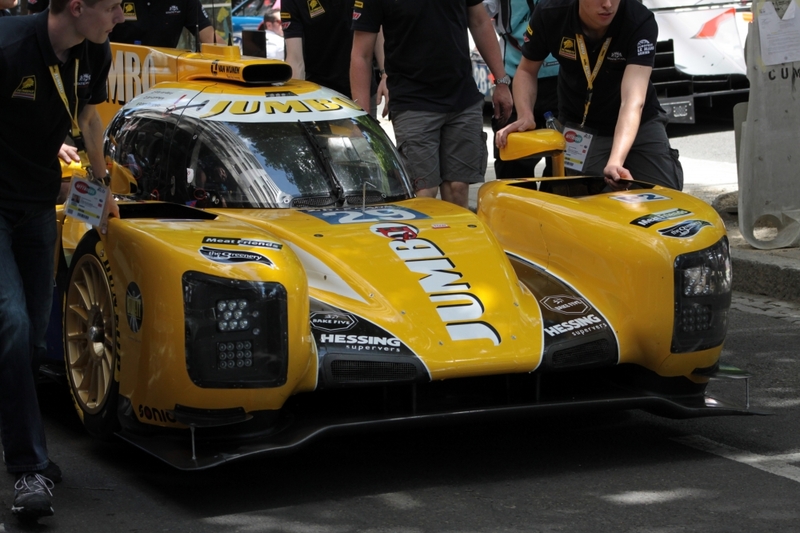 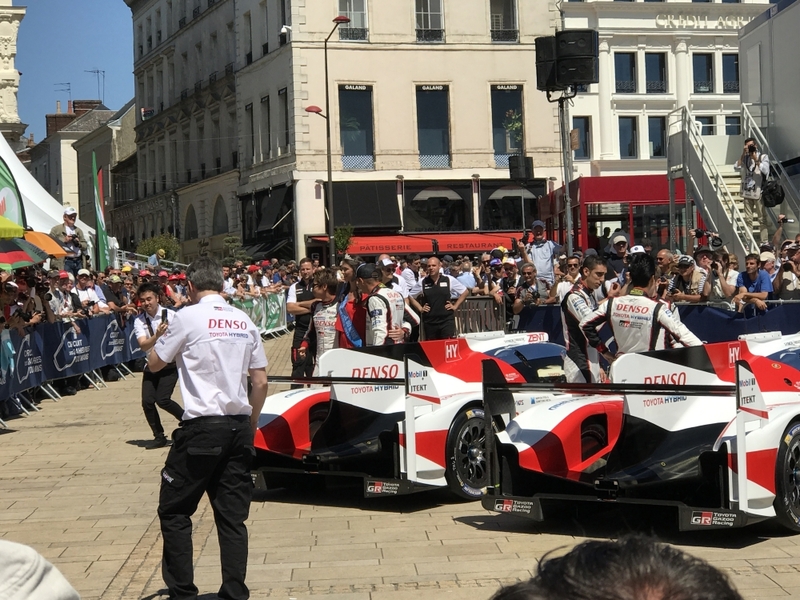 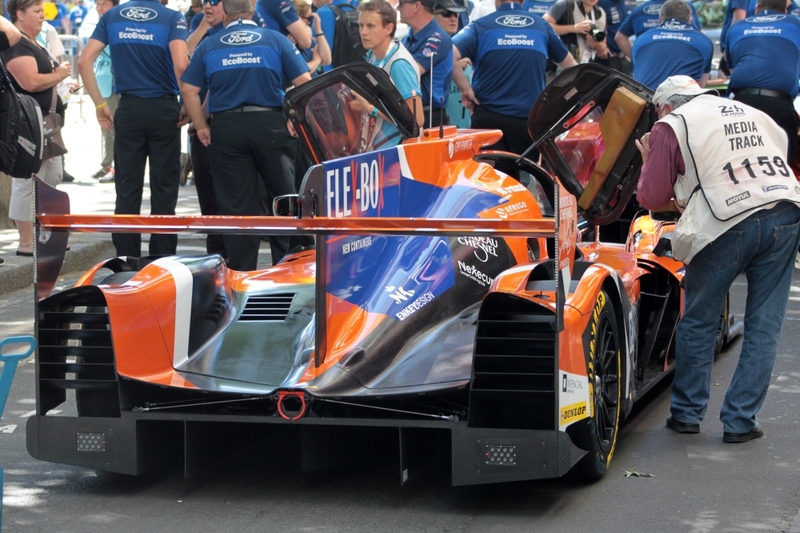 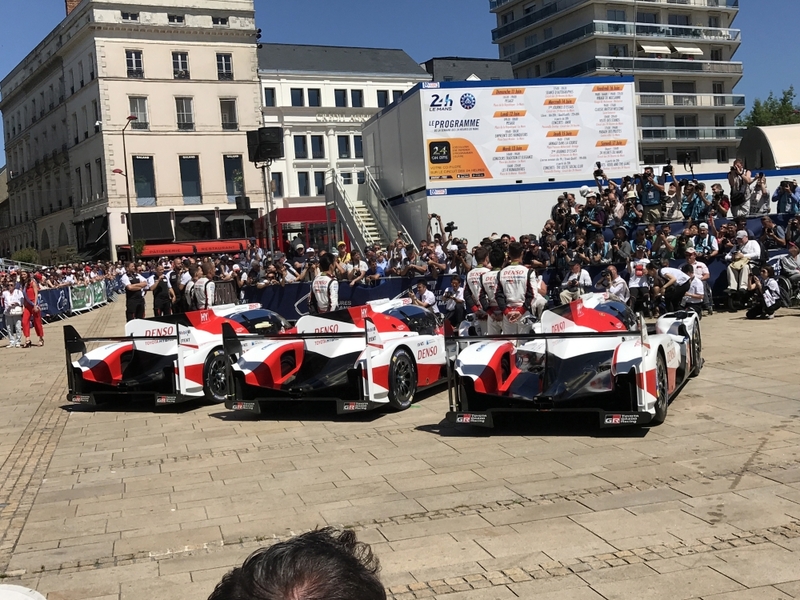 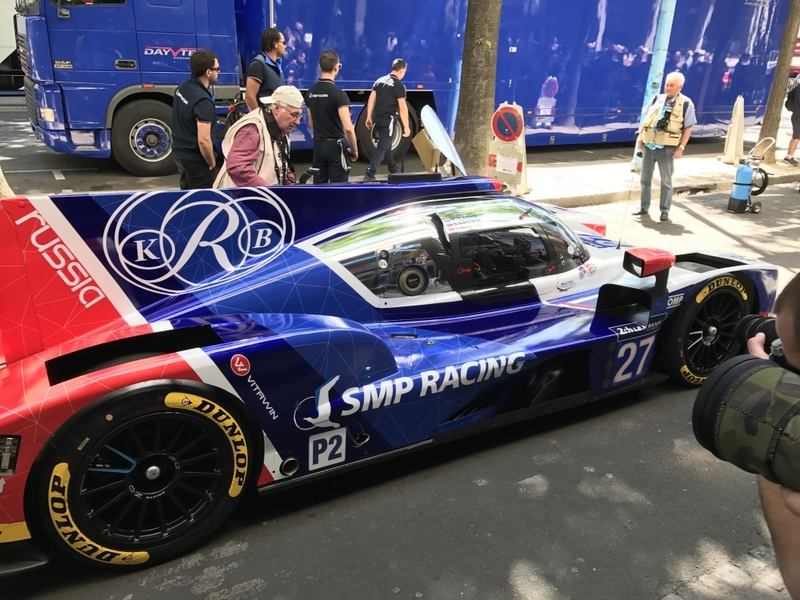 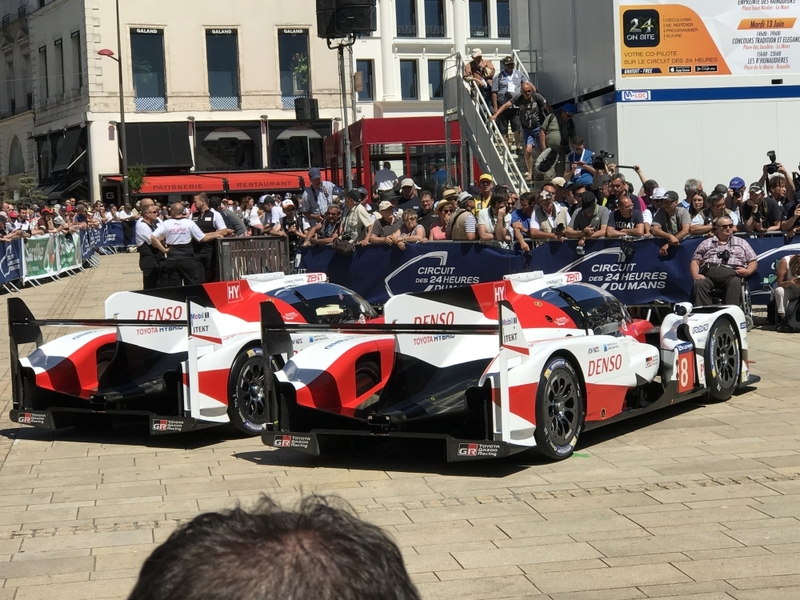 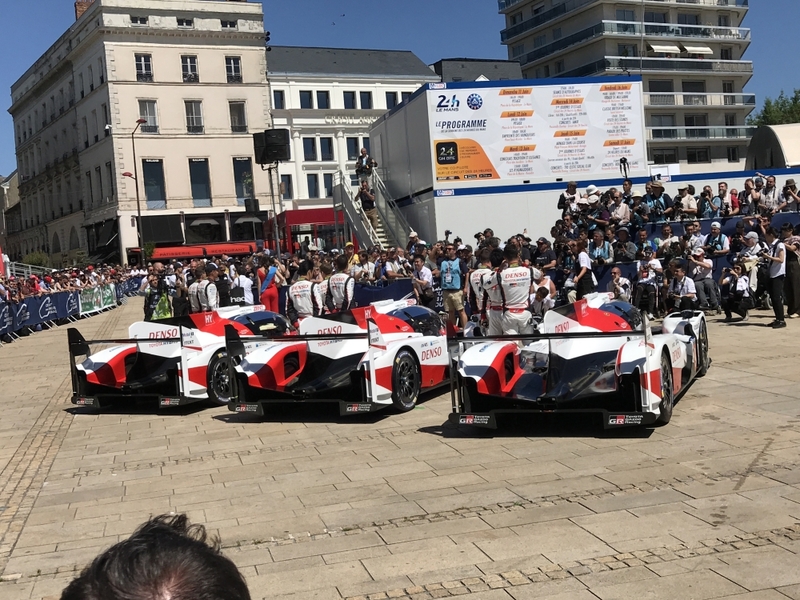 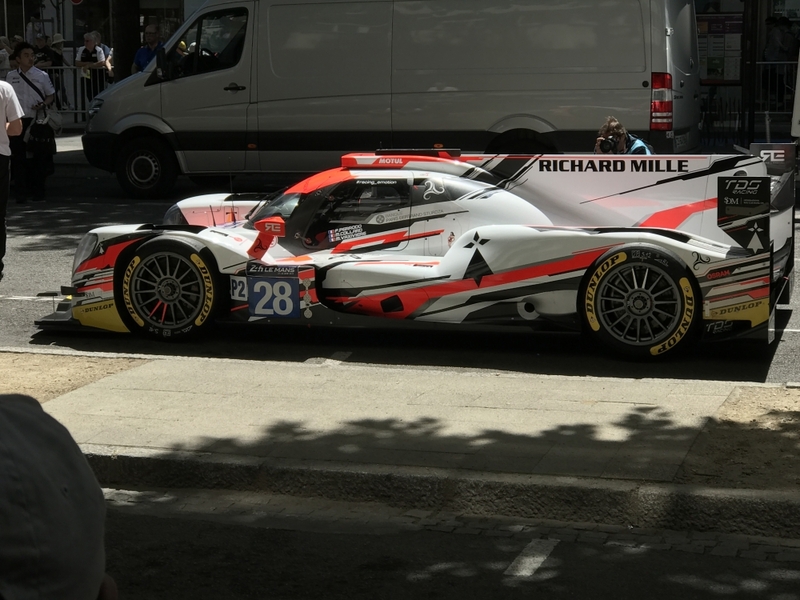 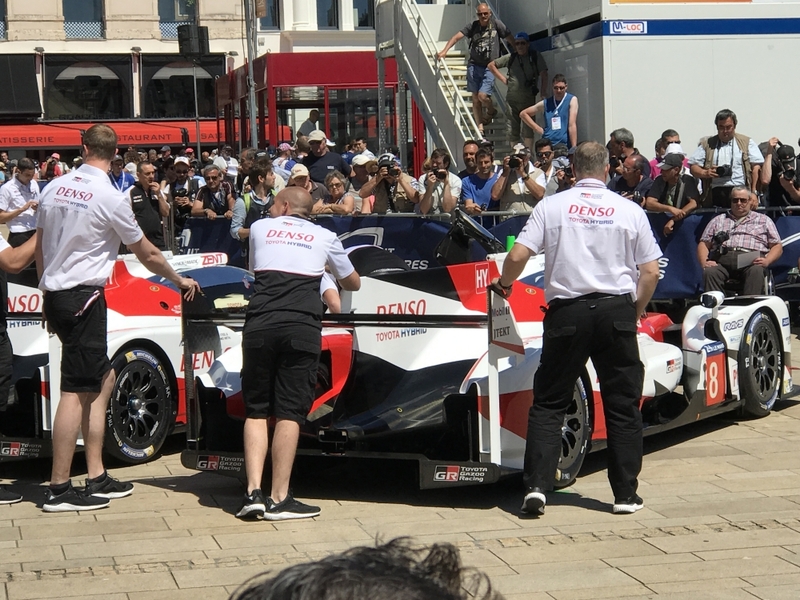 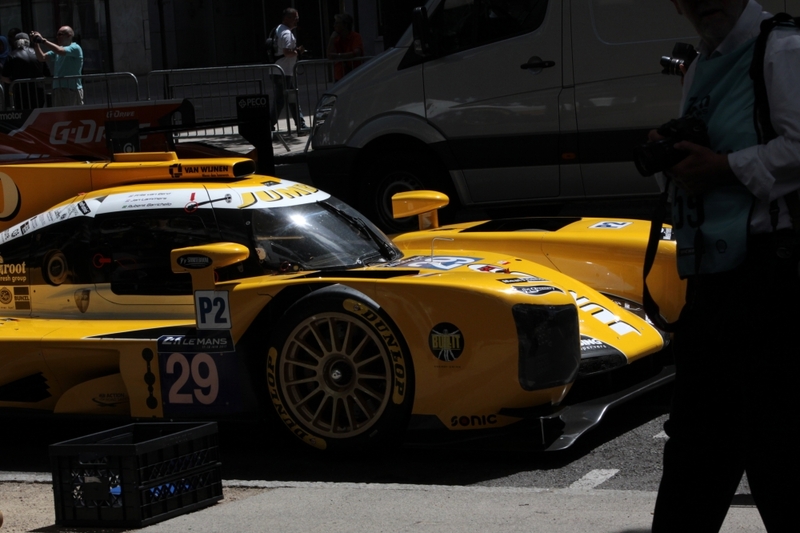 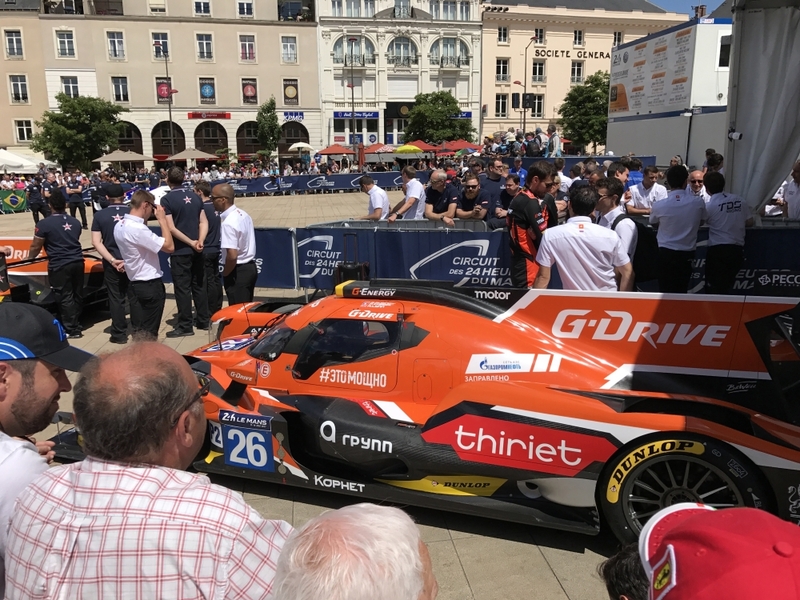 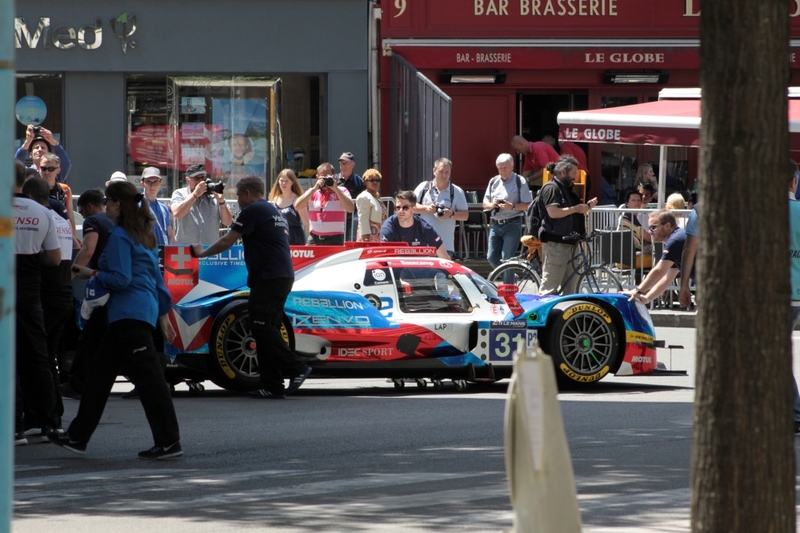 We took up our usual position in the road adjoining the square where the cars arrive from the circuit and were pleased to see the Rebellion Orecas in their splendid new colour scheme. 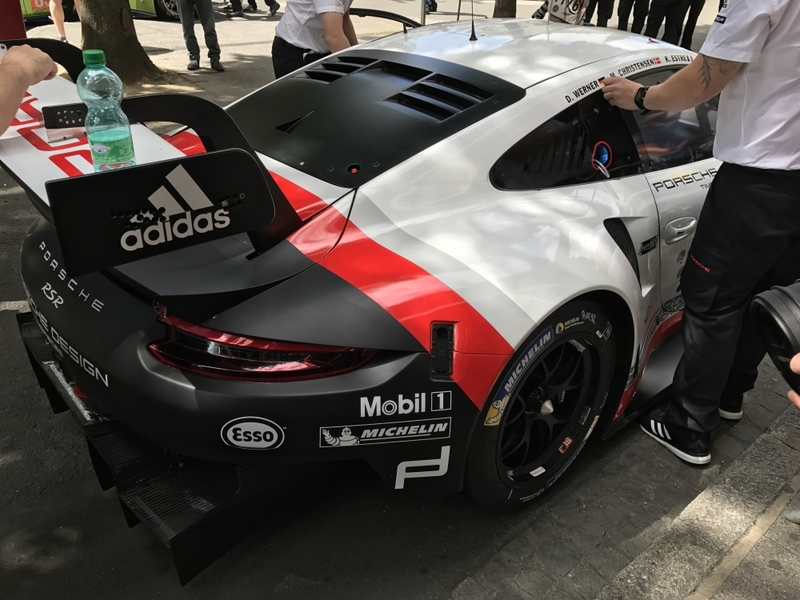 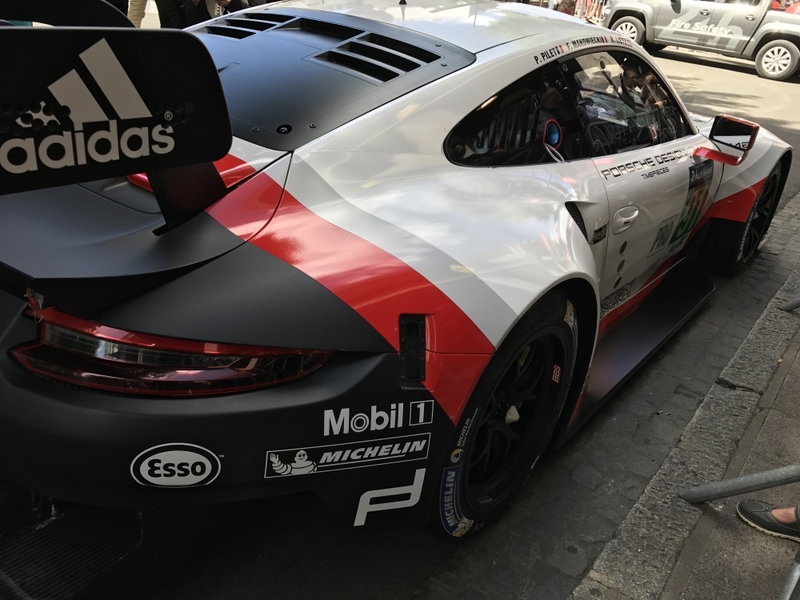 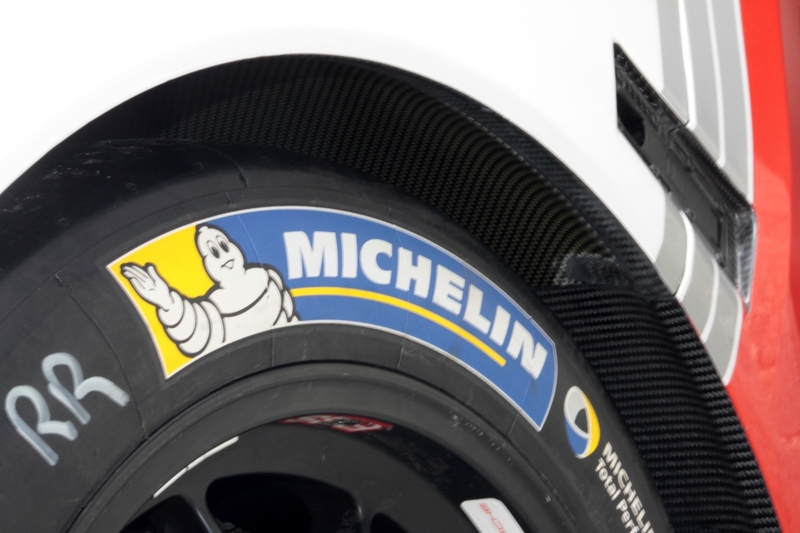 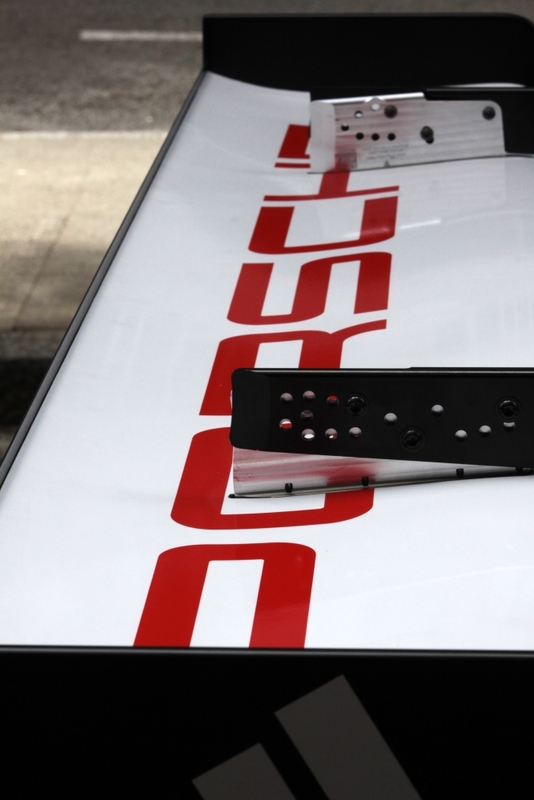 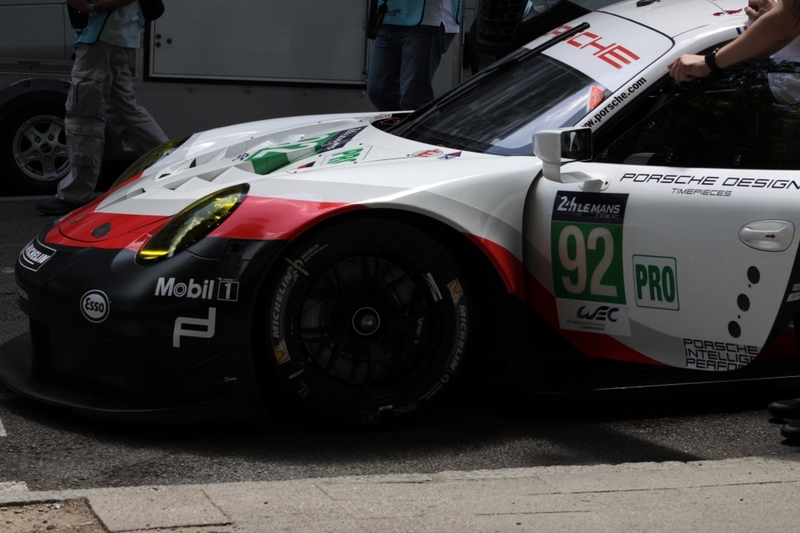 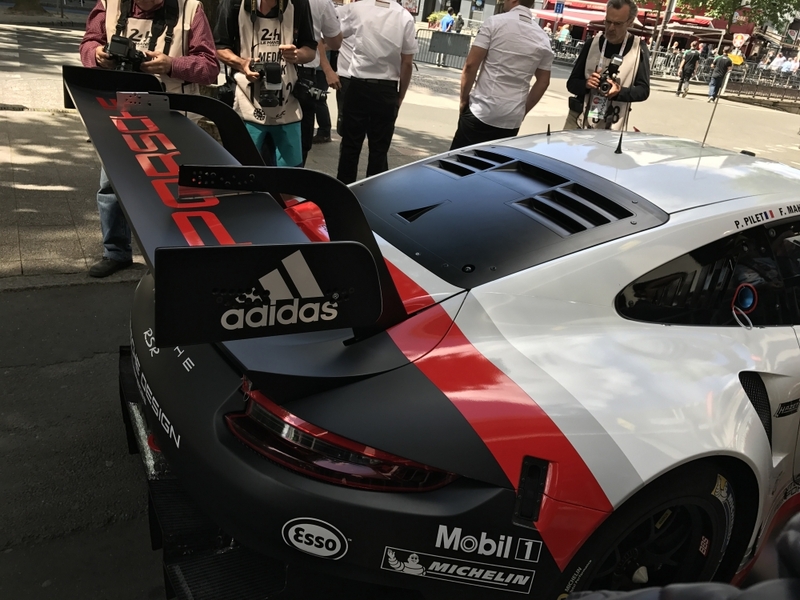 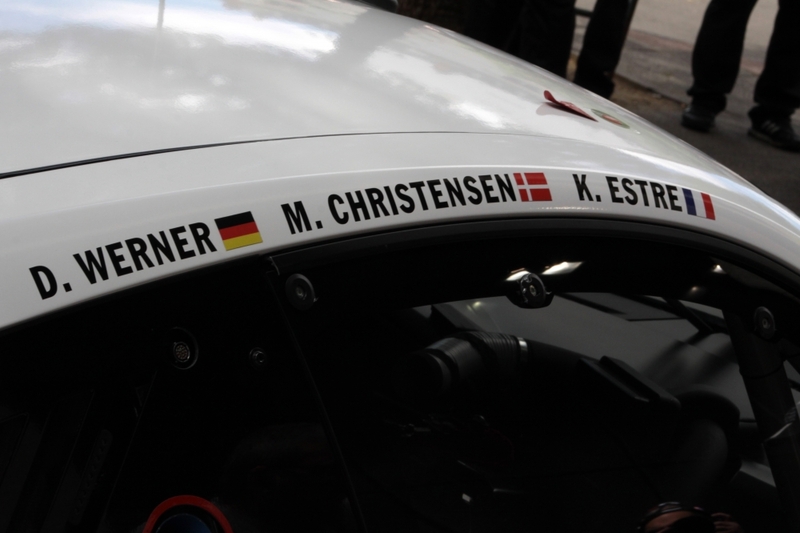 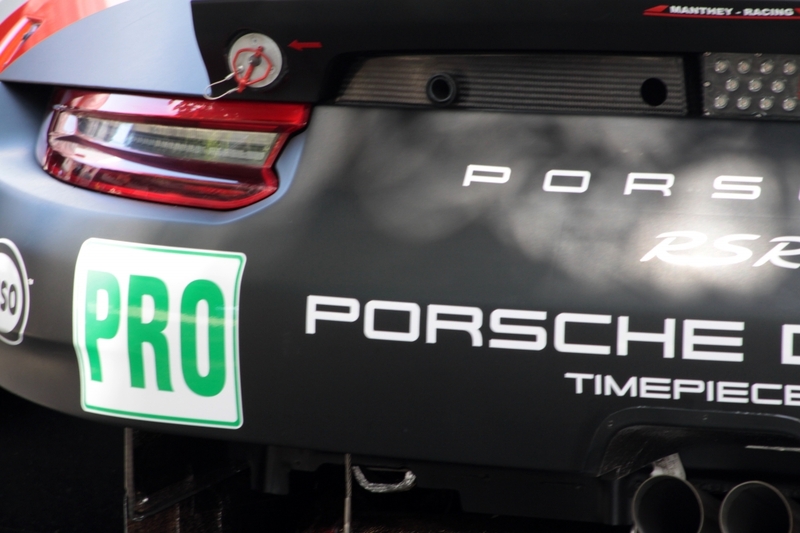 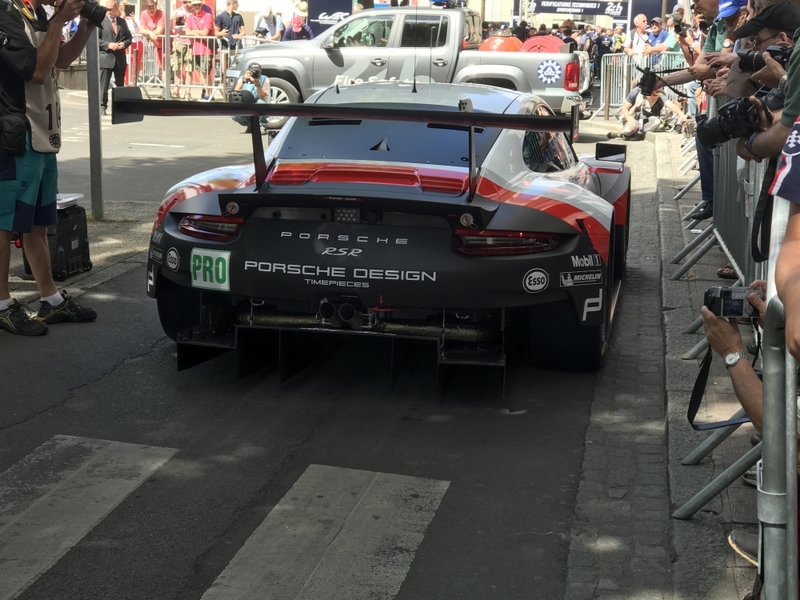 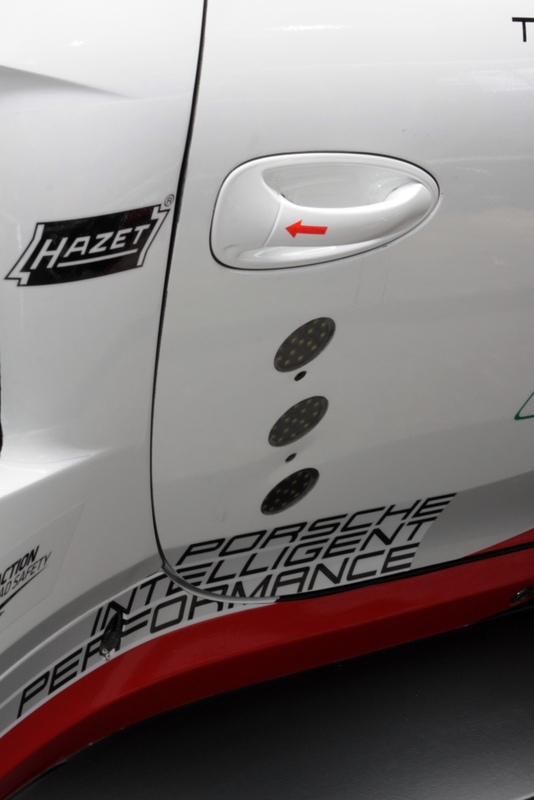 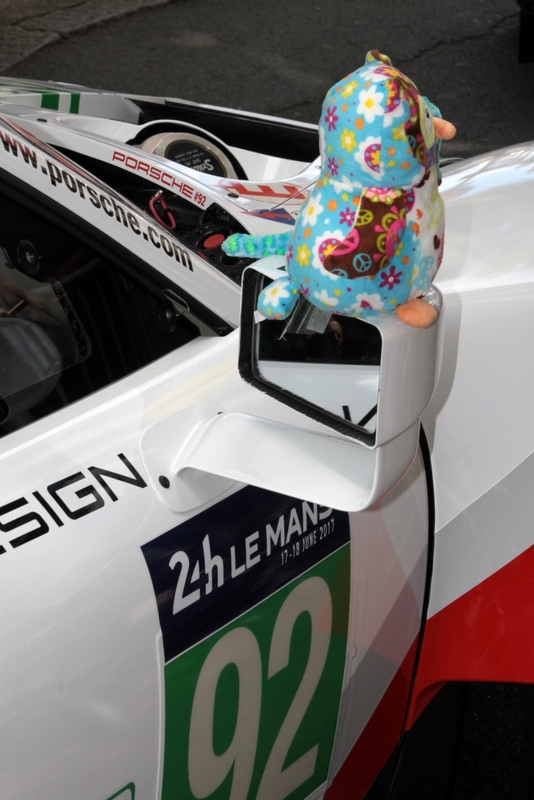 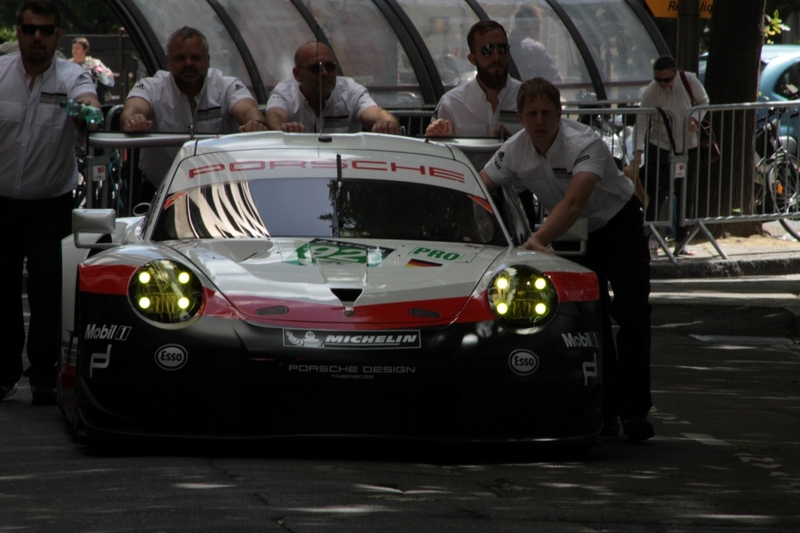 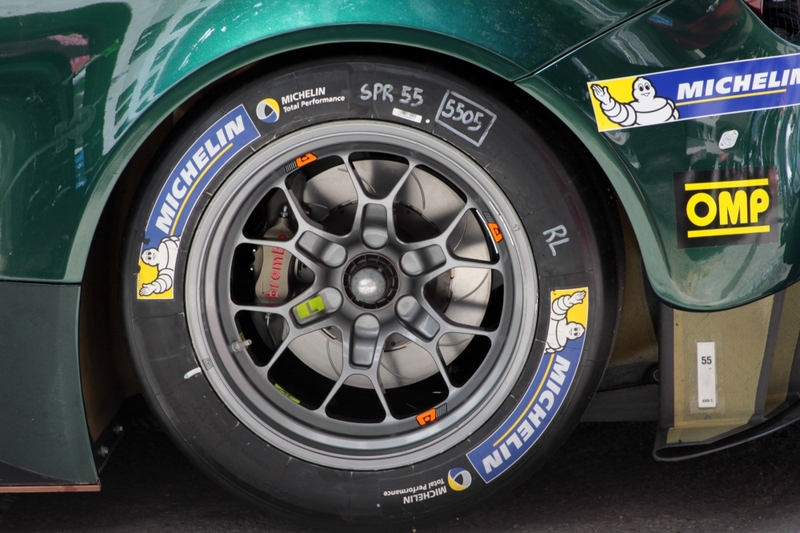 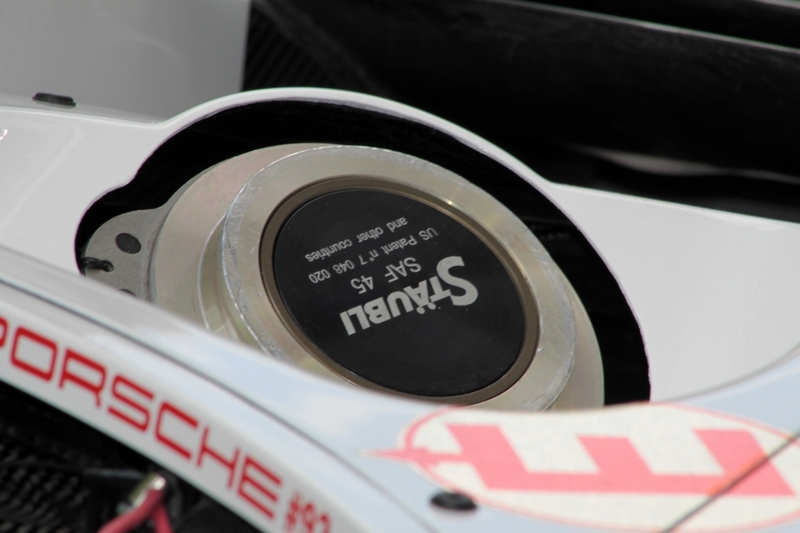 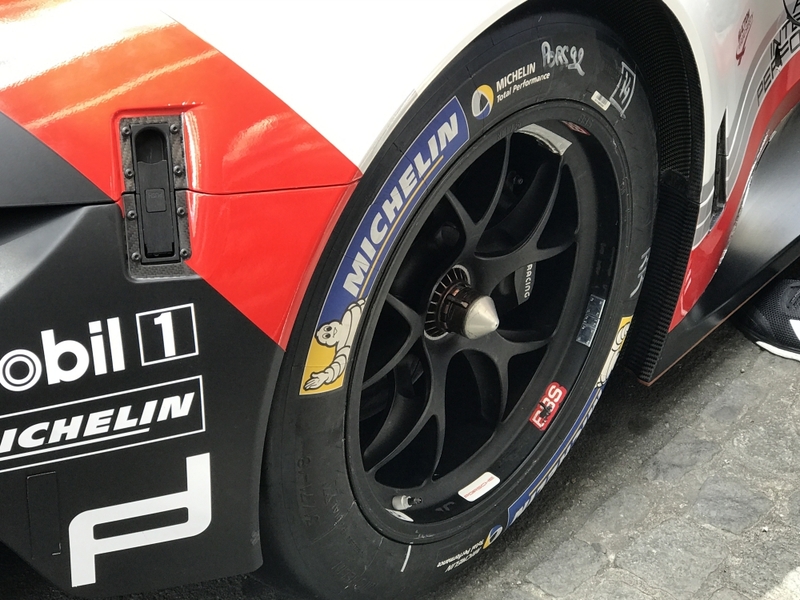 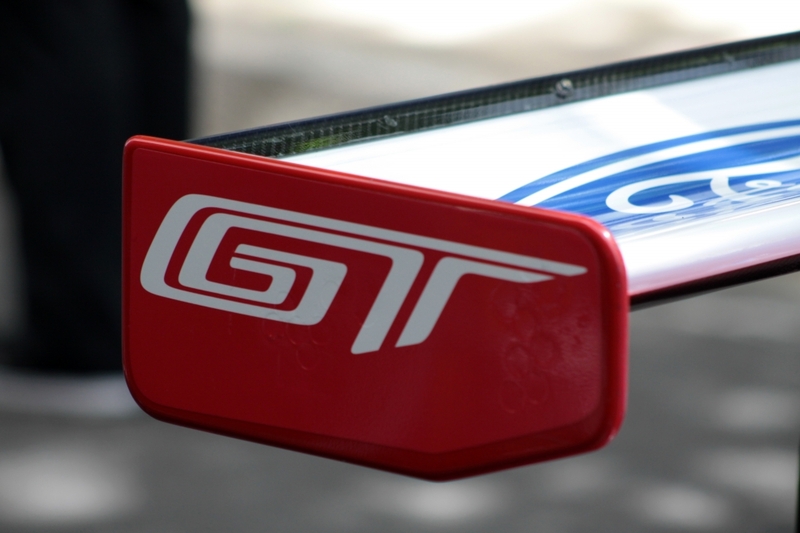 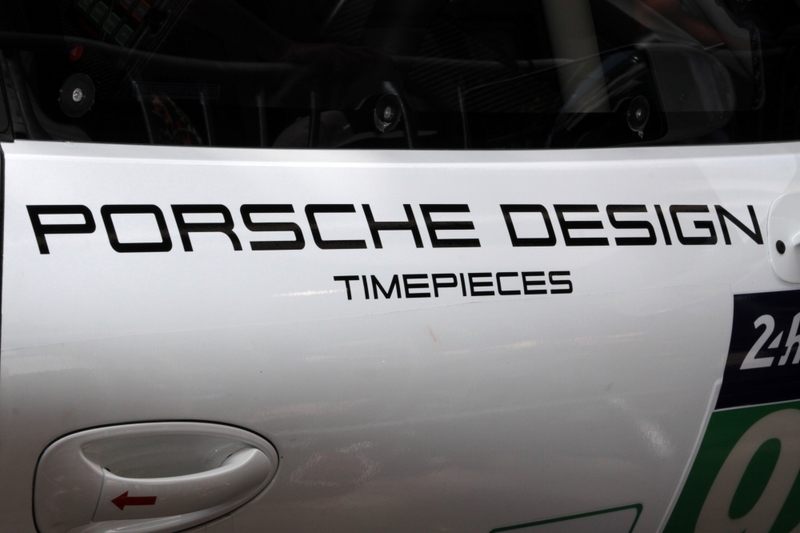 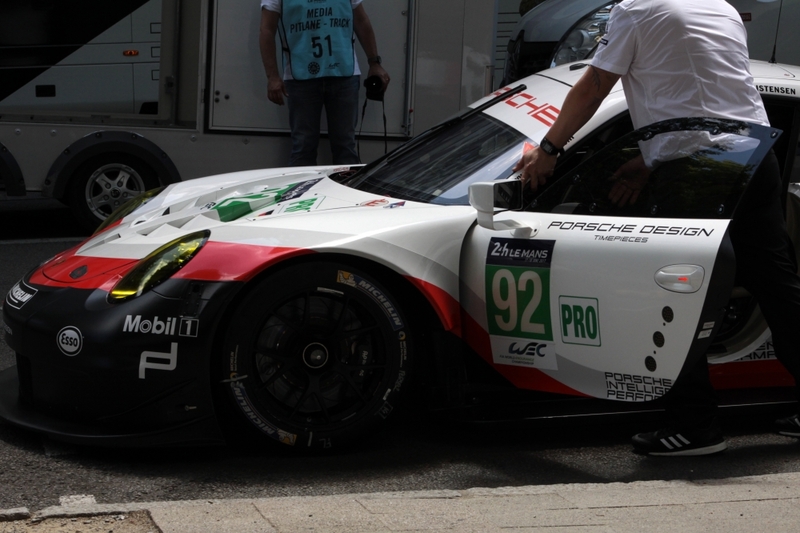 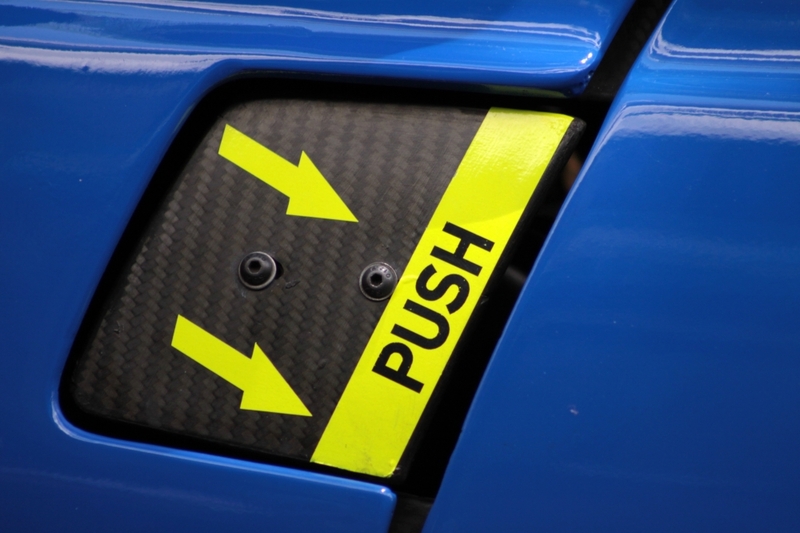 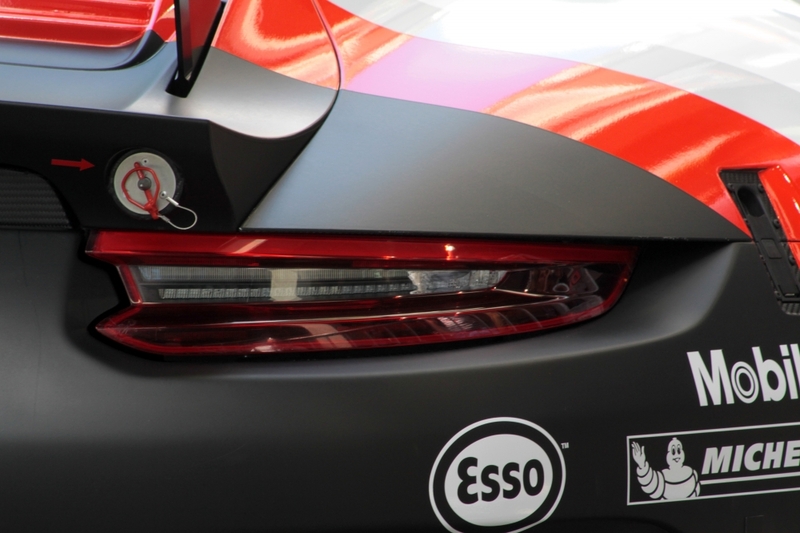 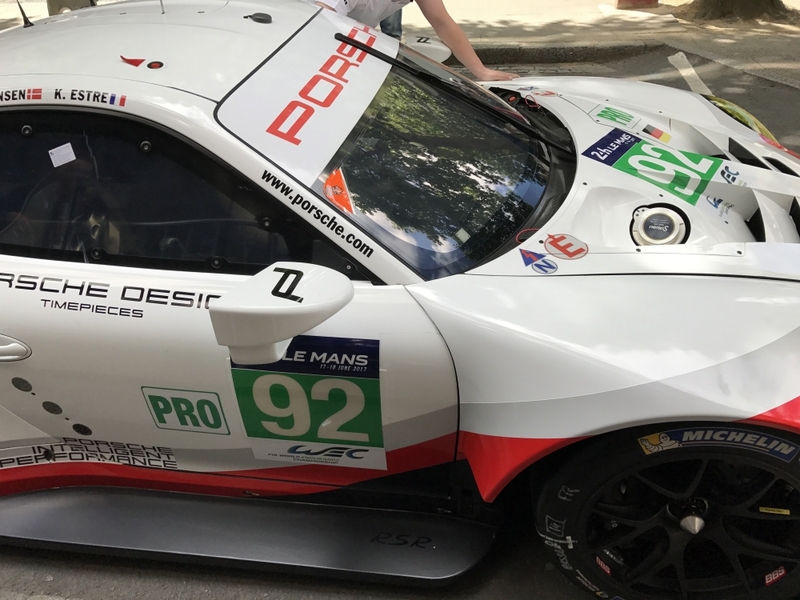 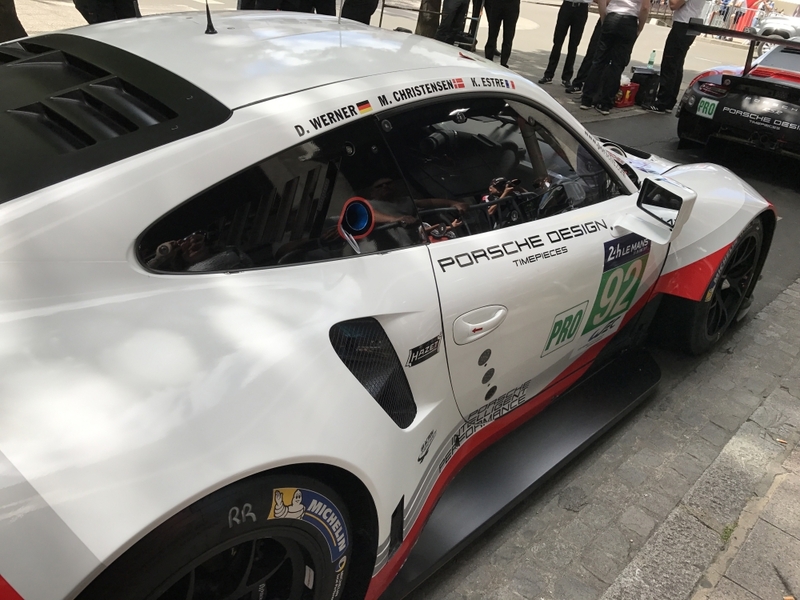 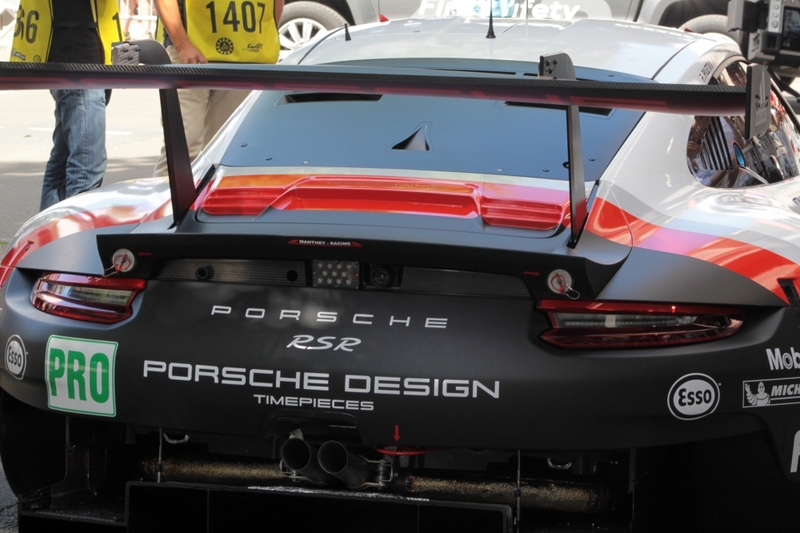 In fact, after our parking travails, most of the morning arrivals had already moved into the scrutineering area but we were right on the spot for the arrival of the works Porsche GTEs. 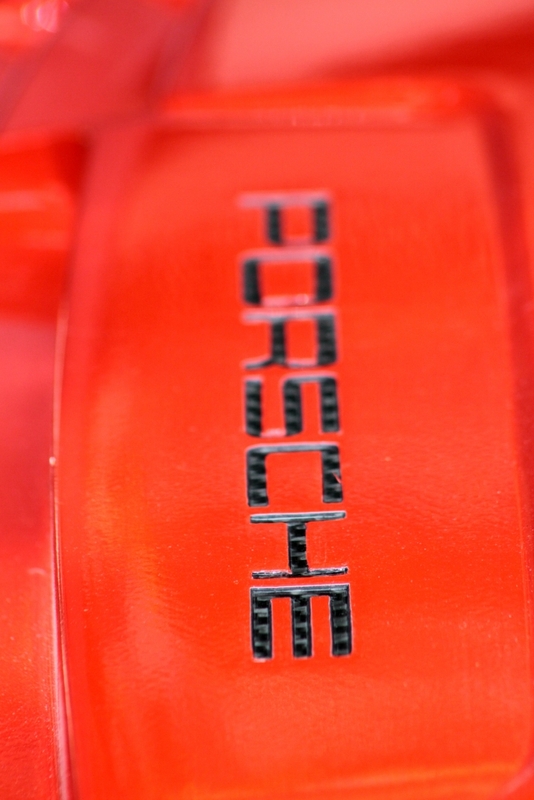 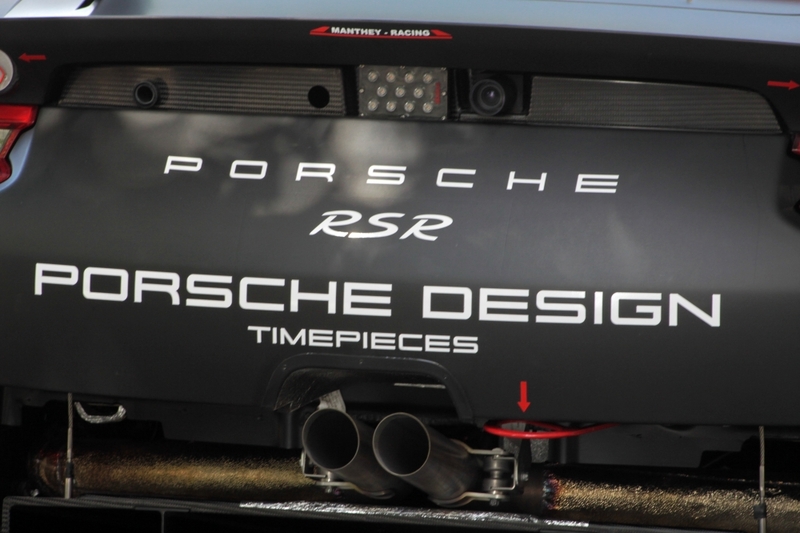 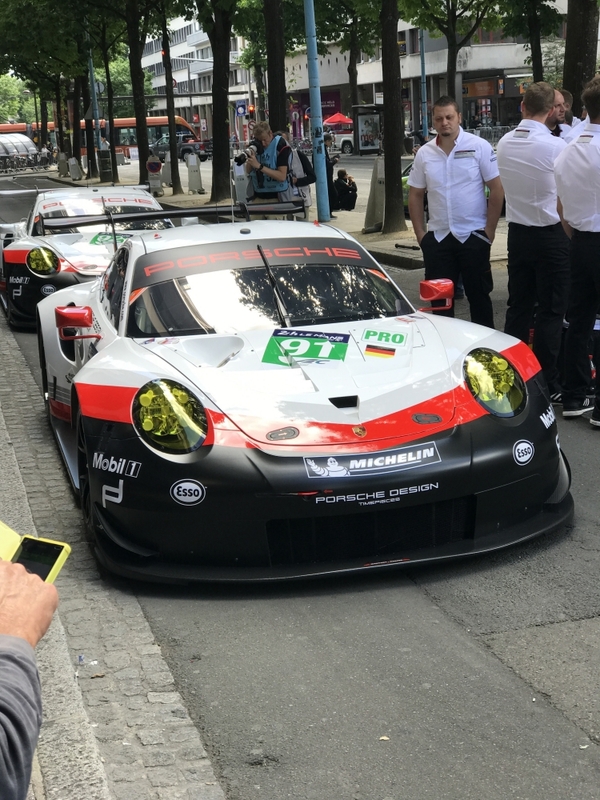 I freely admit (and always have) that like James, I'm a prototype man, but there was something just so right about the look of the Porsches. 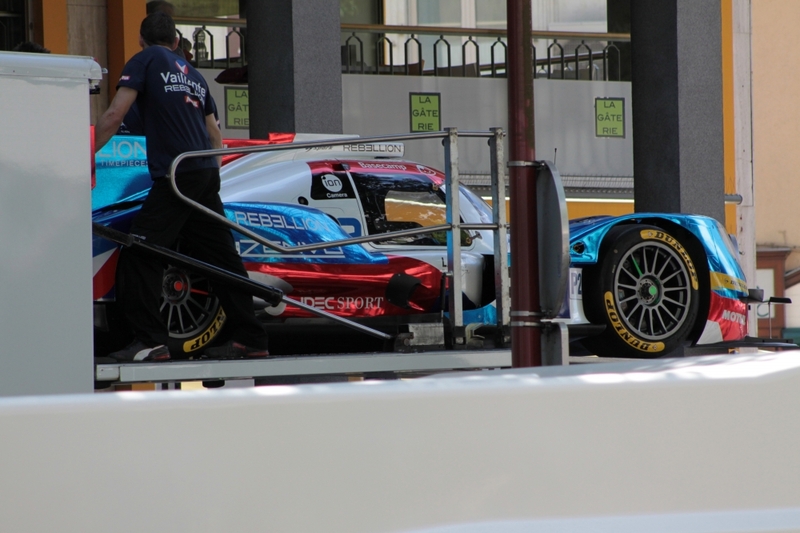 They looked superb, very purposeful somehow, as if they really intended to do the business. 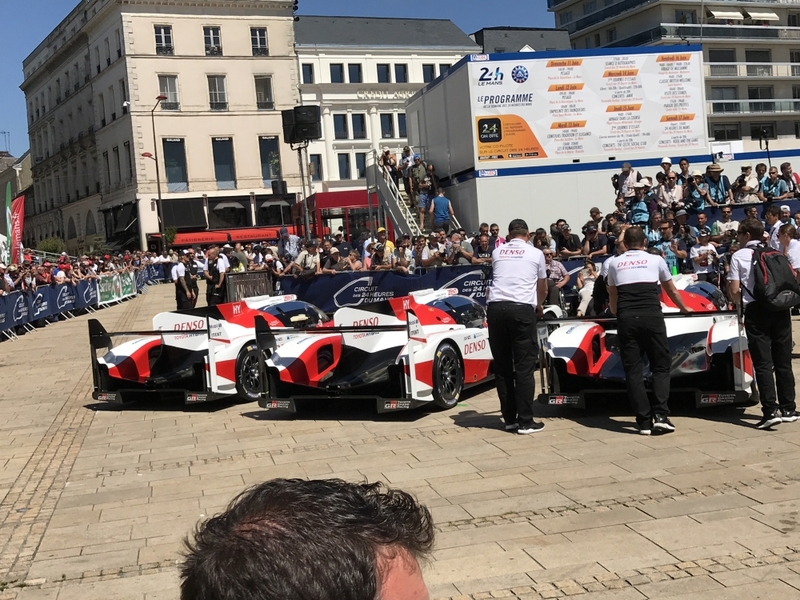 They were due to be the first cars in after the lunch break between 12.30 and 13.00. 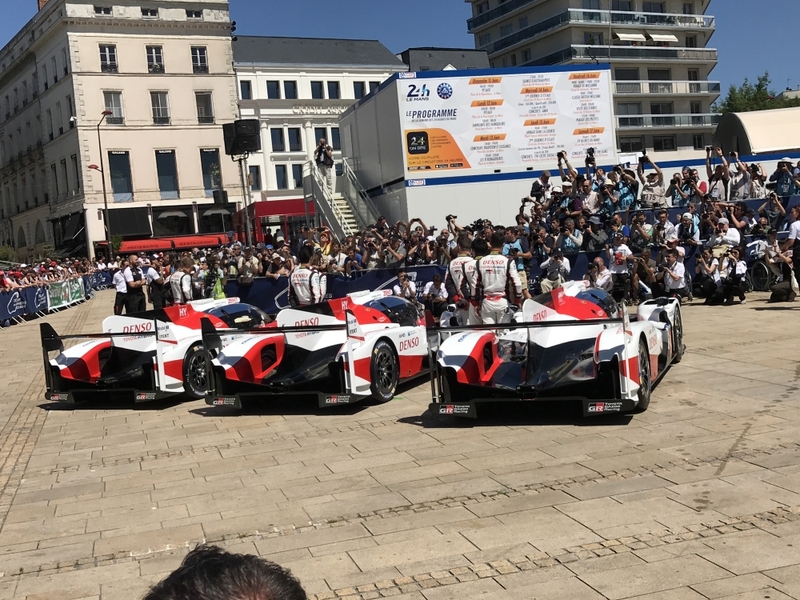 As the day drew on we decided to make a final tour of the square and happily as we did so the Toyotas emerged and were preparing for their photocall. 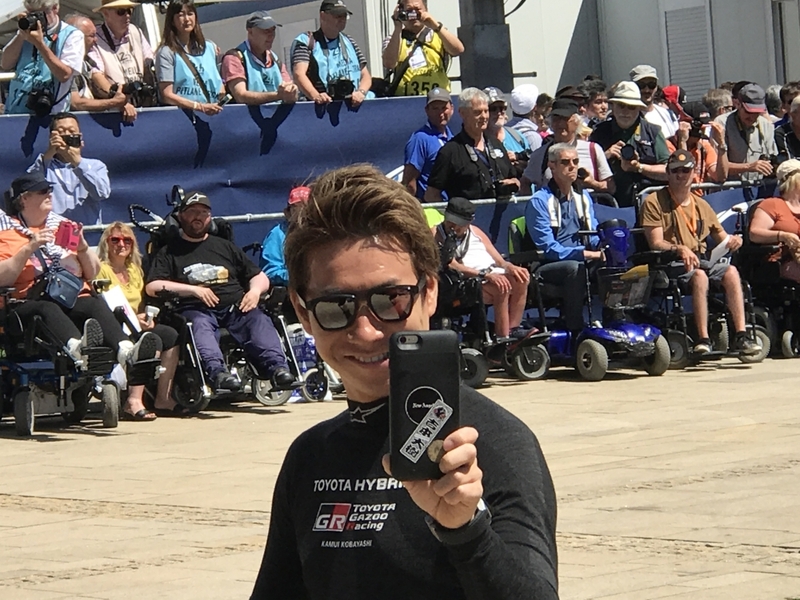 As it happens, this turned out to be one of the highlights of the day and one of the highlights of the week as far as I was concerned, thanks to one Kamui Kobayashi.... 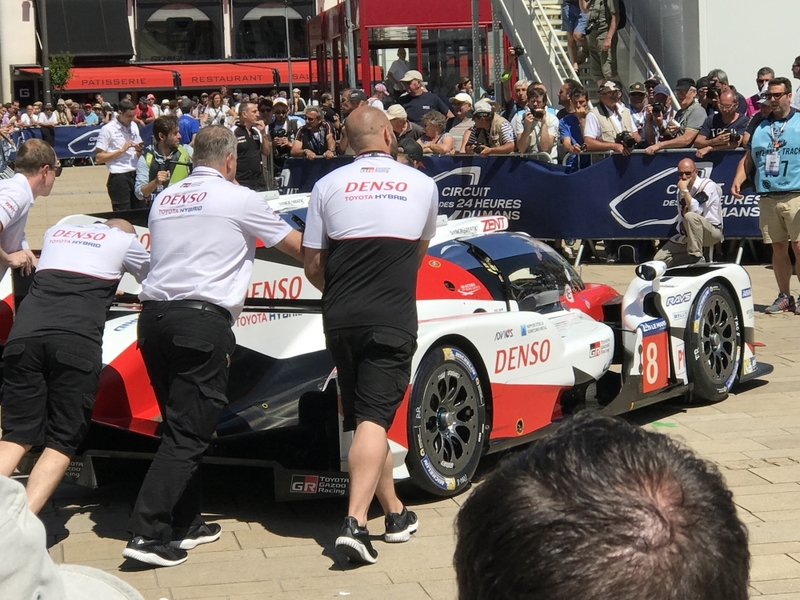 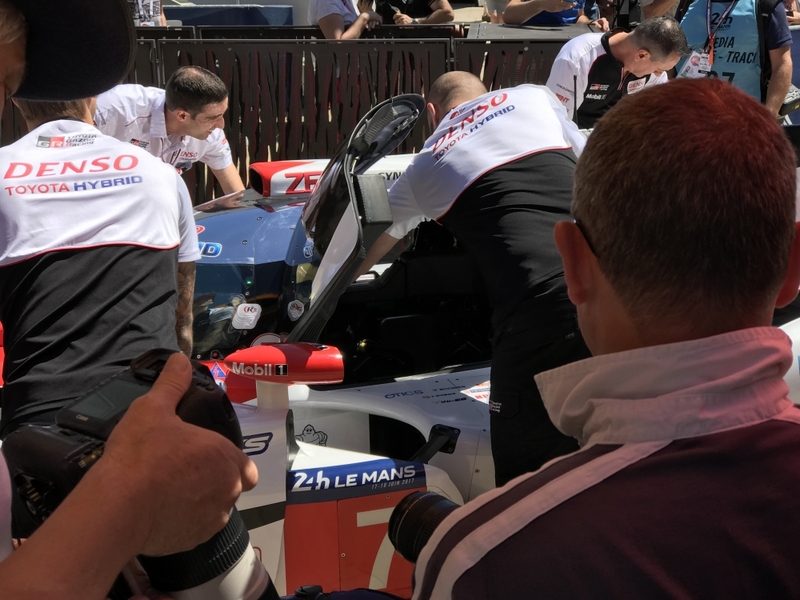 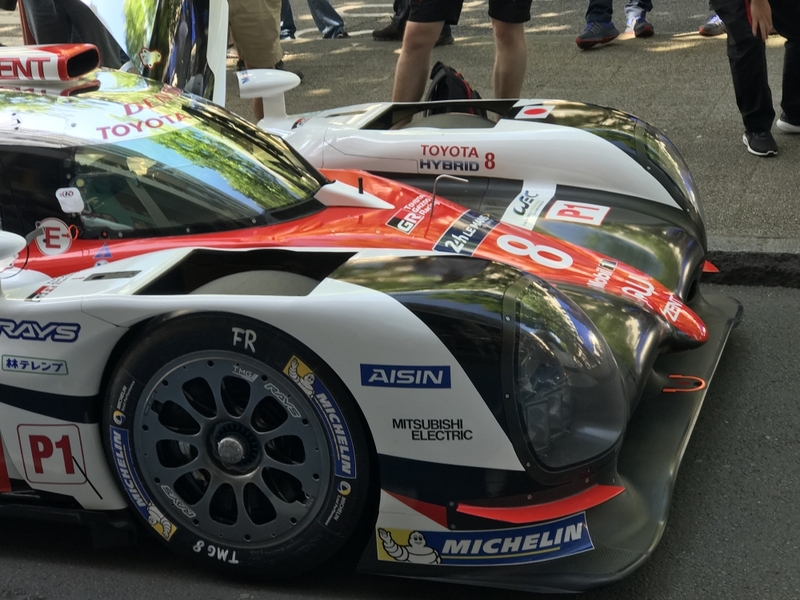 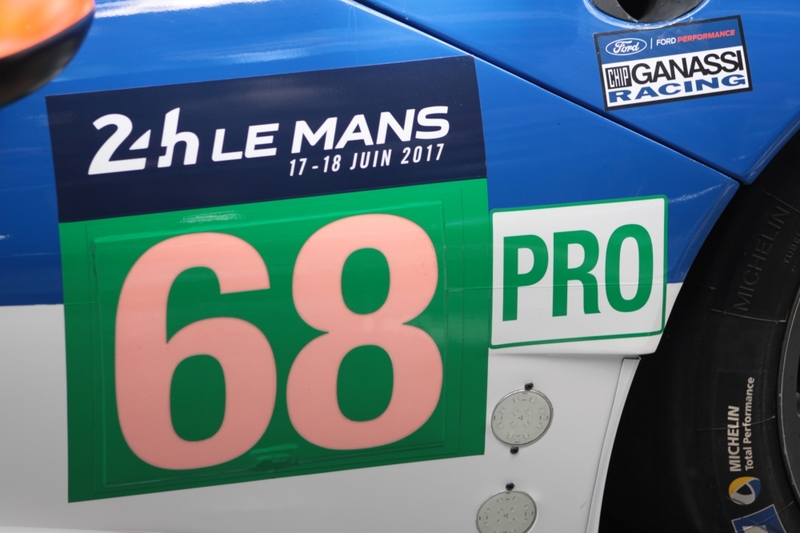 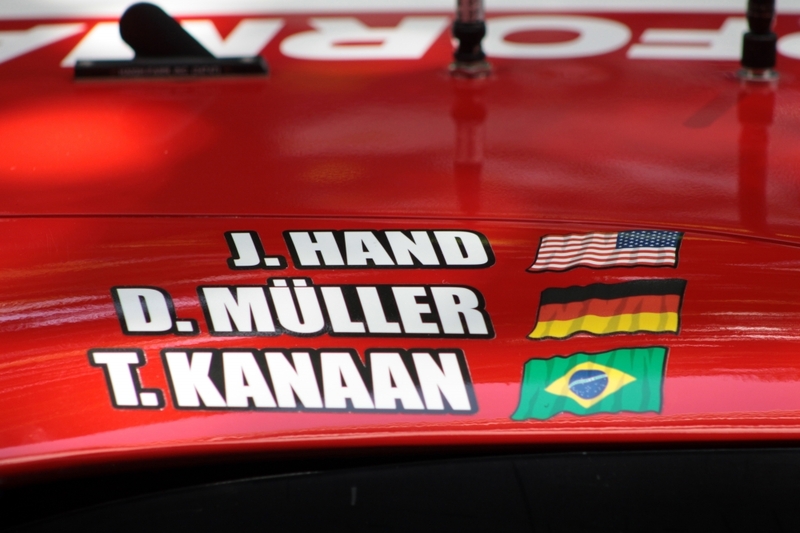 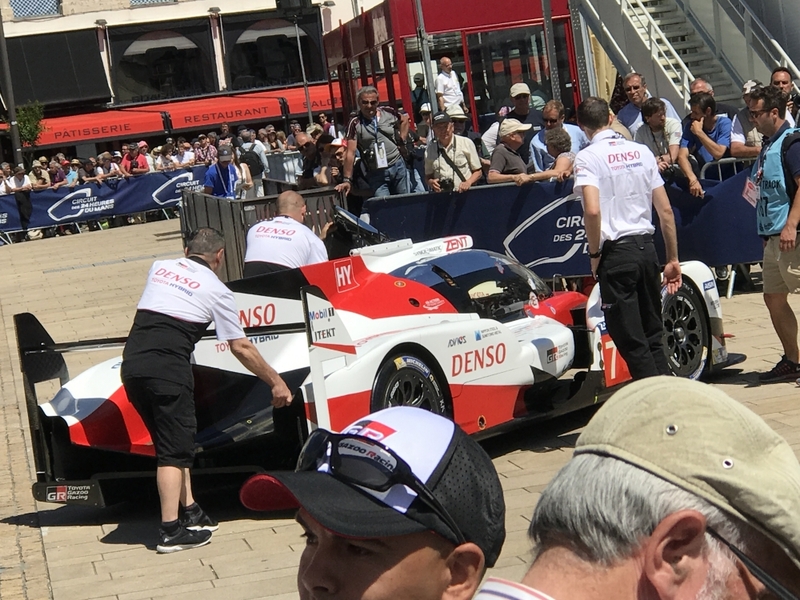 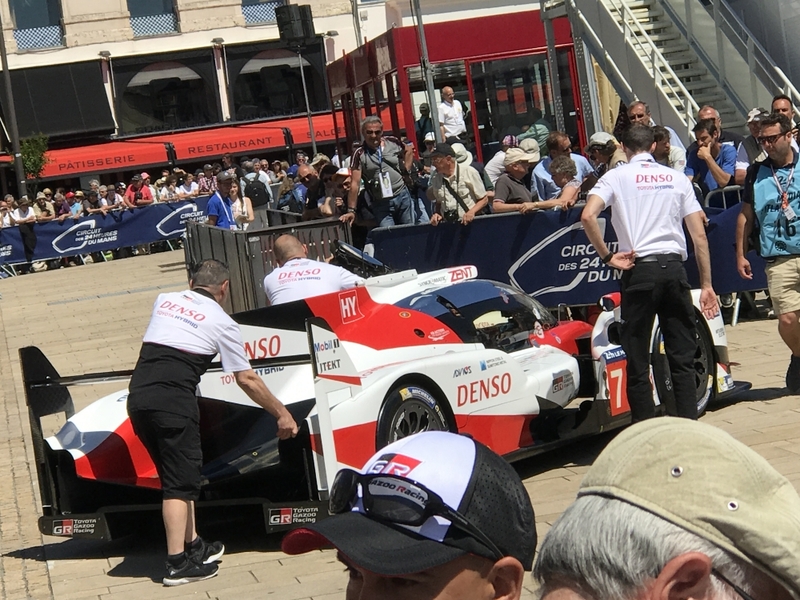 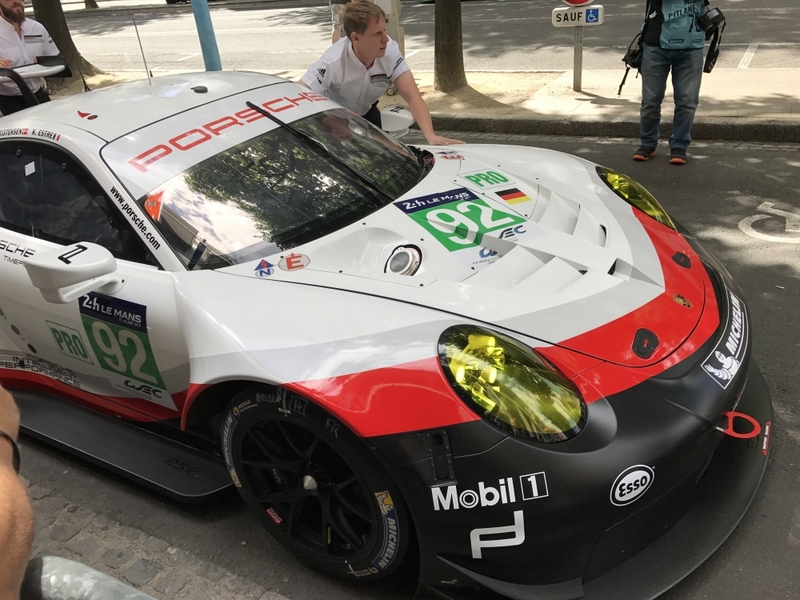 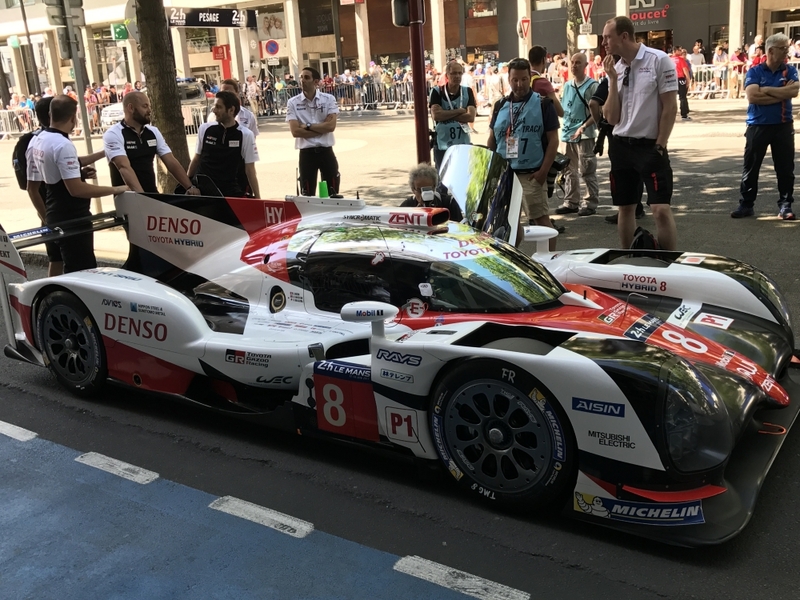 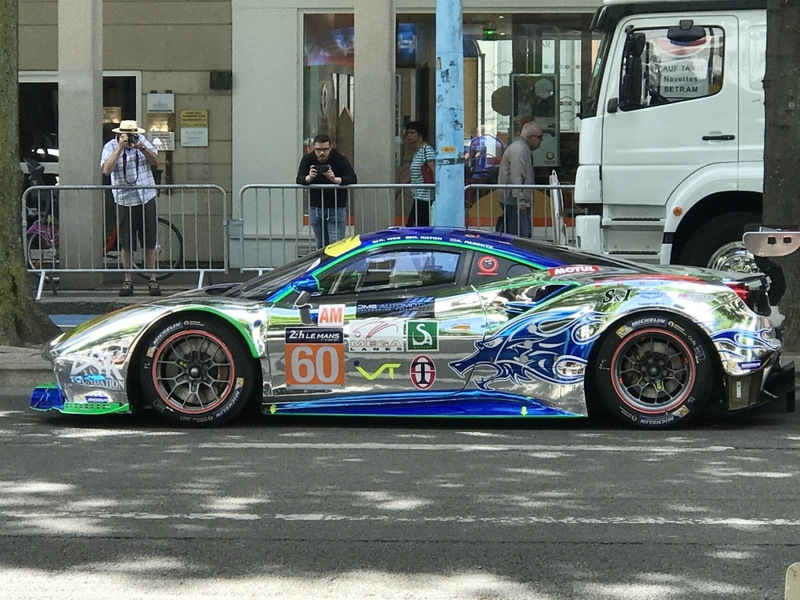 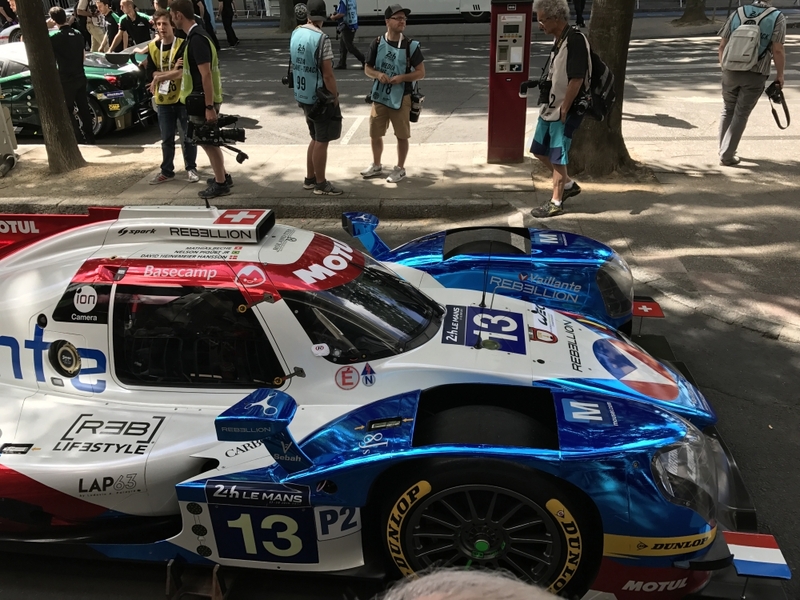 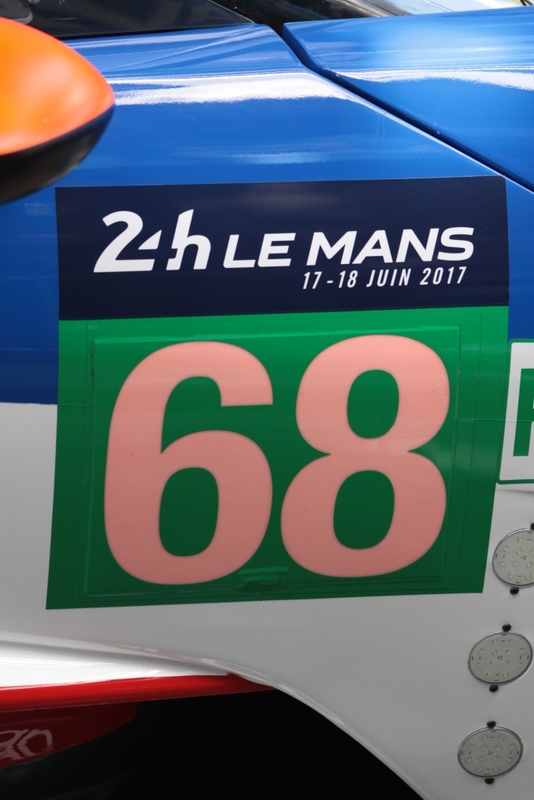 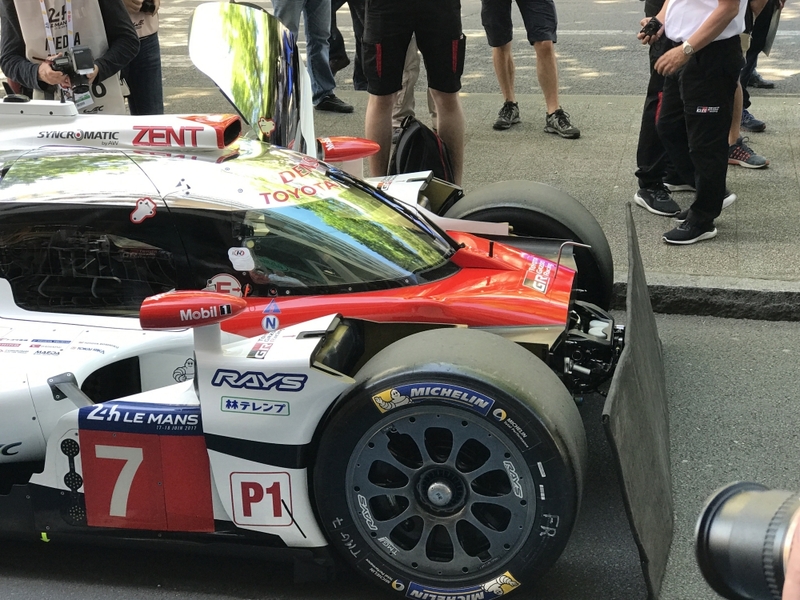 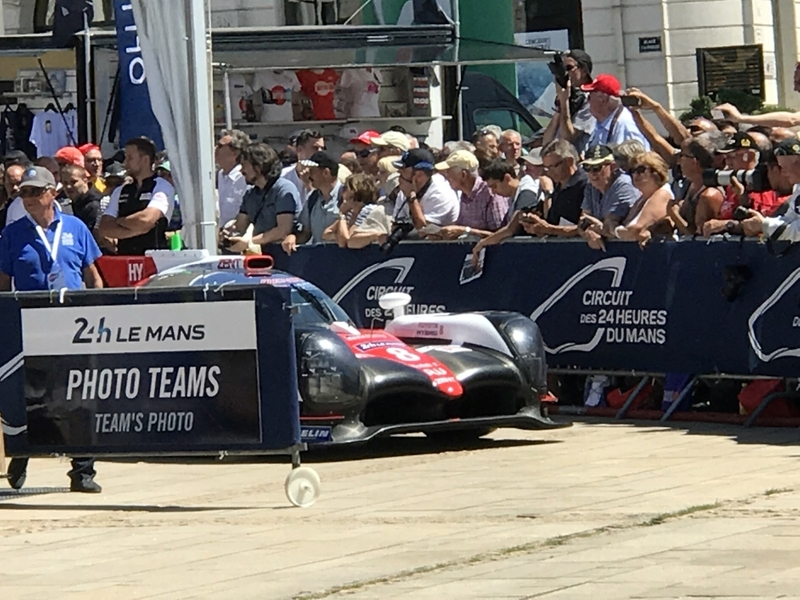 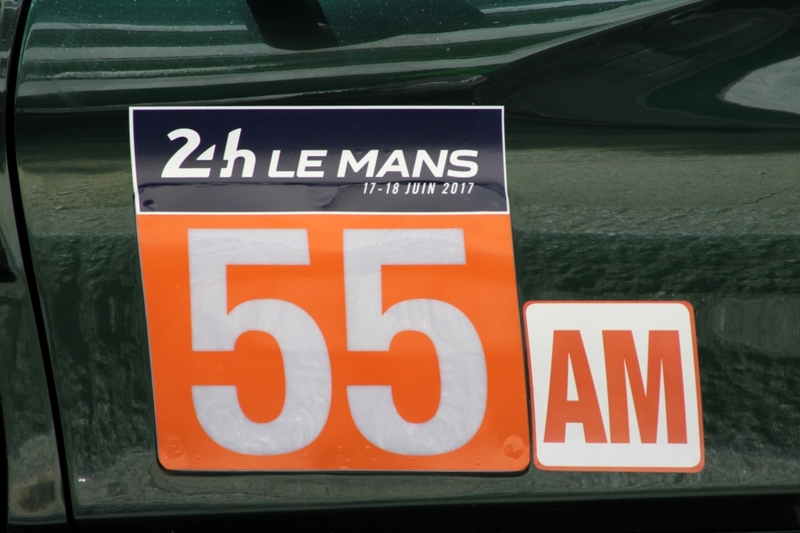 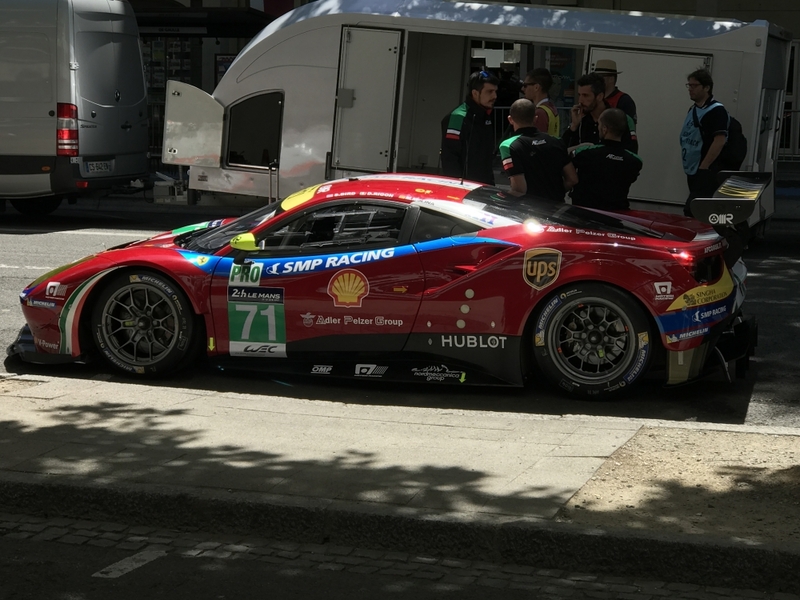 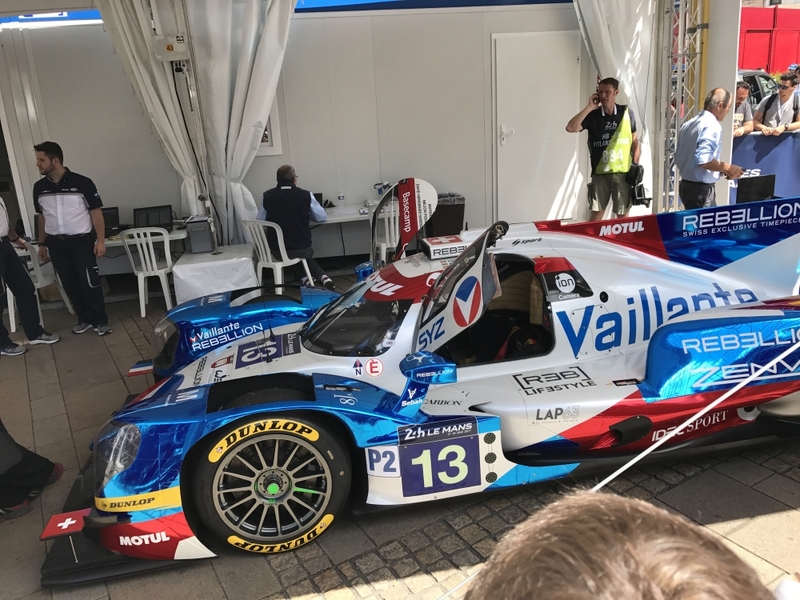 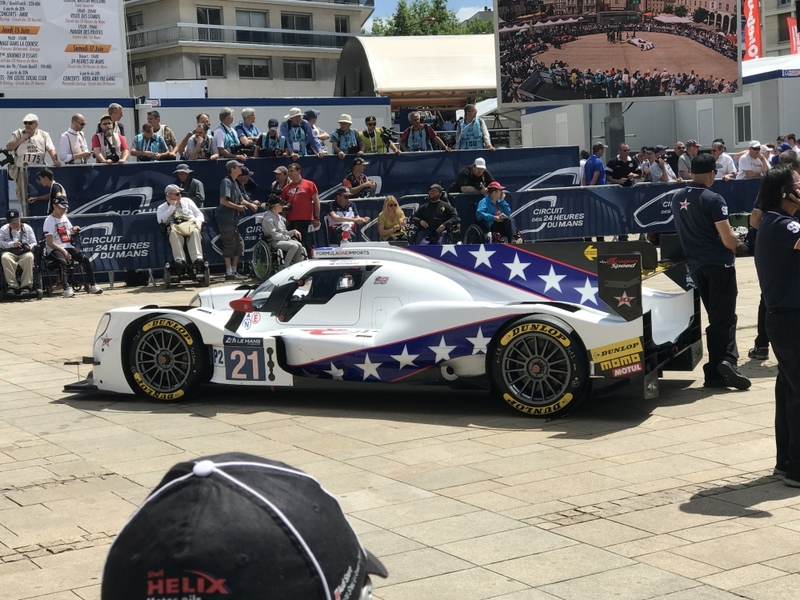 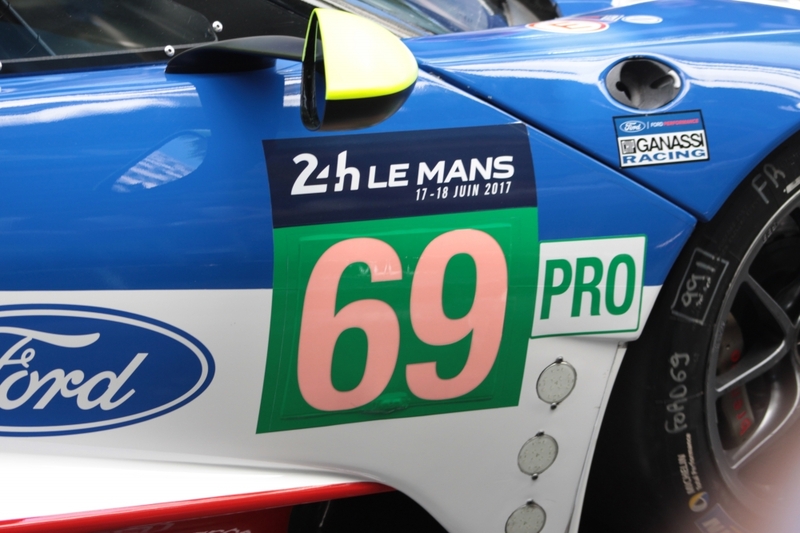 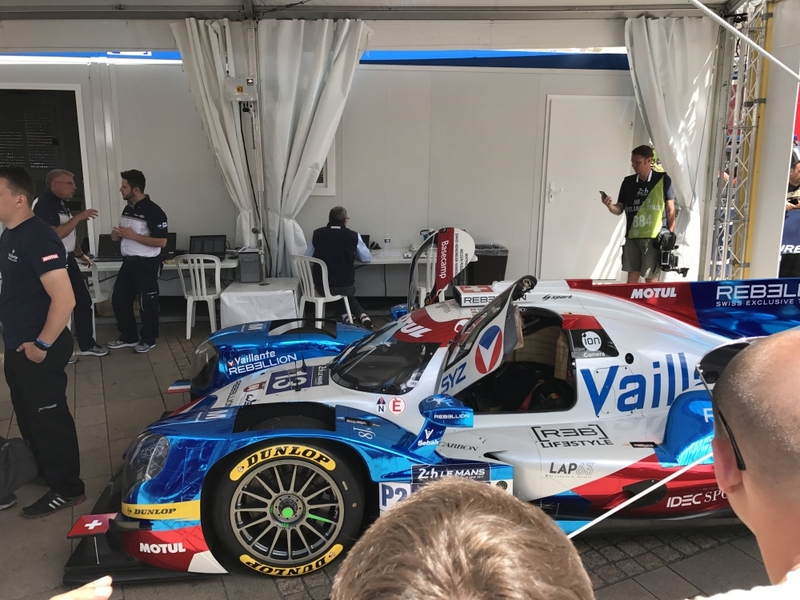 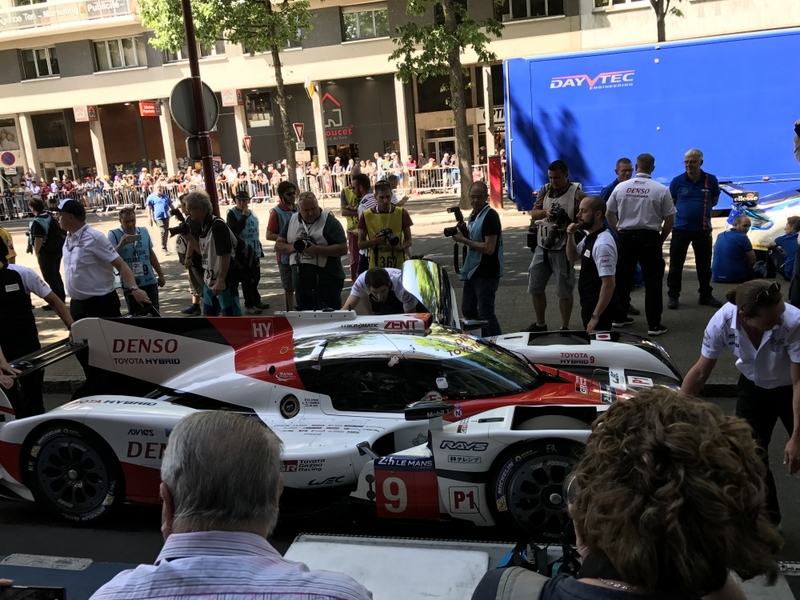 Le Mans is a terrific event for the fans, something I understood from my first visit in 1986, but I've appreciated it all the more since I started attending for the full week. 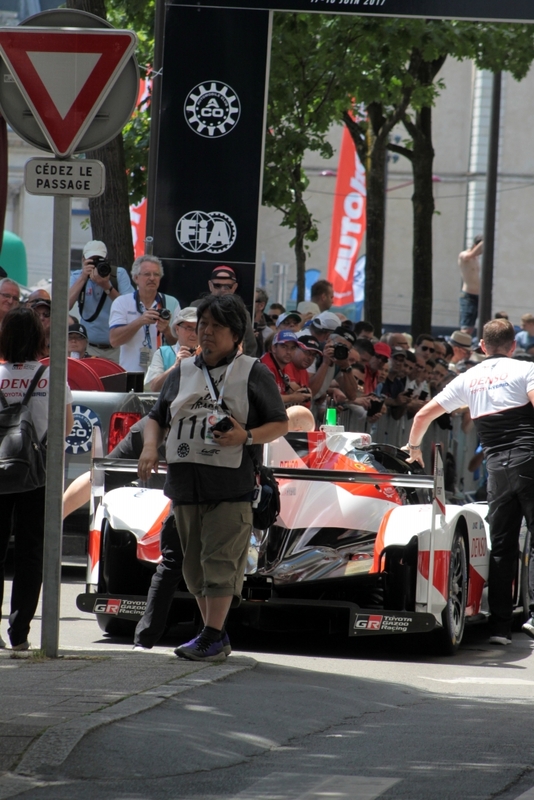 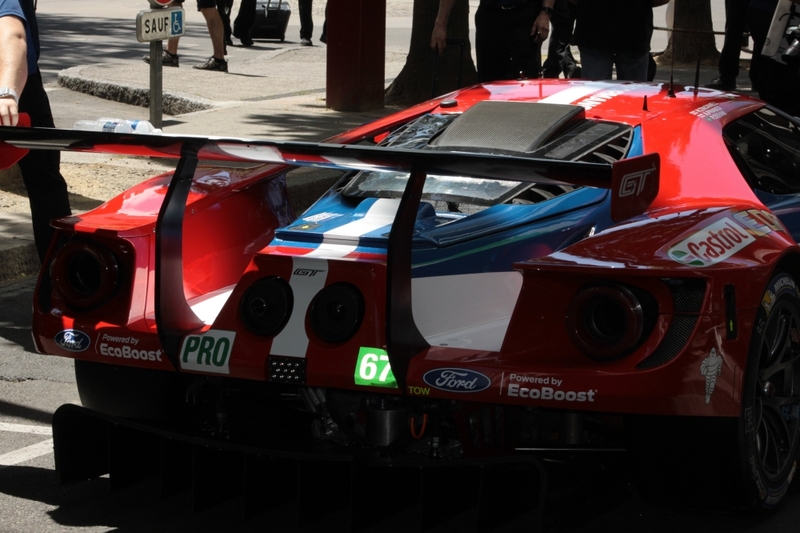 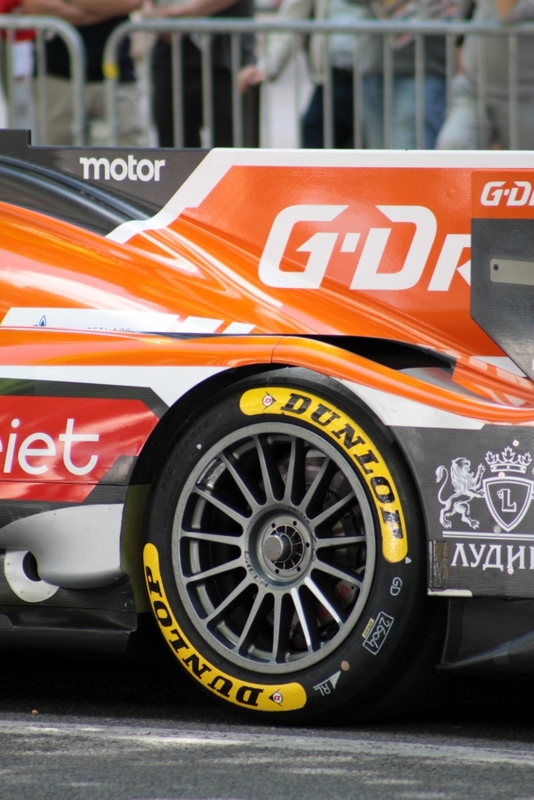 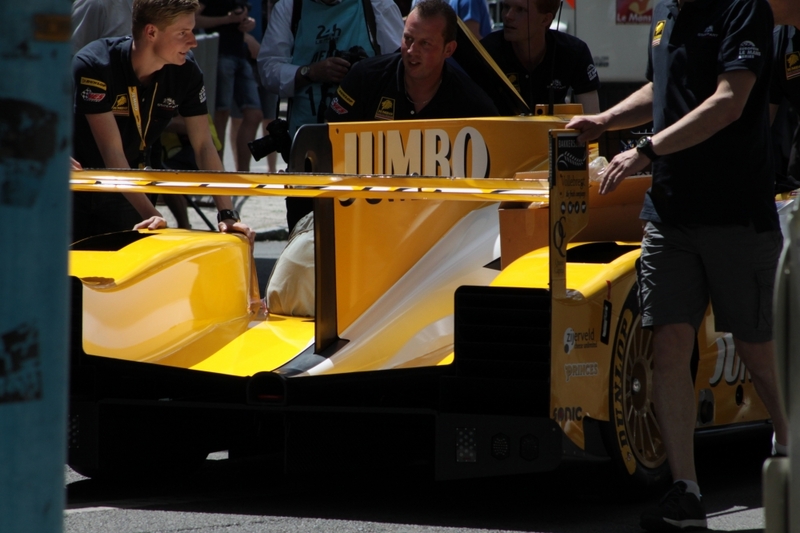 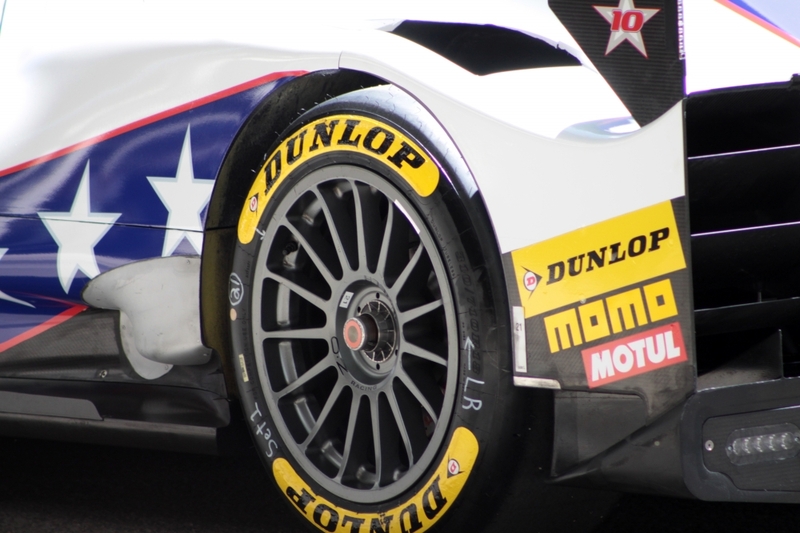 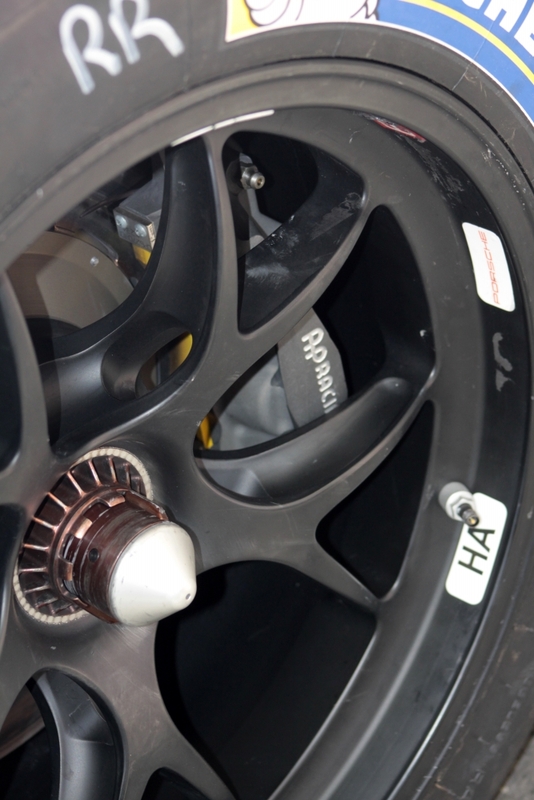 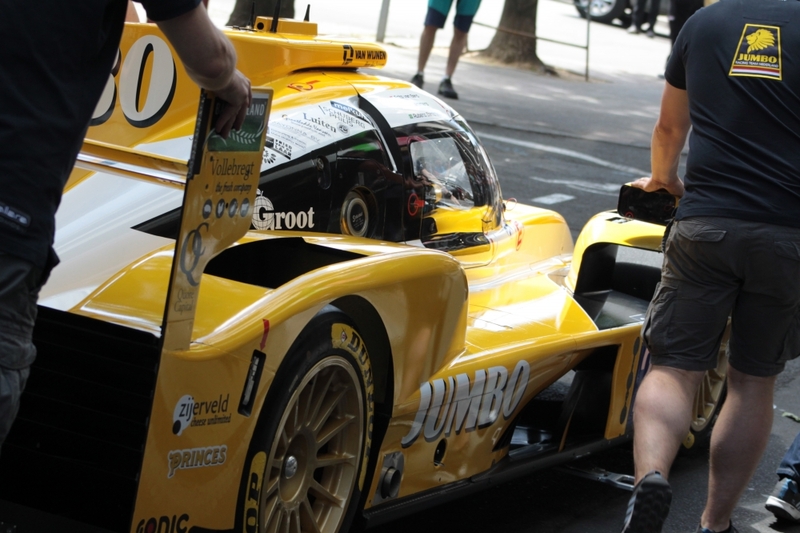 Scrutineering, the pit walks and the driver parade the evening before race day all add huge value for the fans. 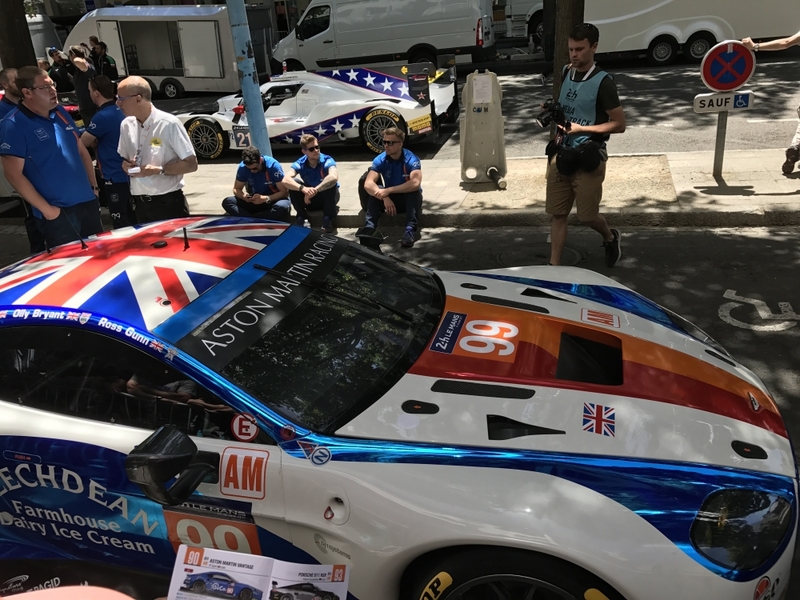 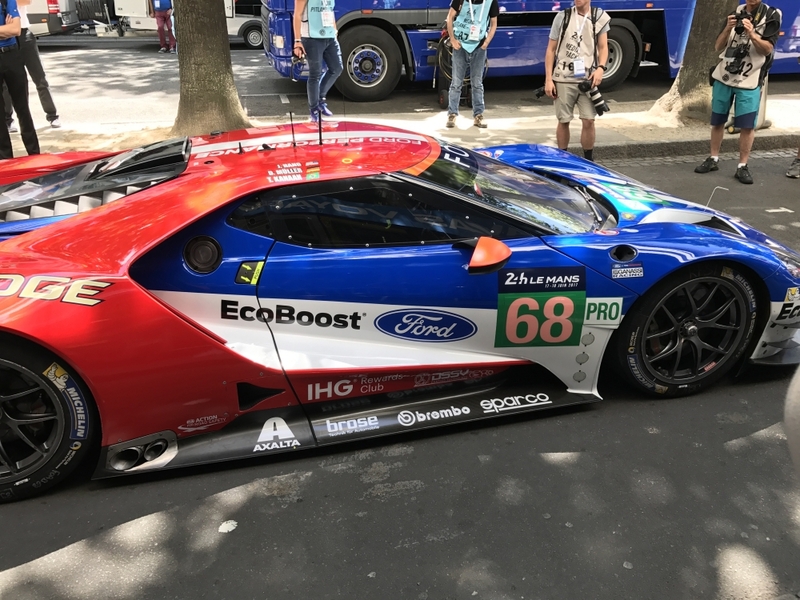 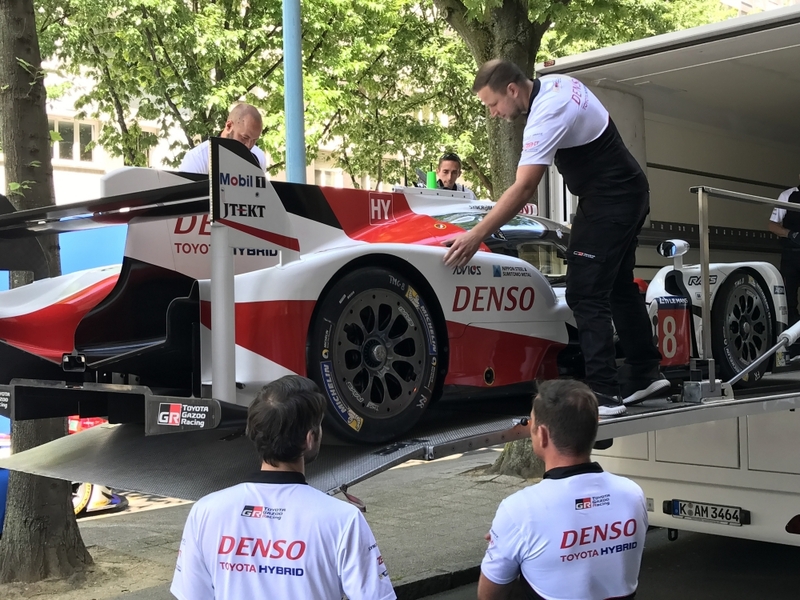 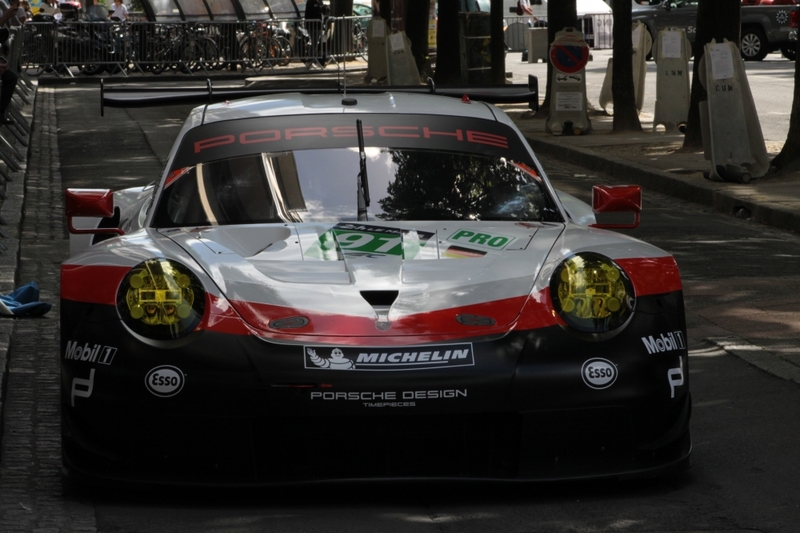 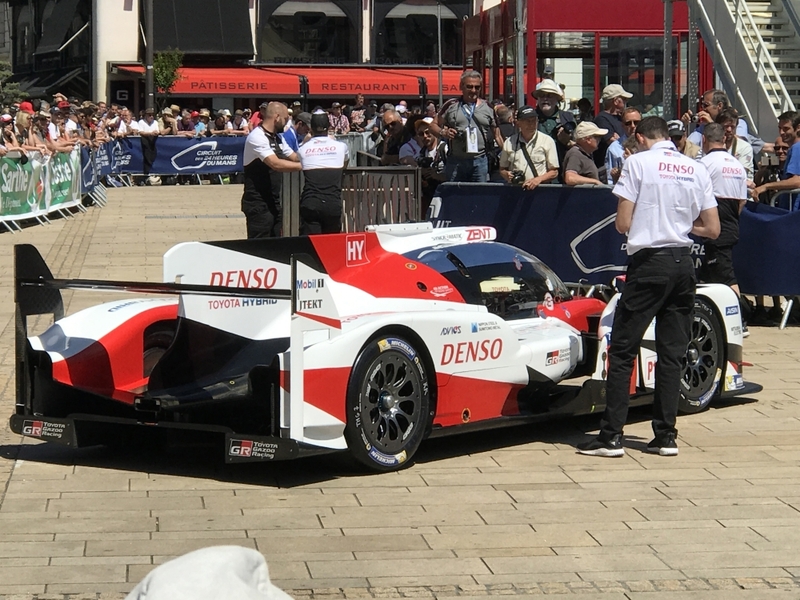 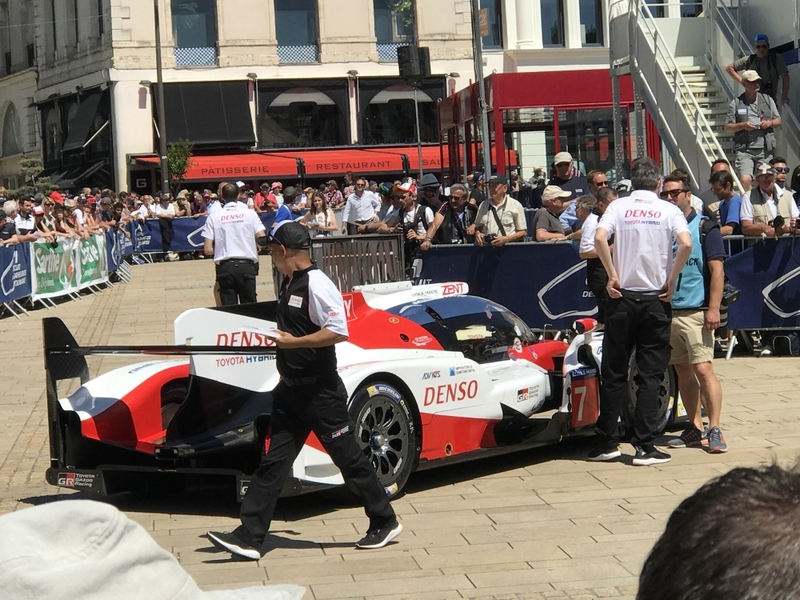 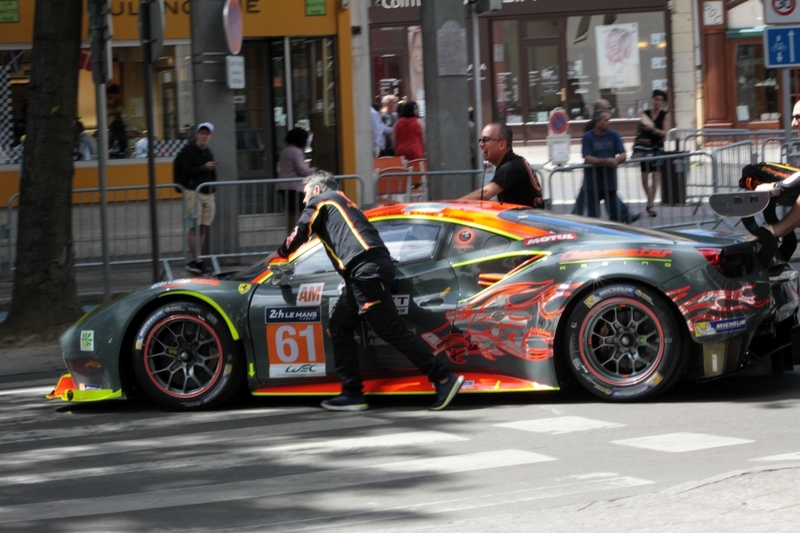 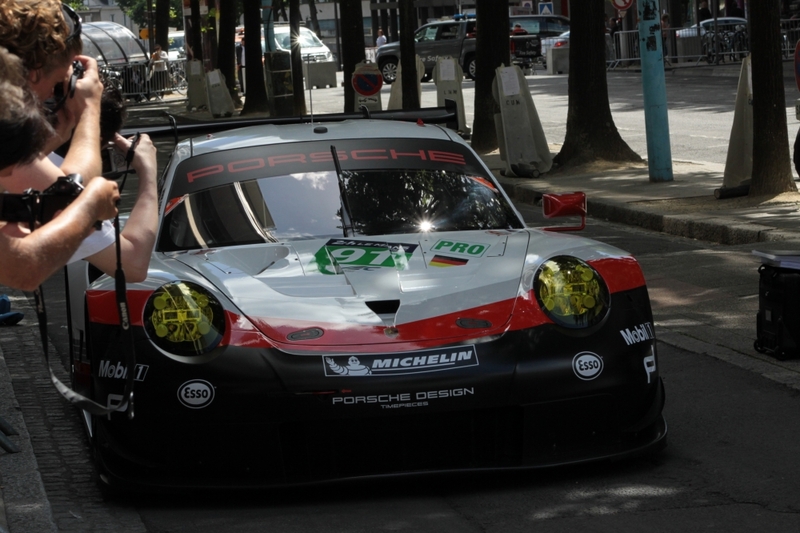 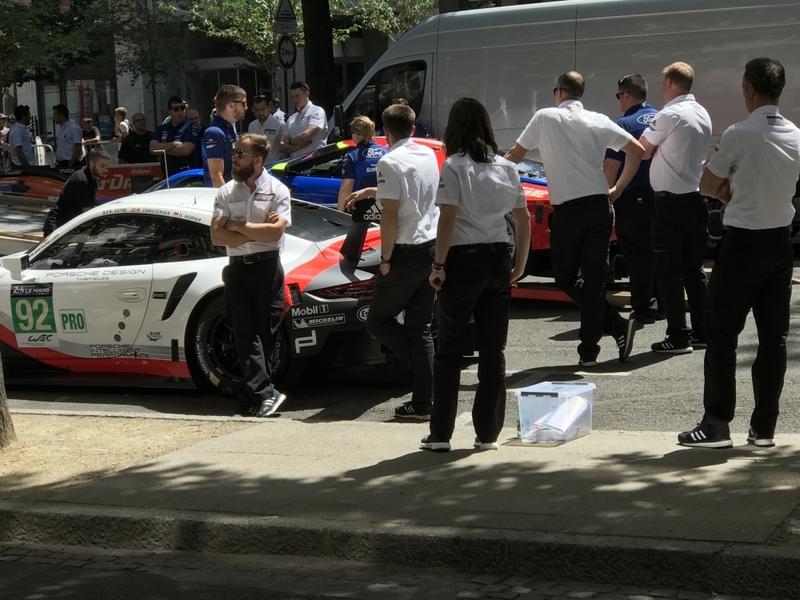 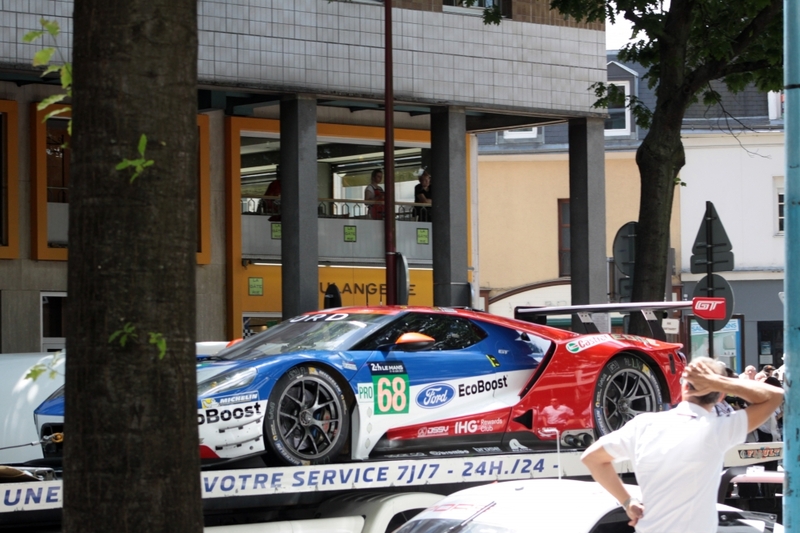 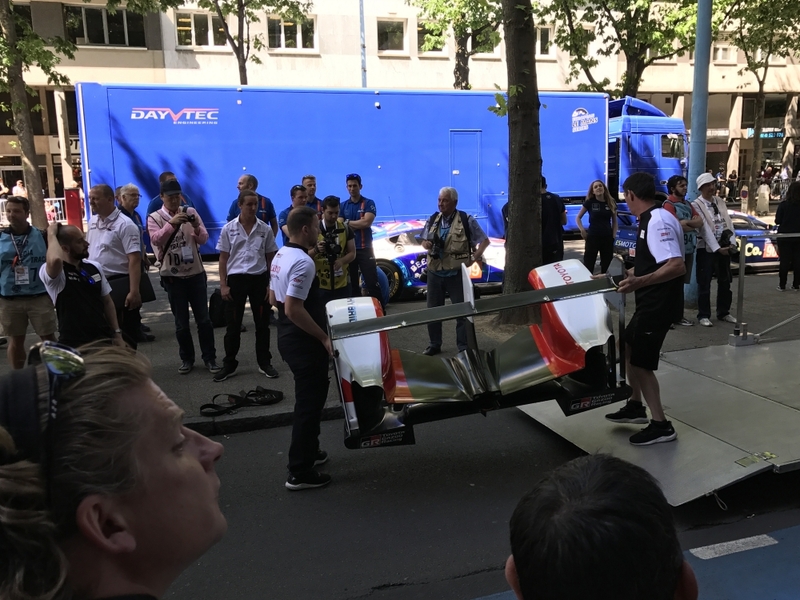 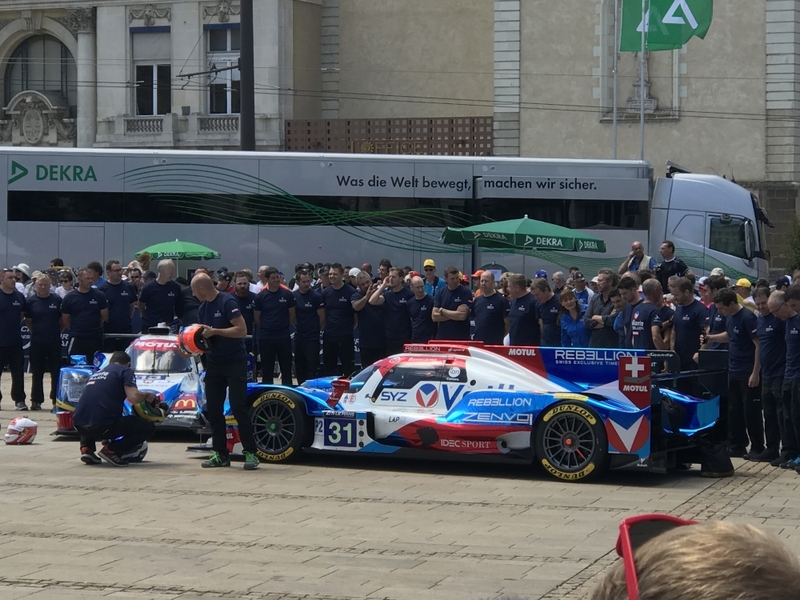 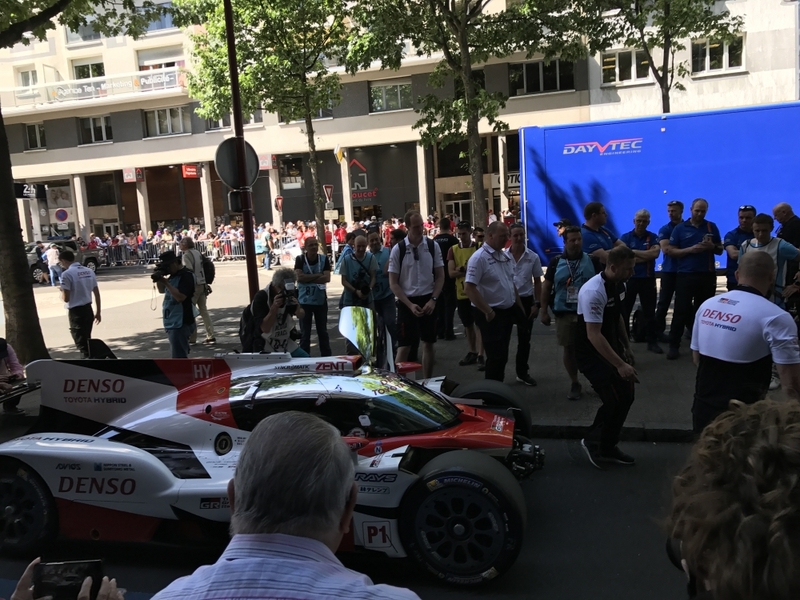 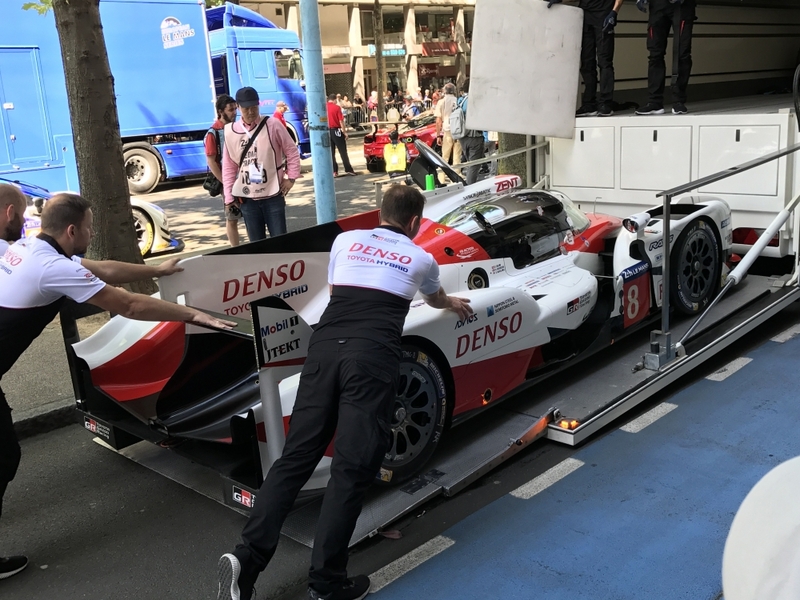 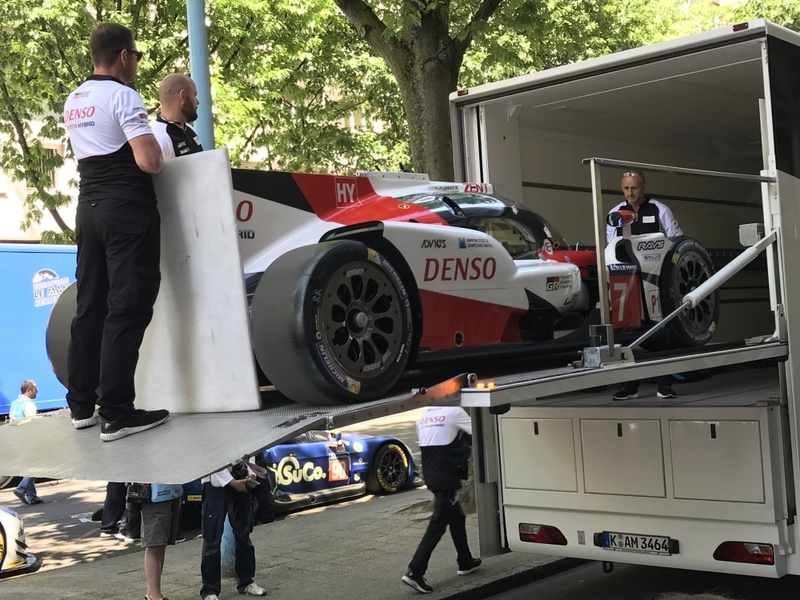 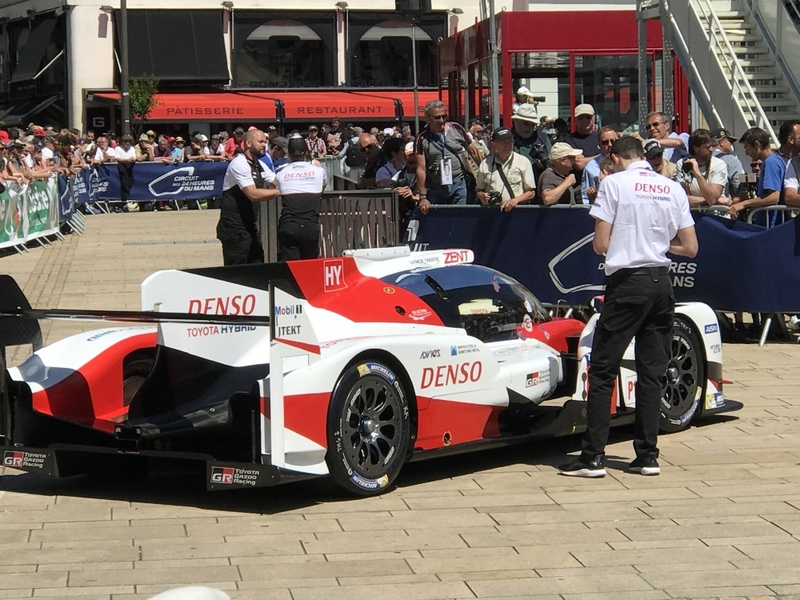 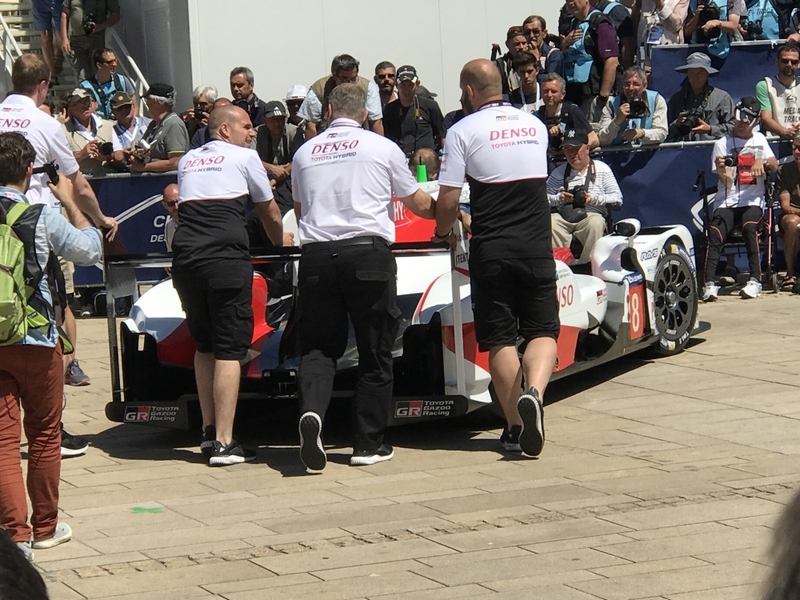 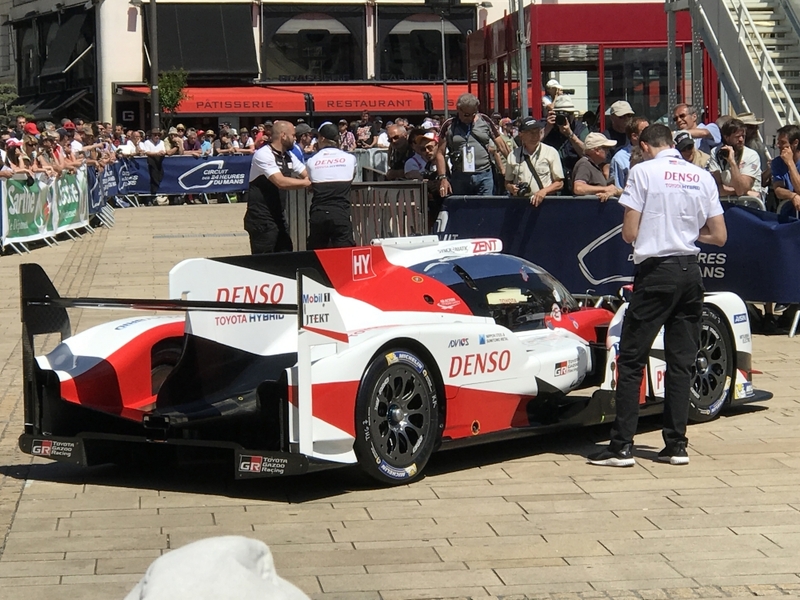 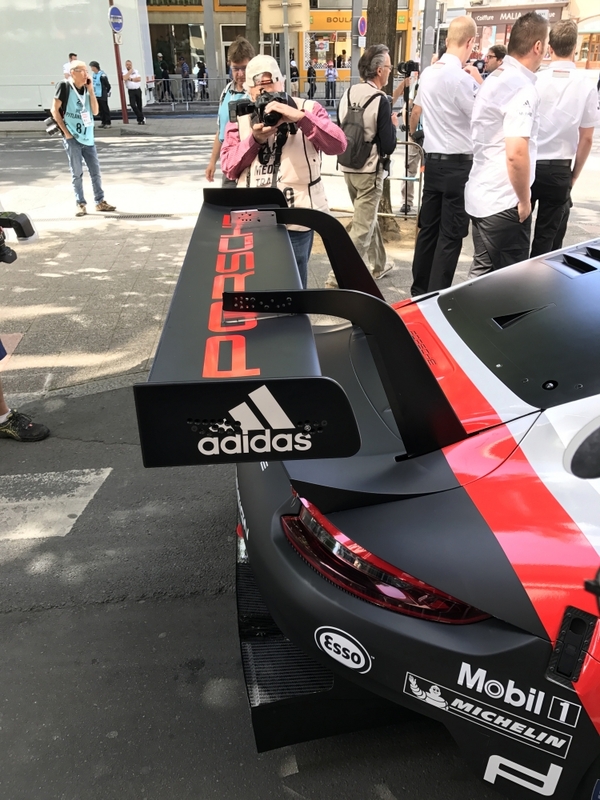 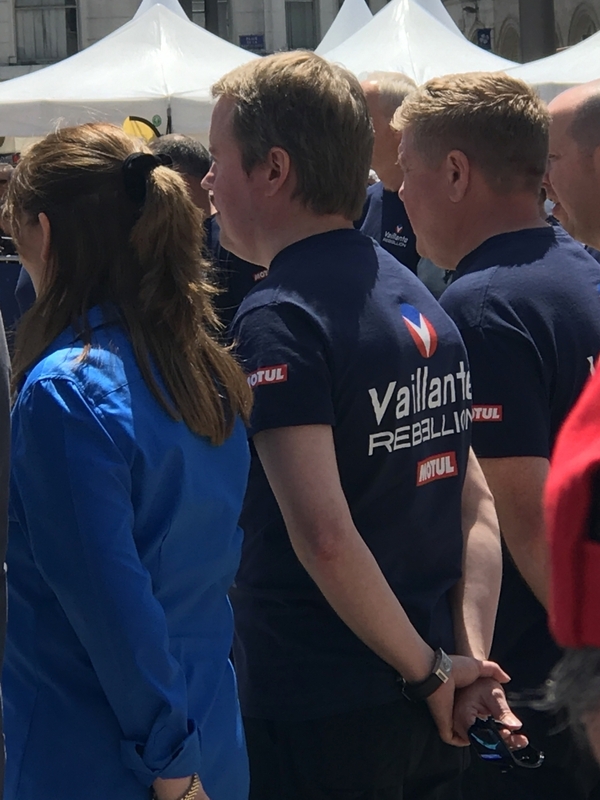 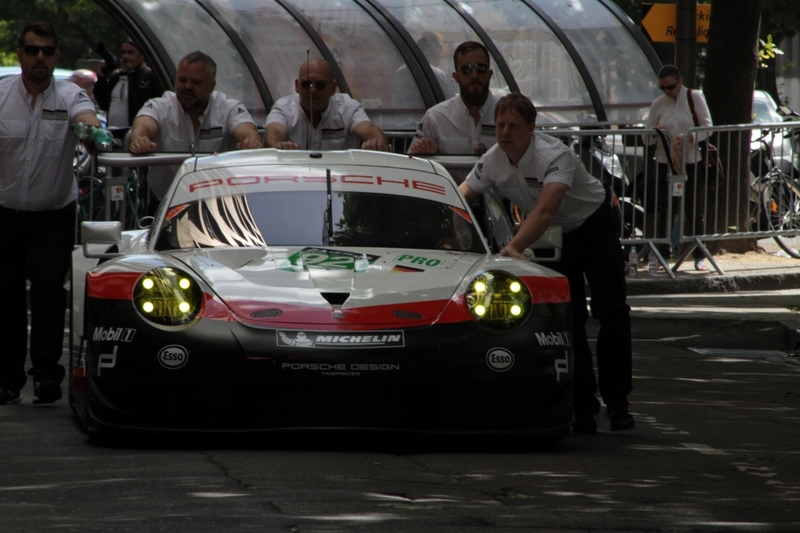 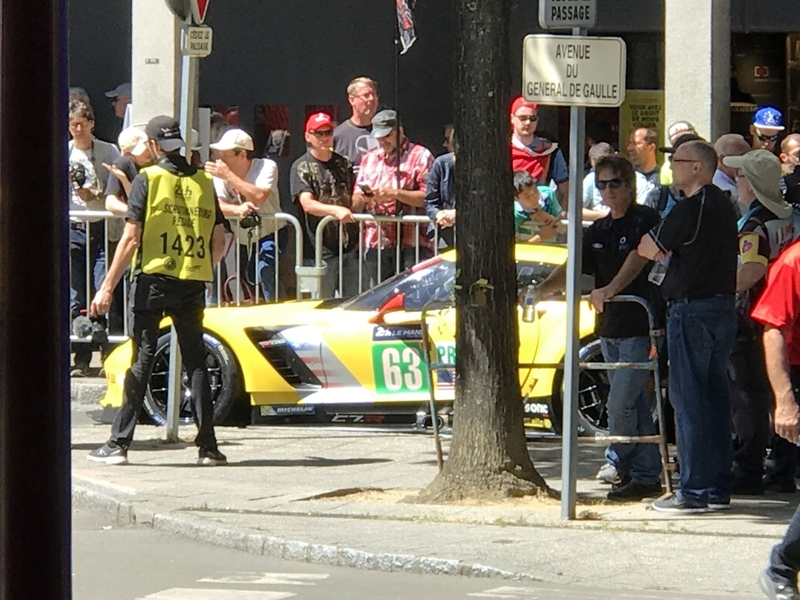 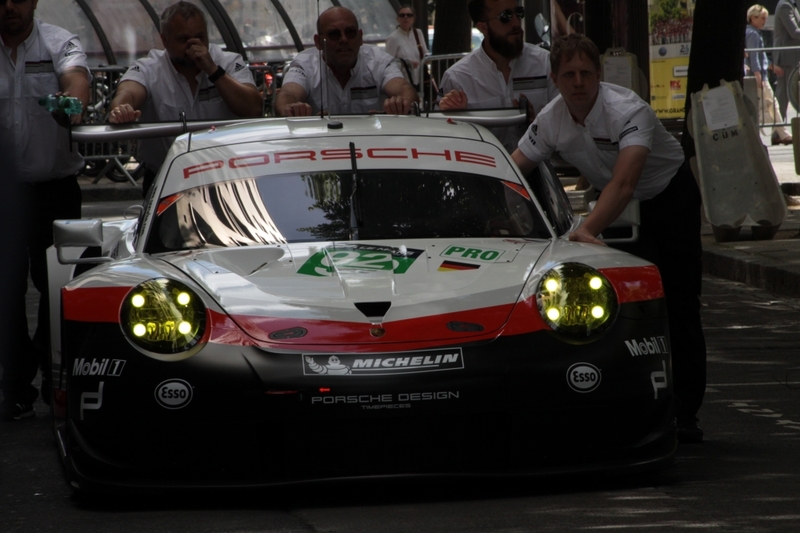 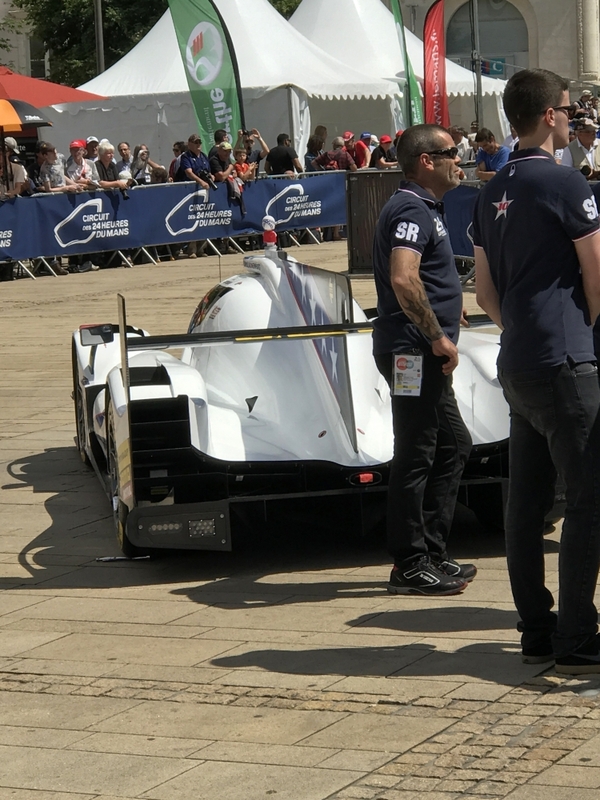 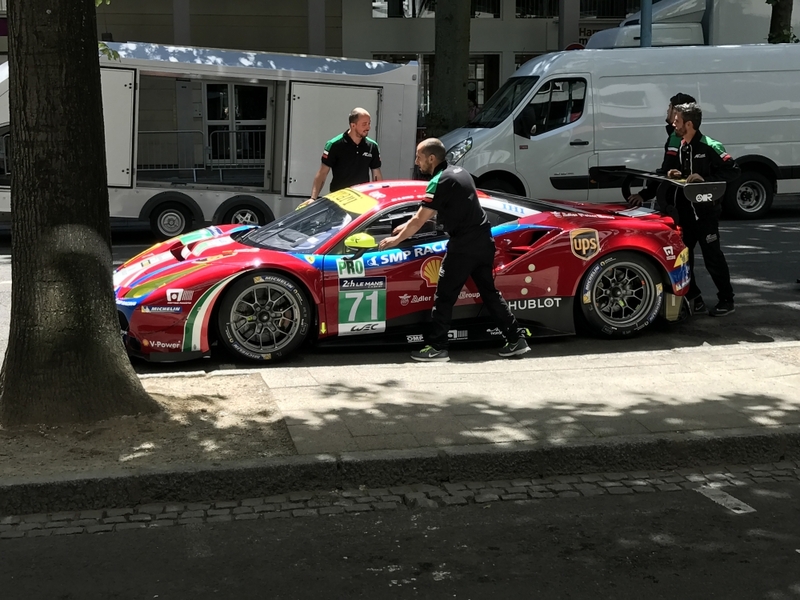 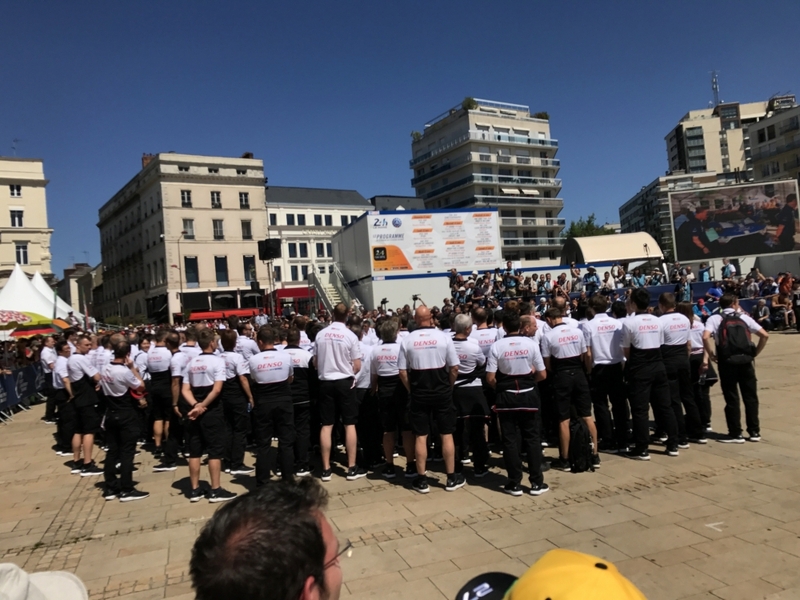 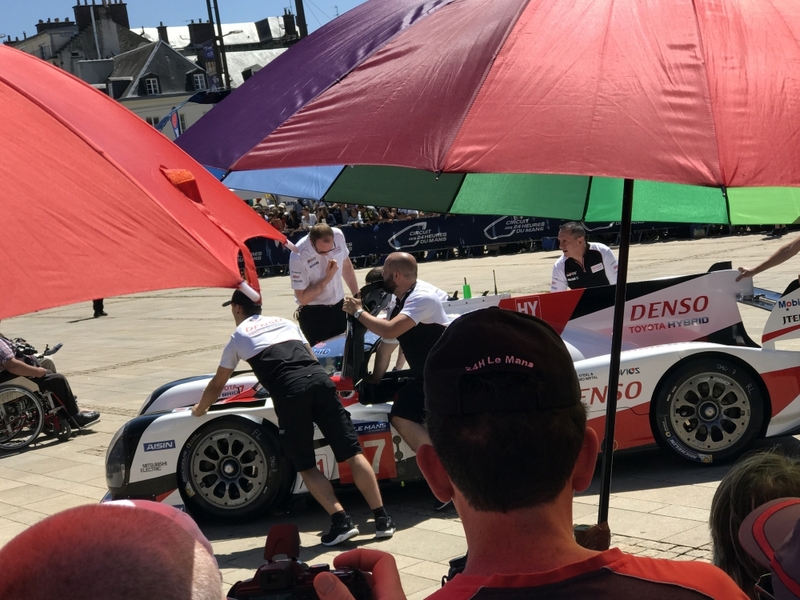 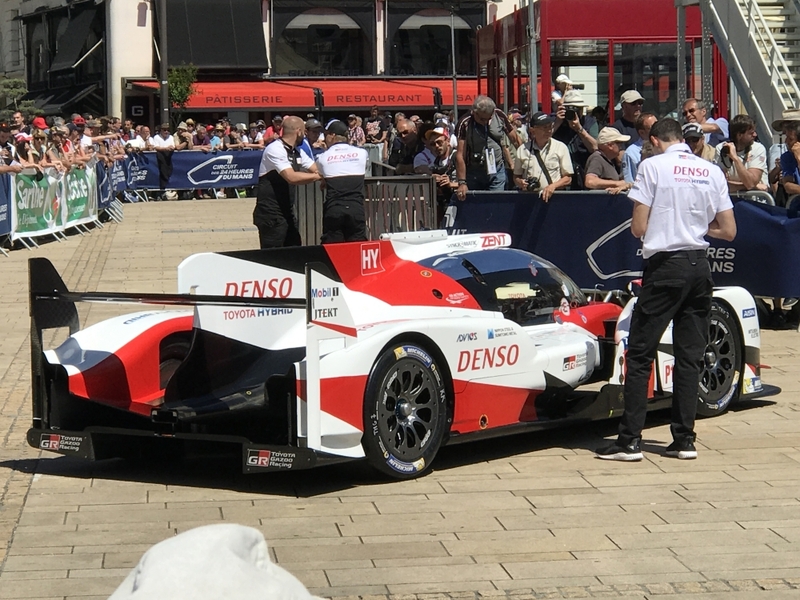 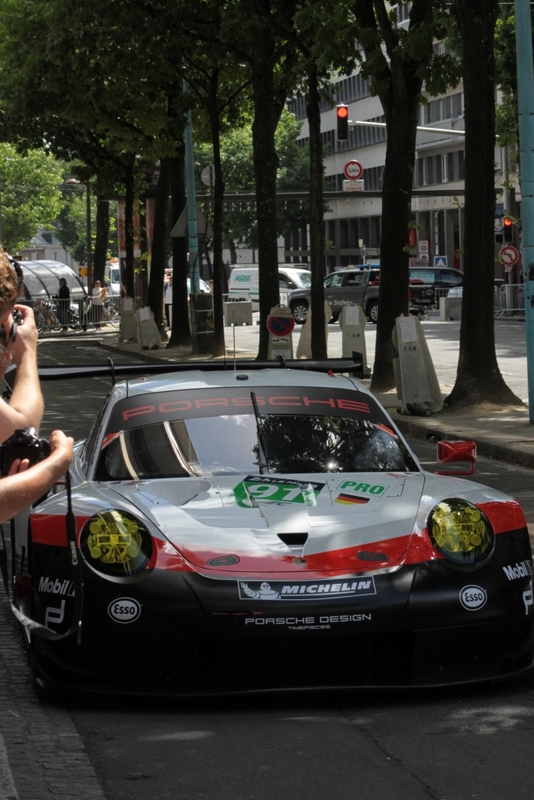 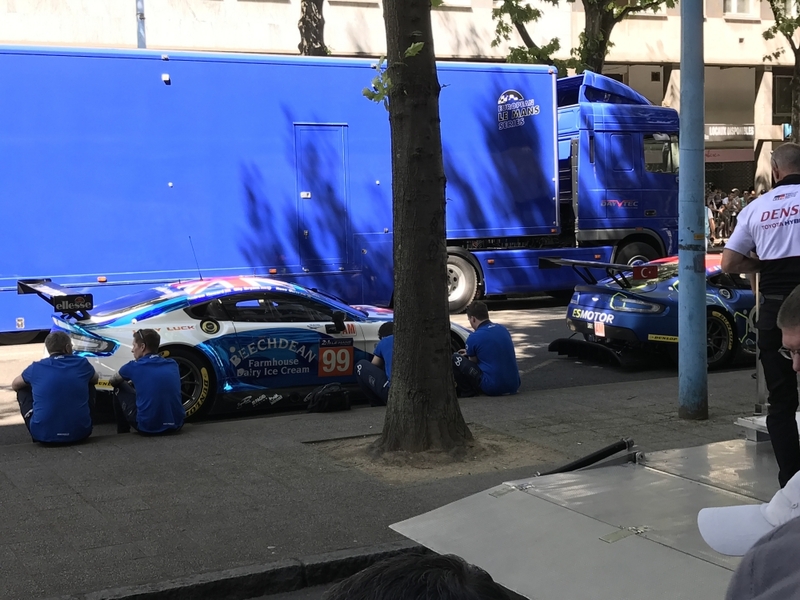 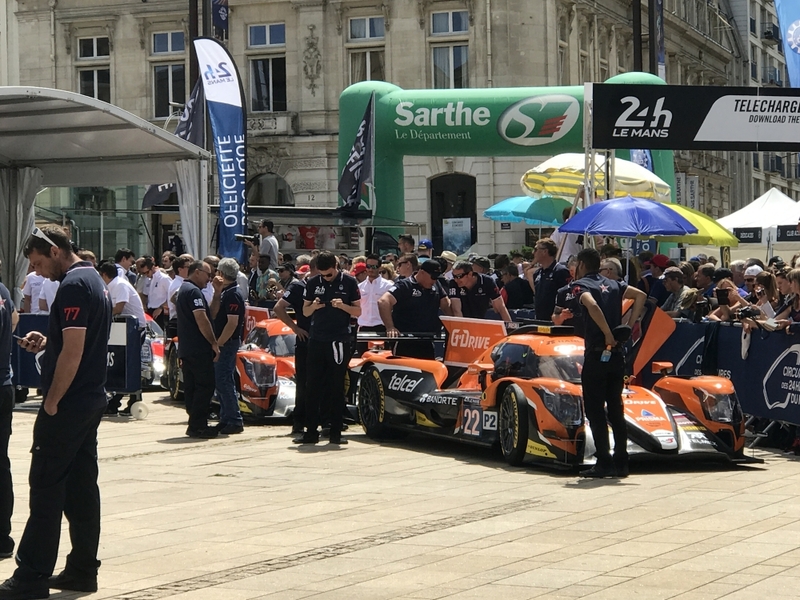 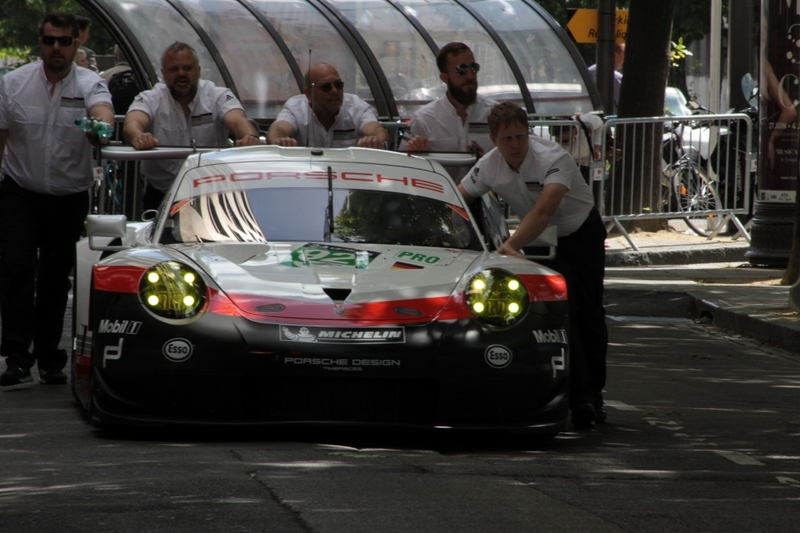 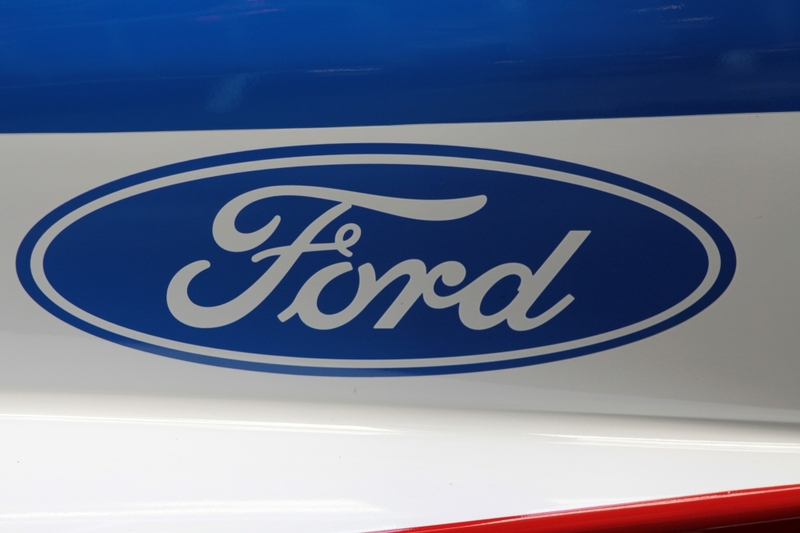 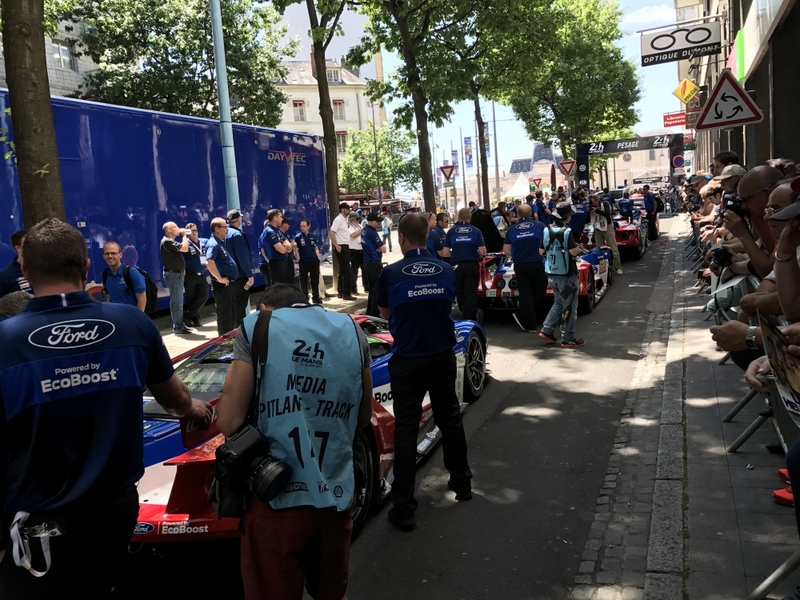 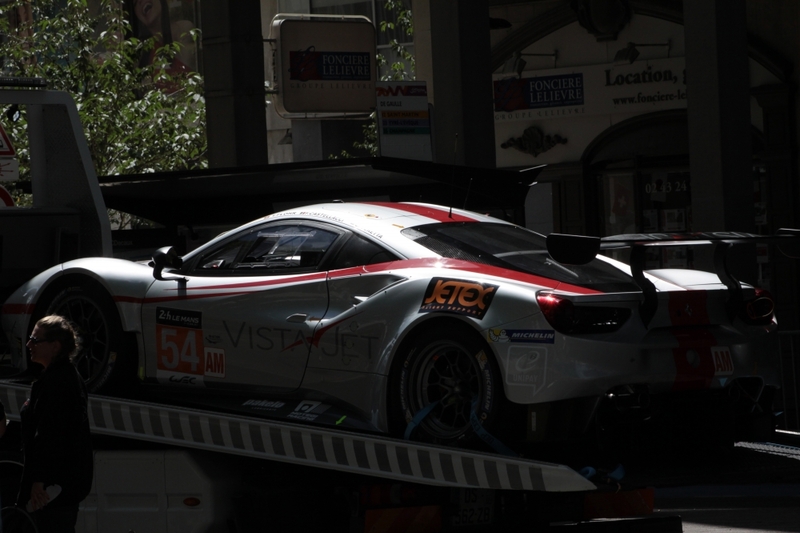 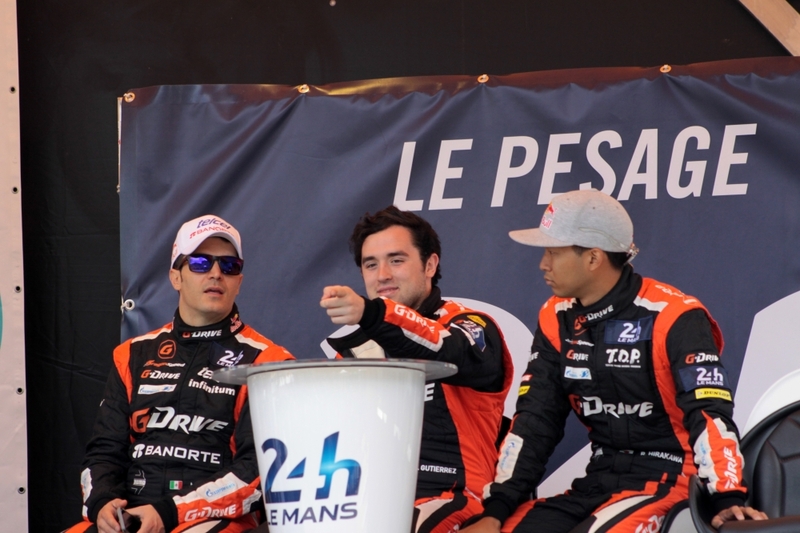 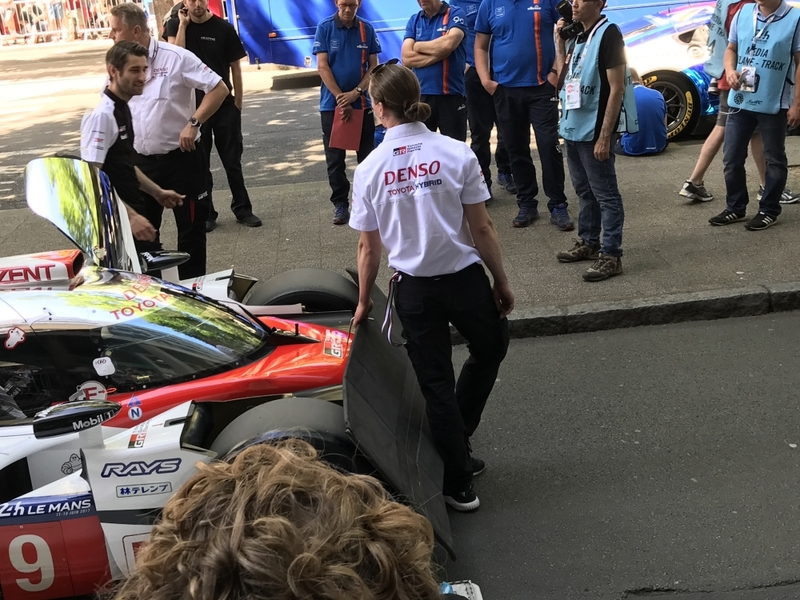 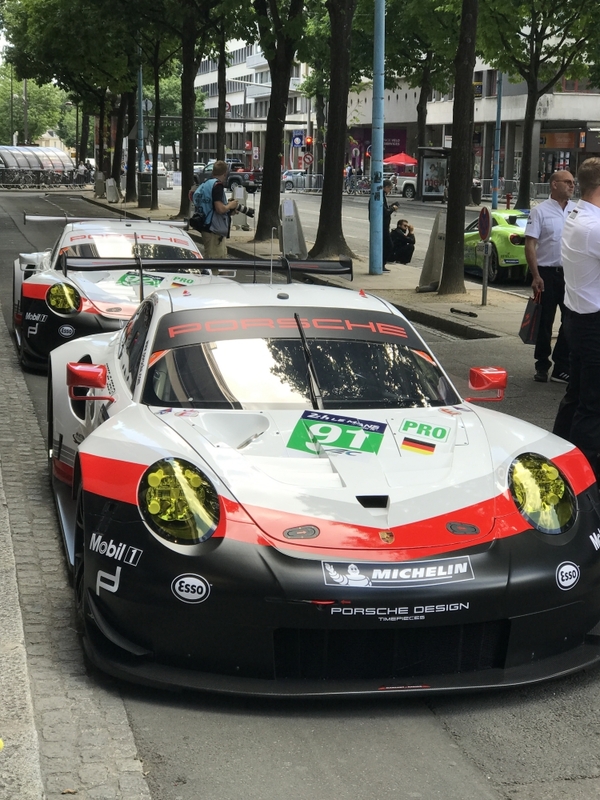 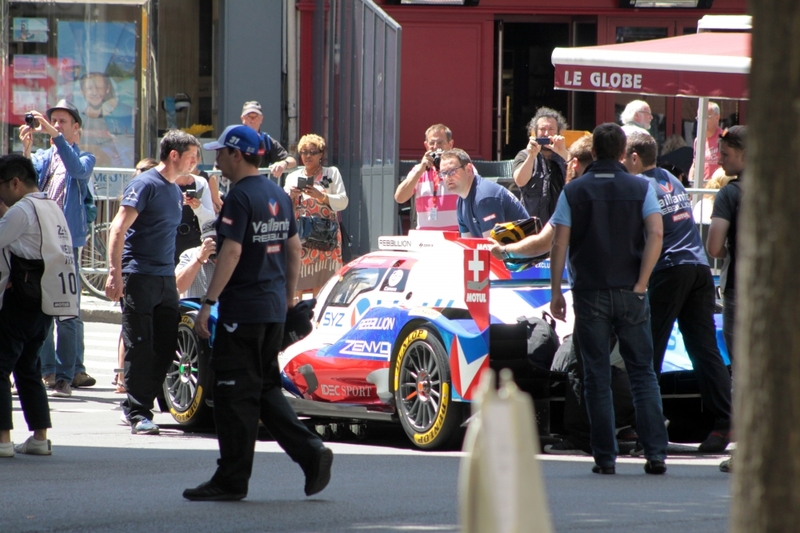 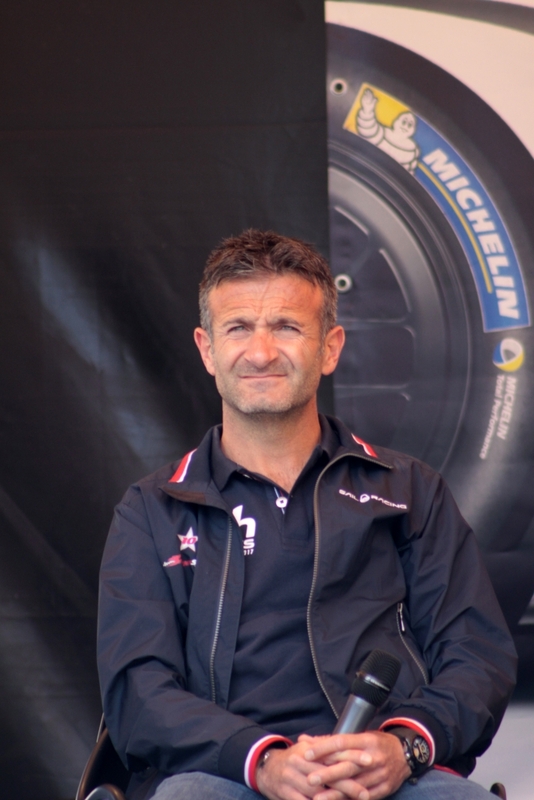 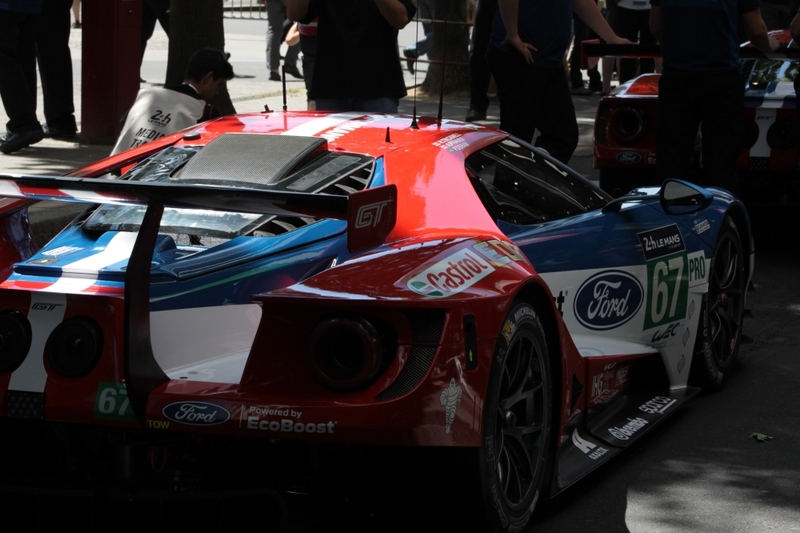 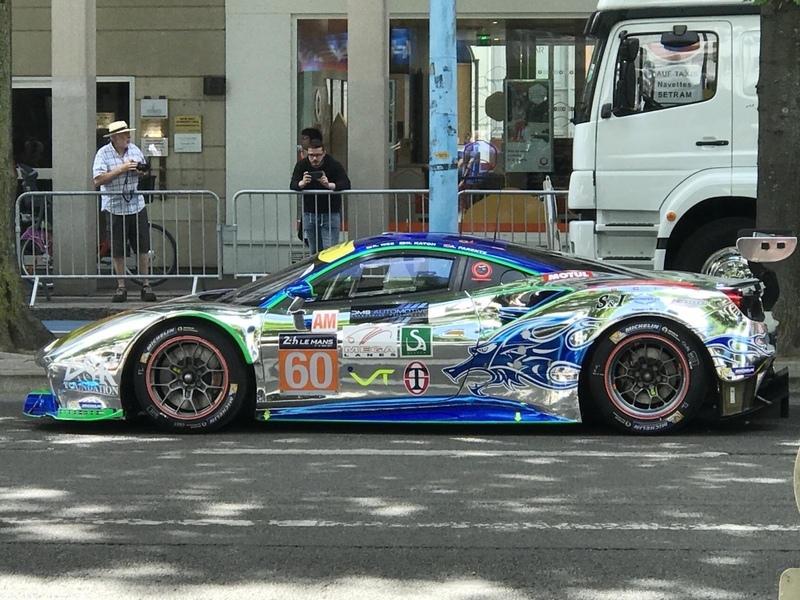 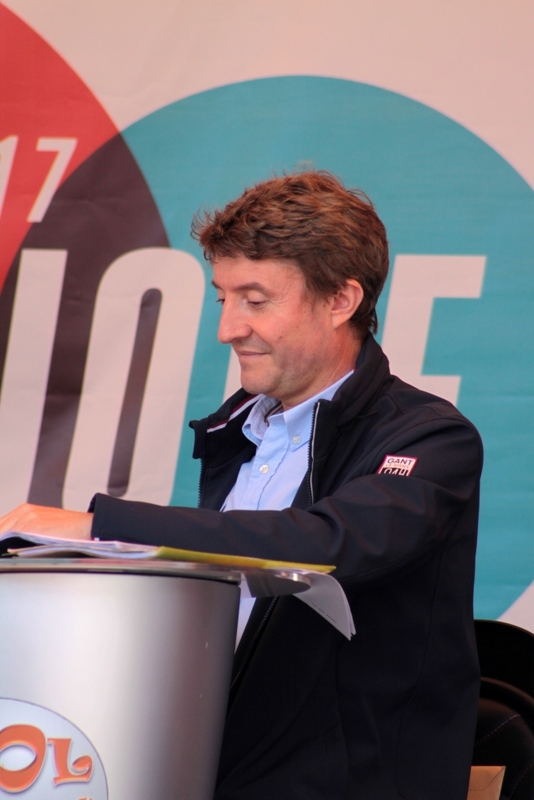 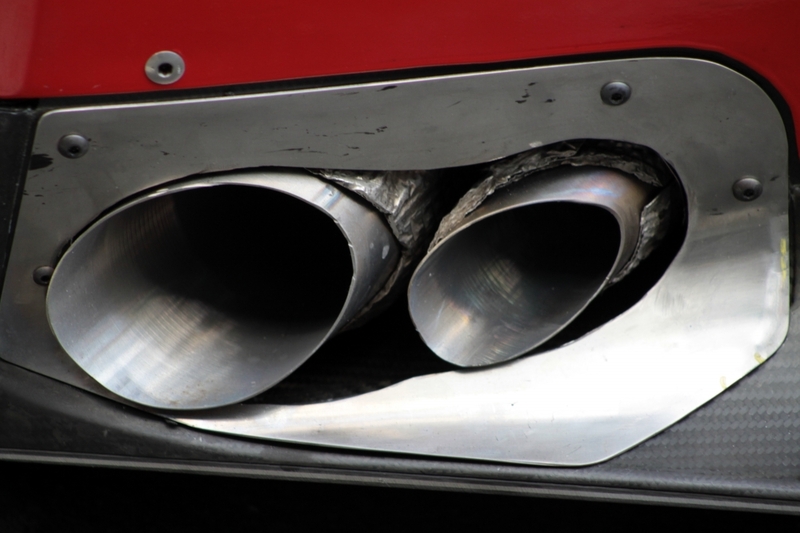 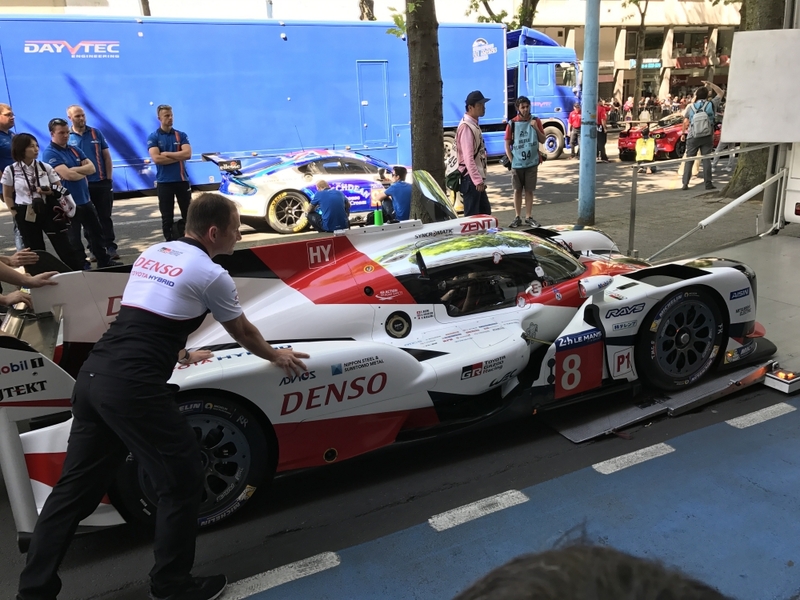 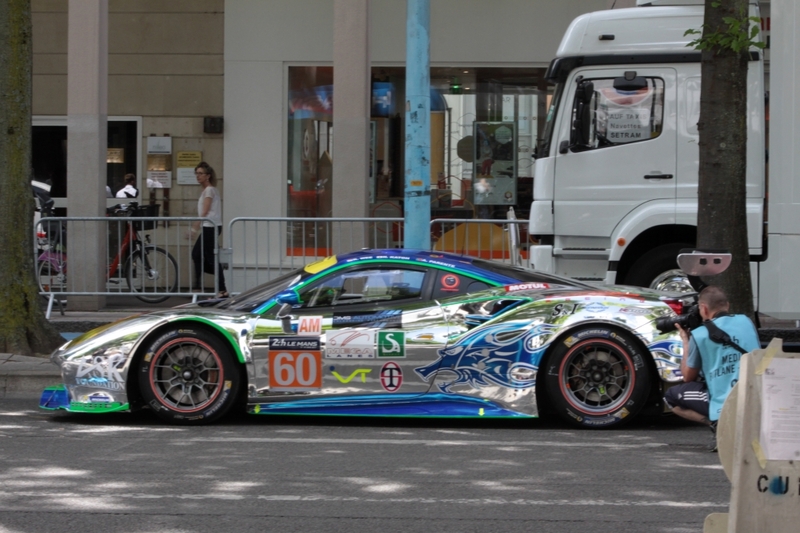 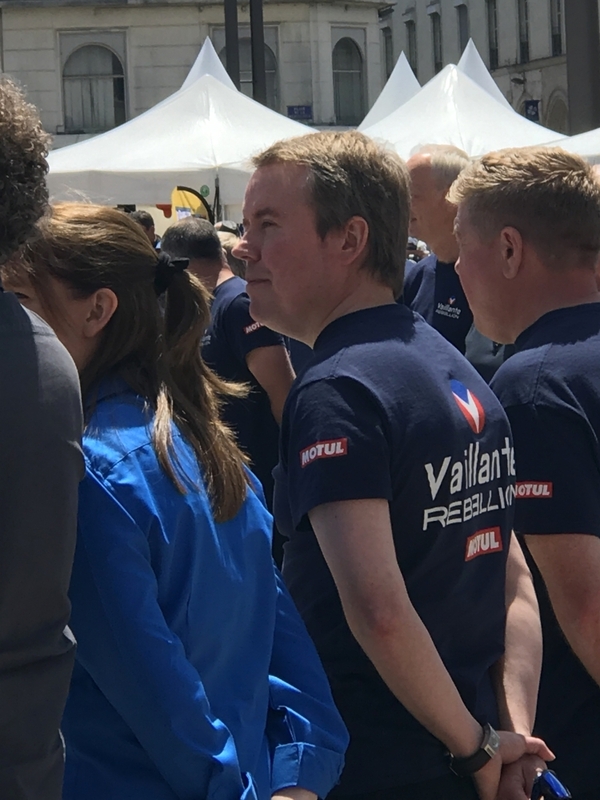 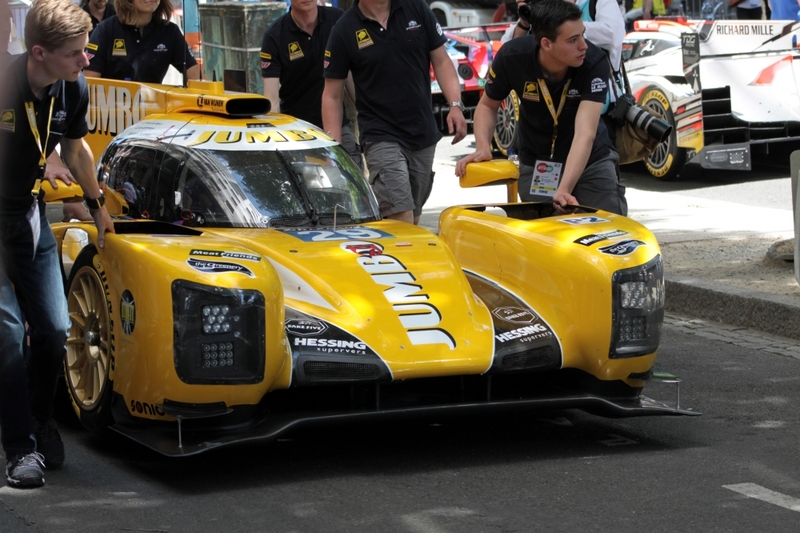 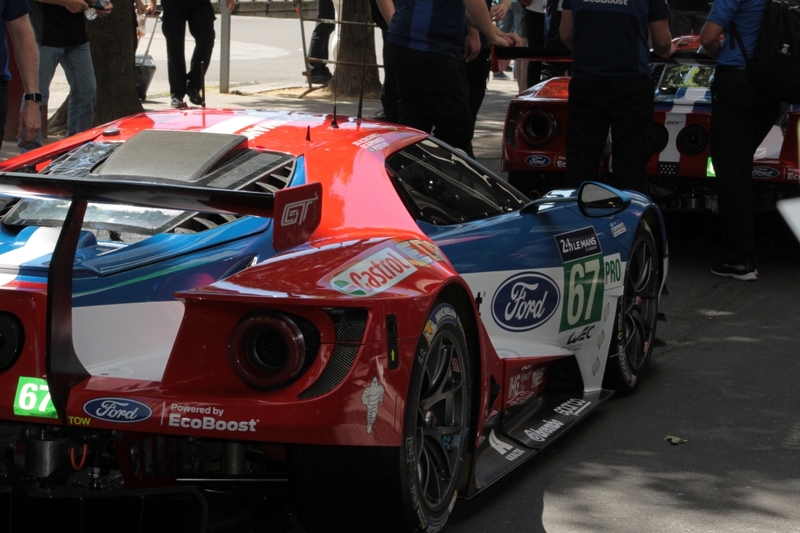 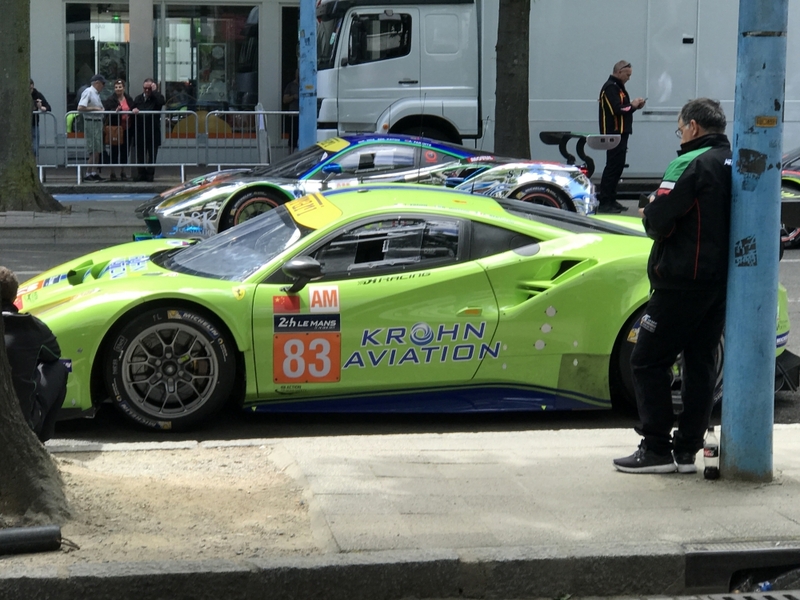 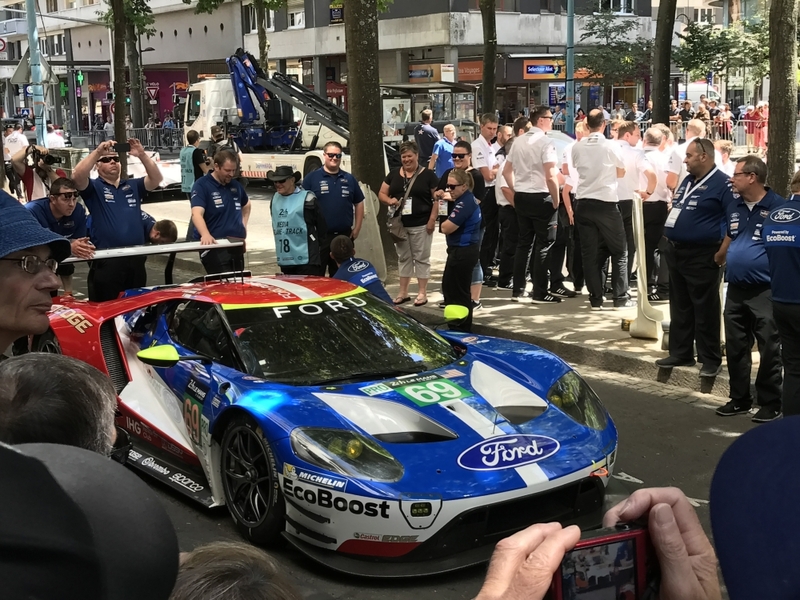 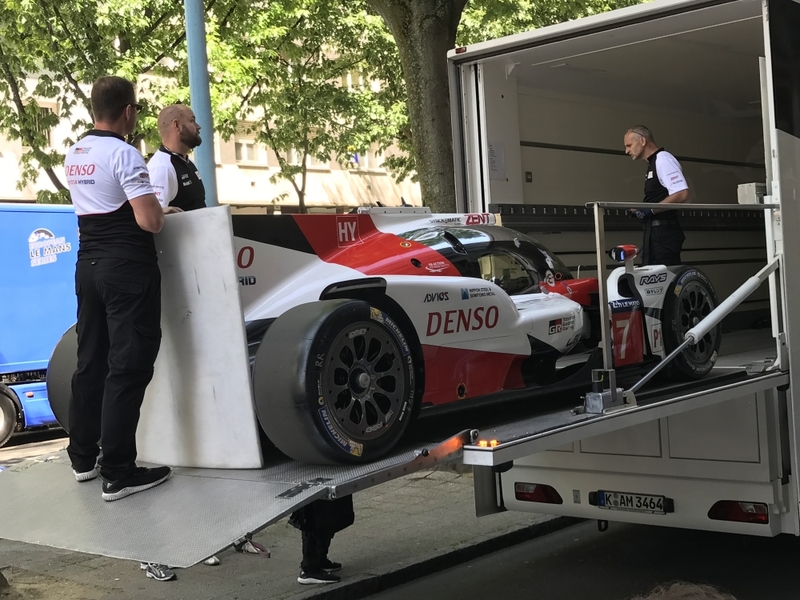 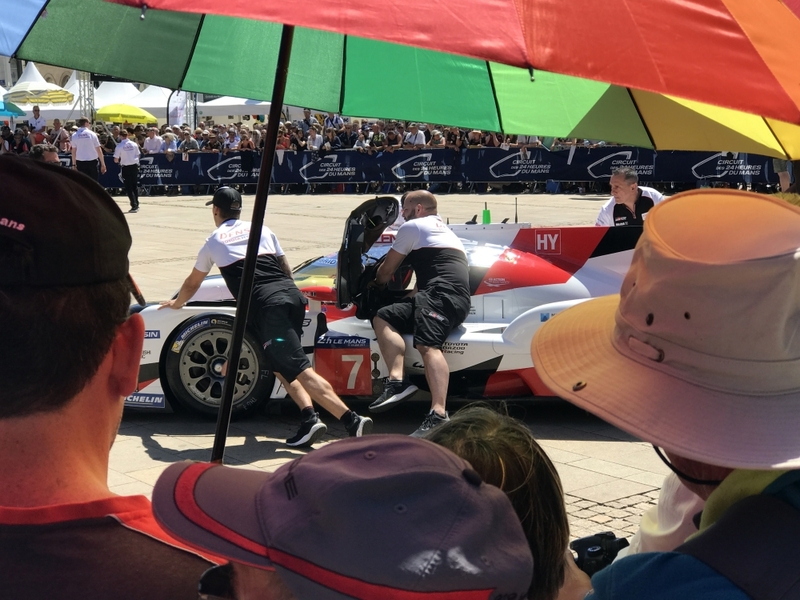 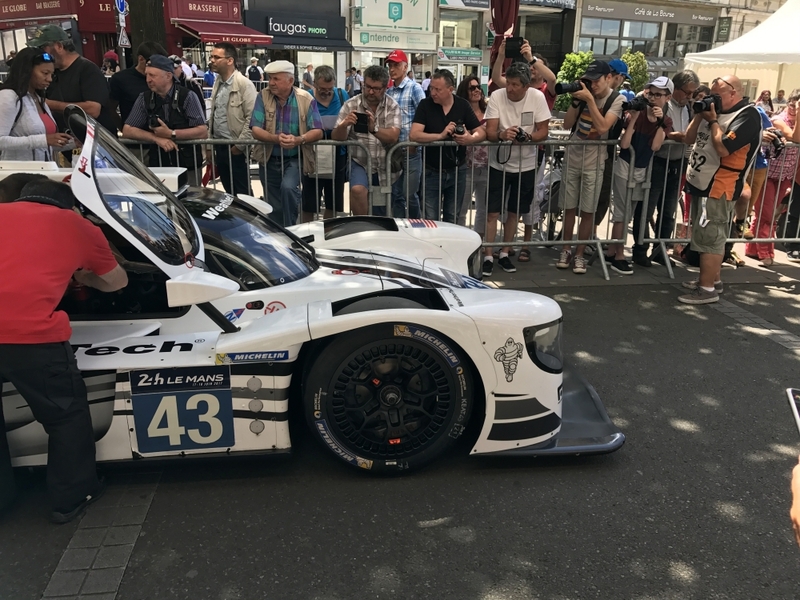 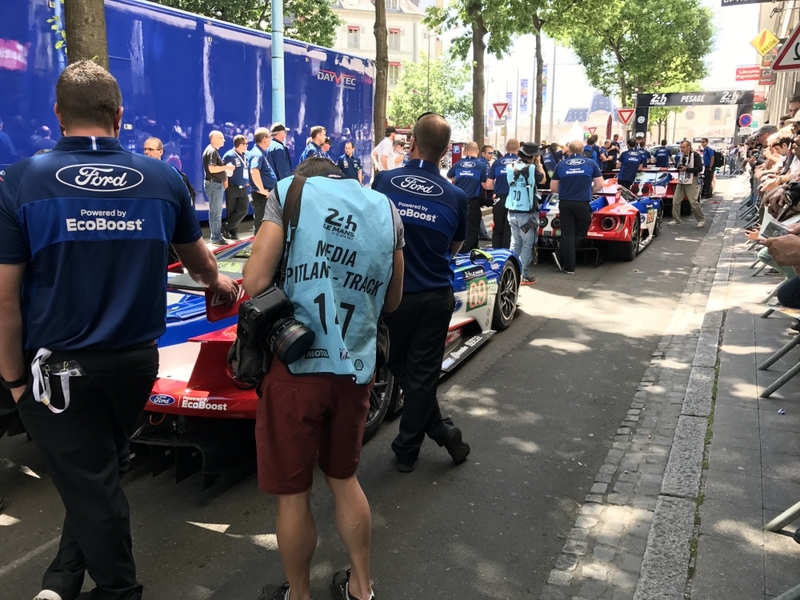 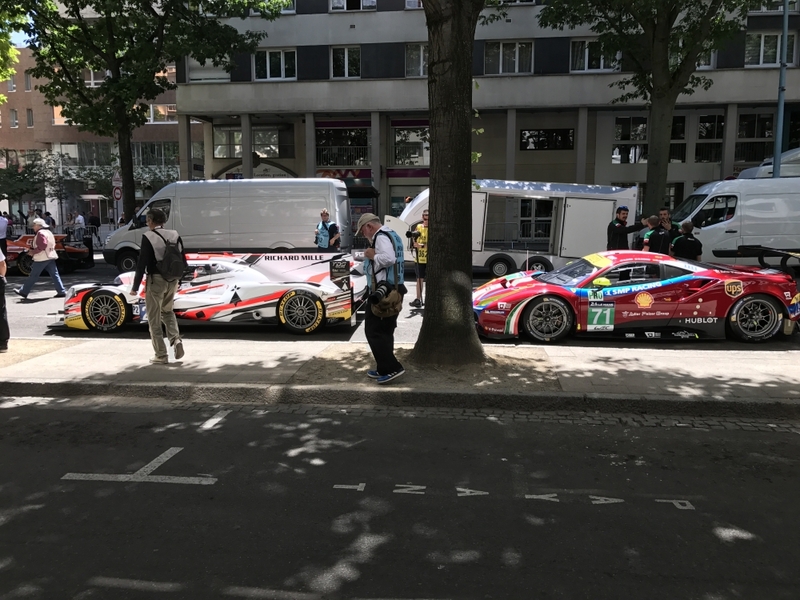 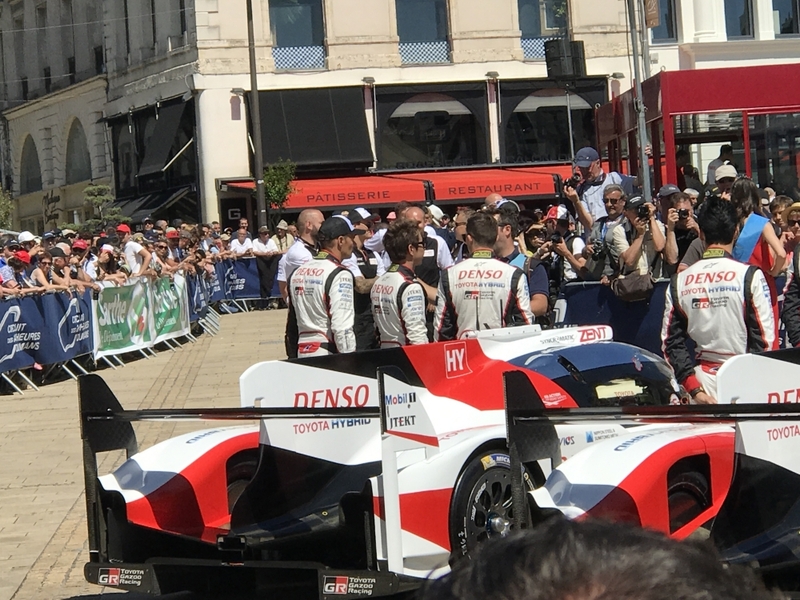 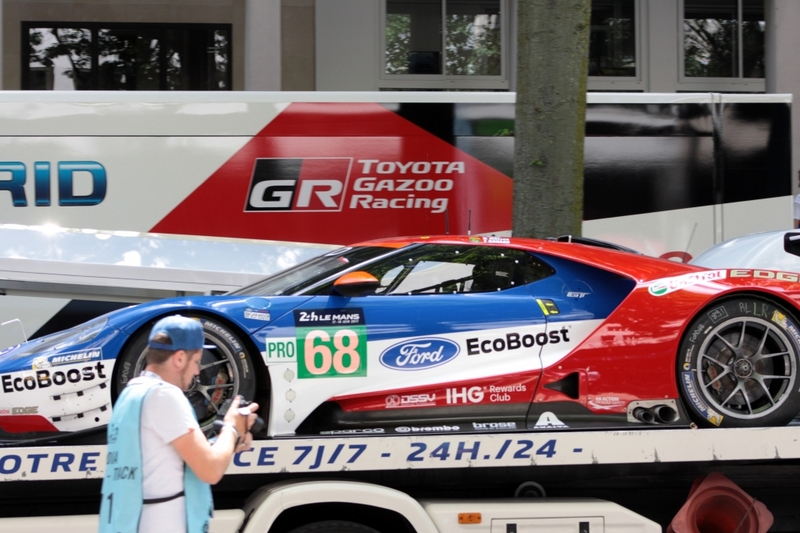 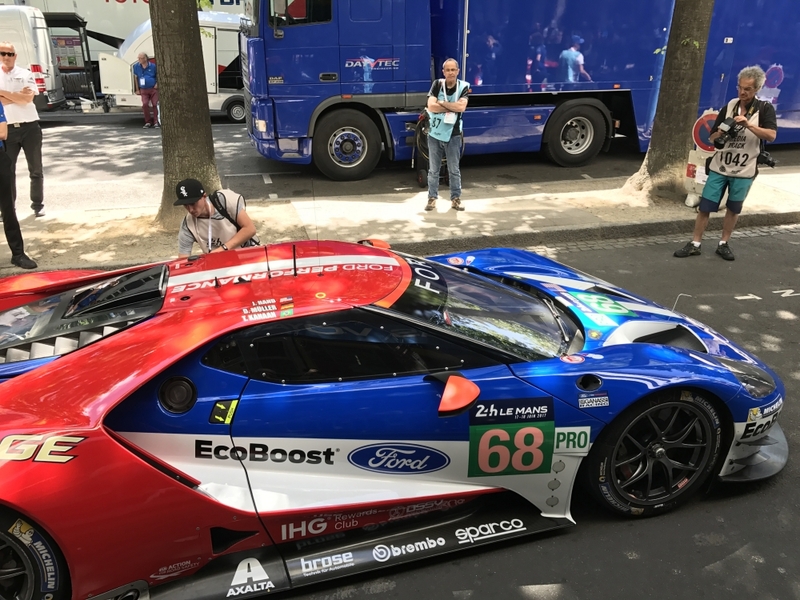 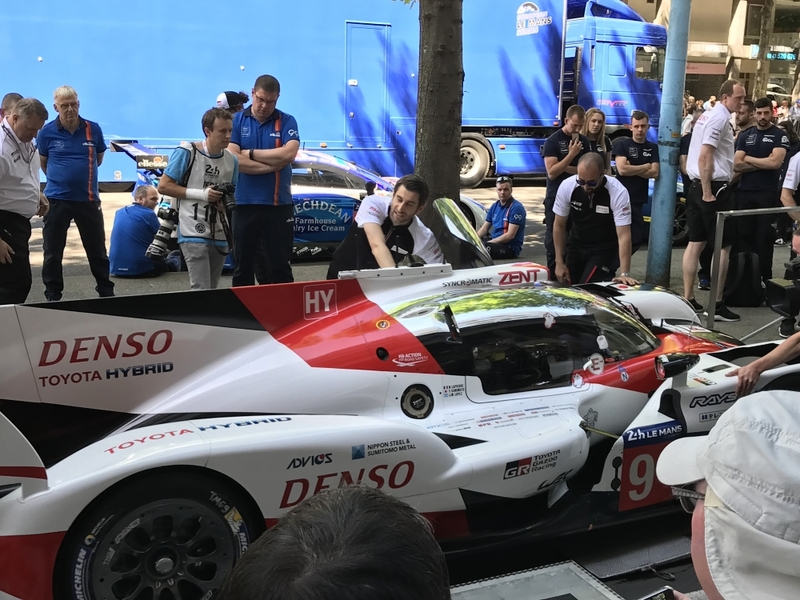 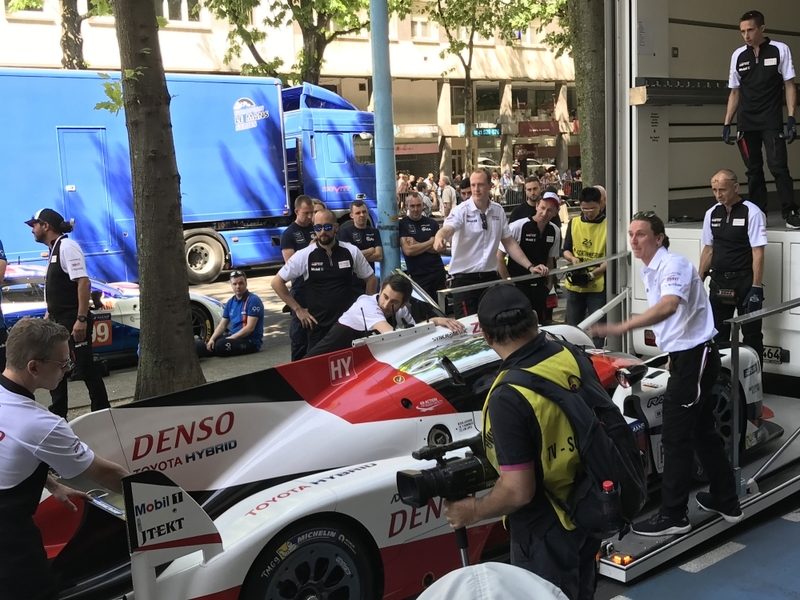 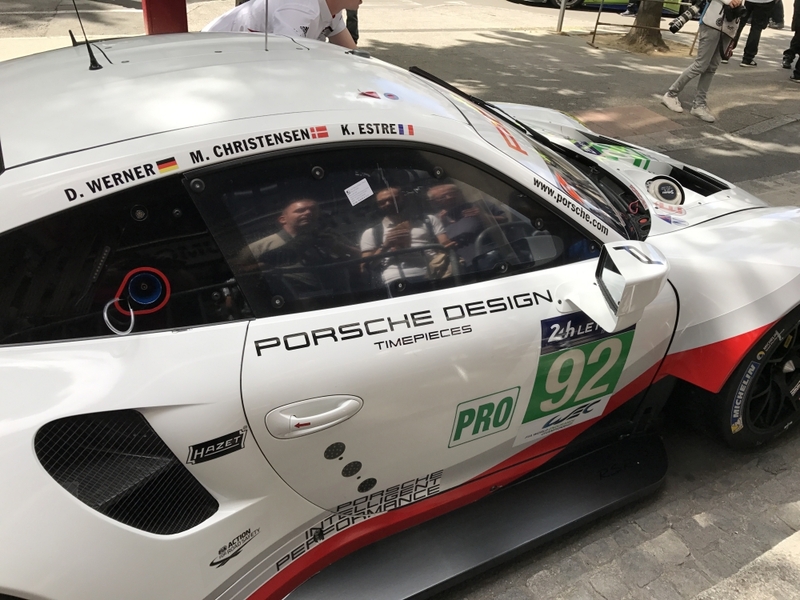 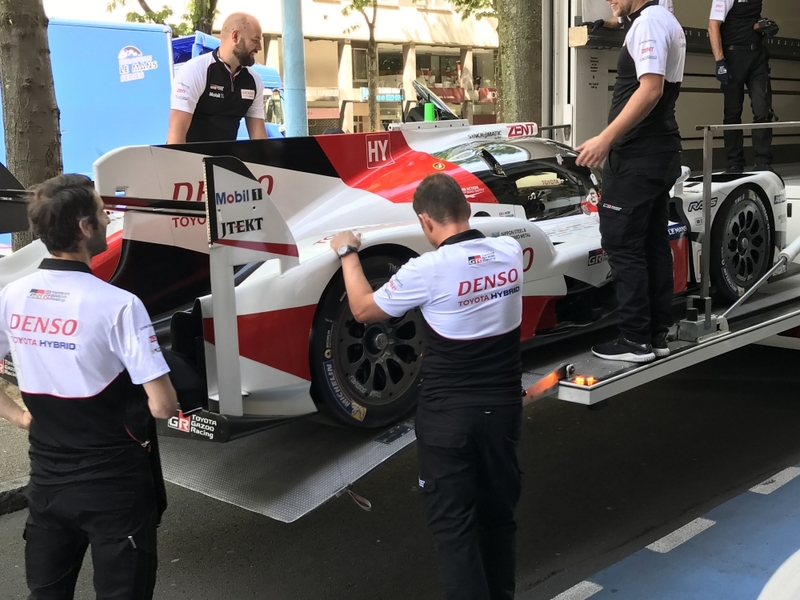 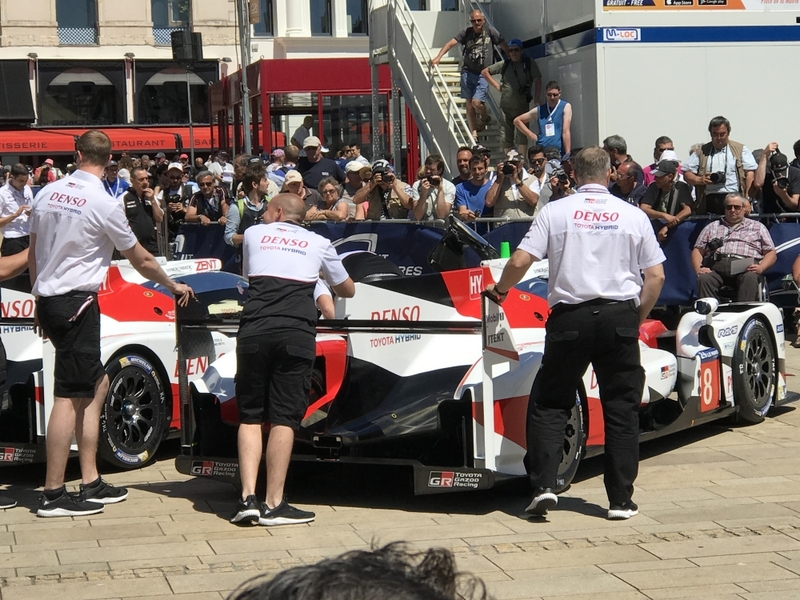 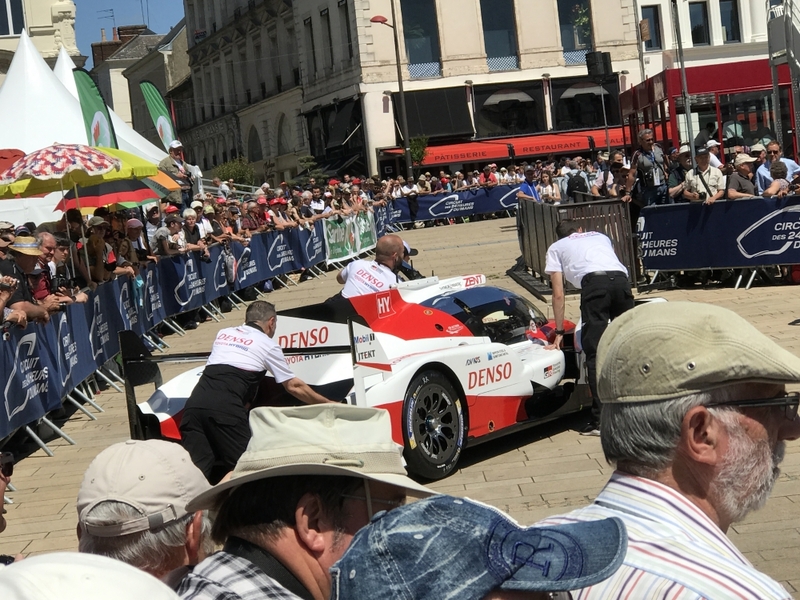 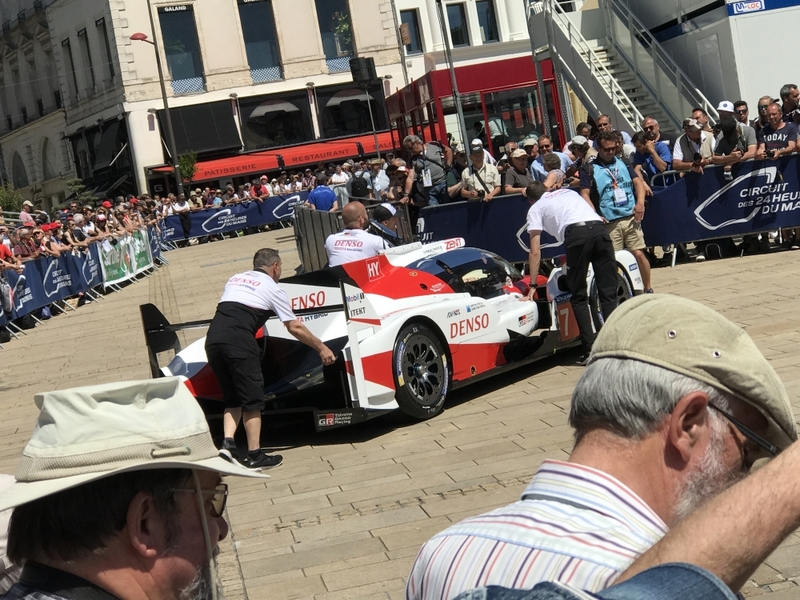 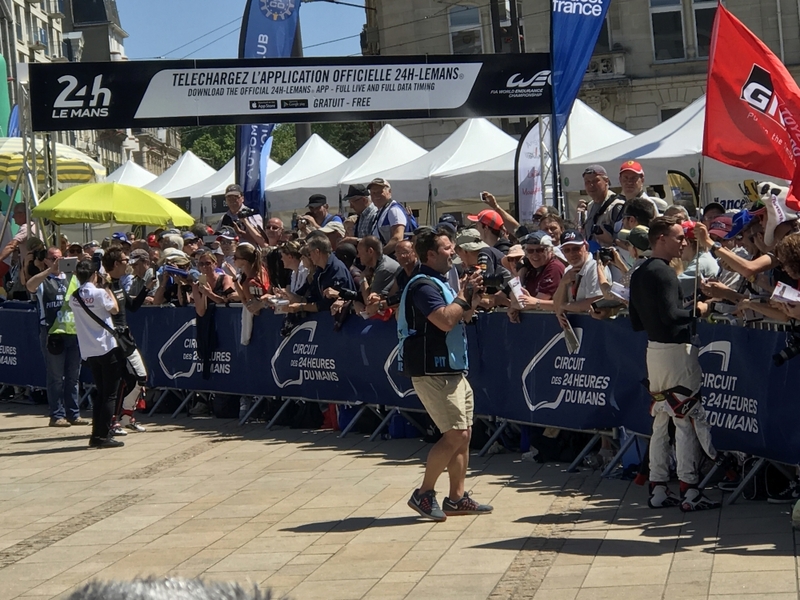 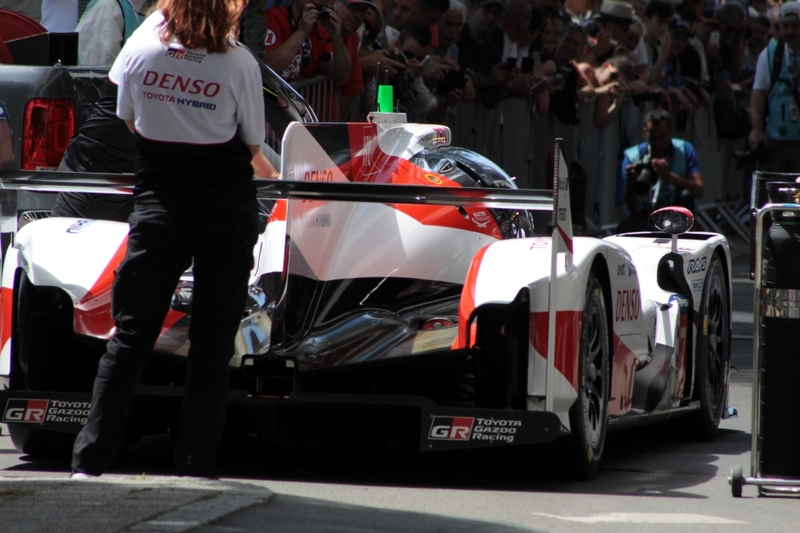 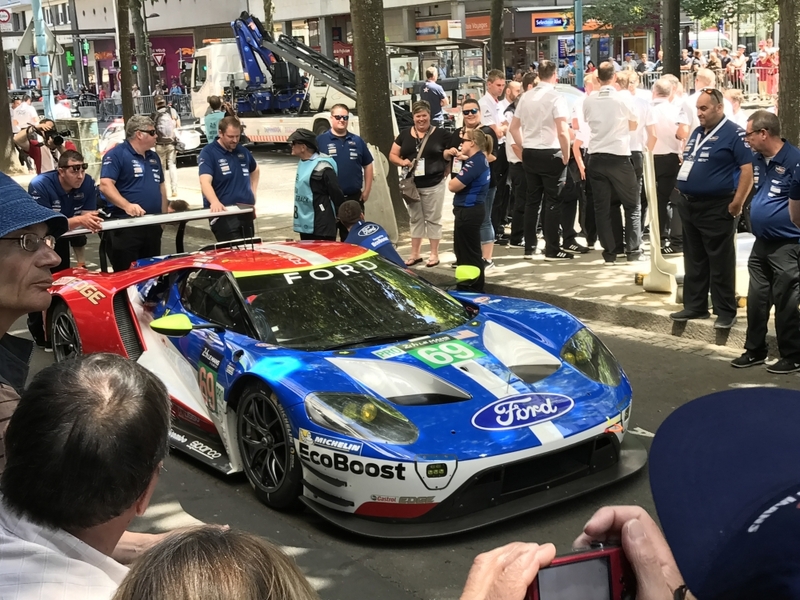 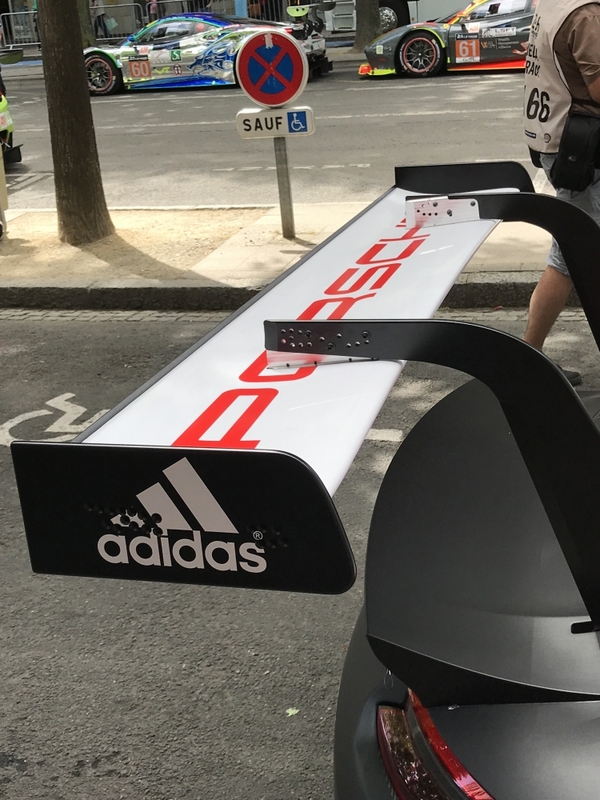 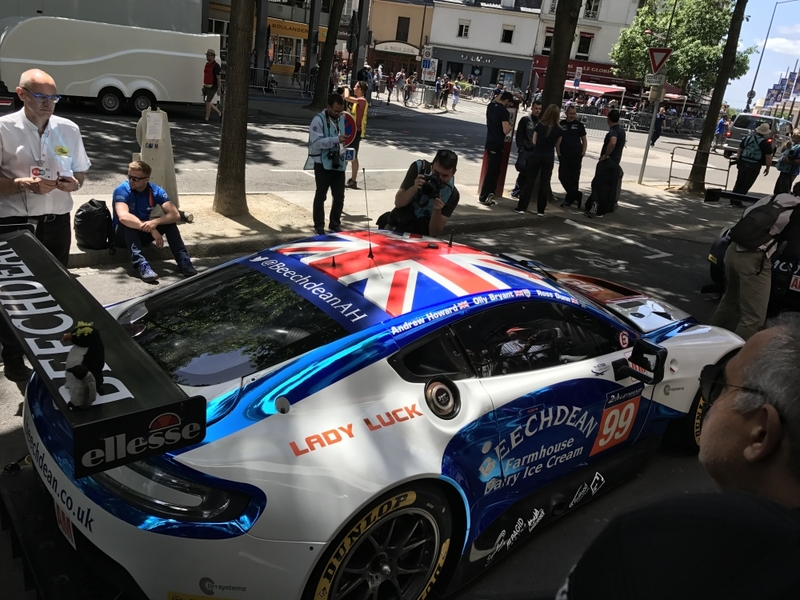 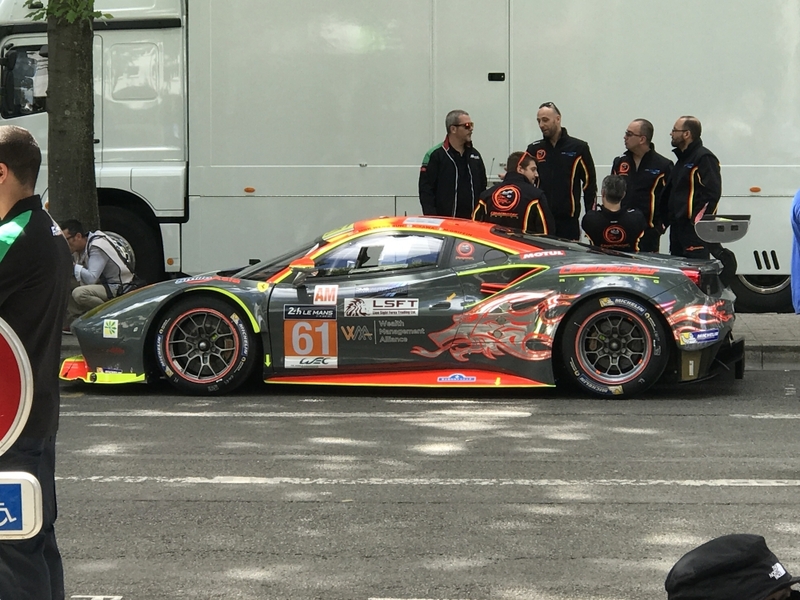 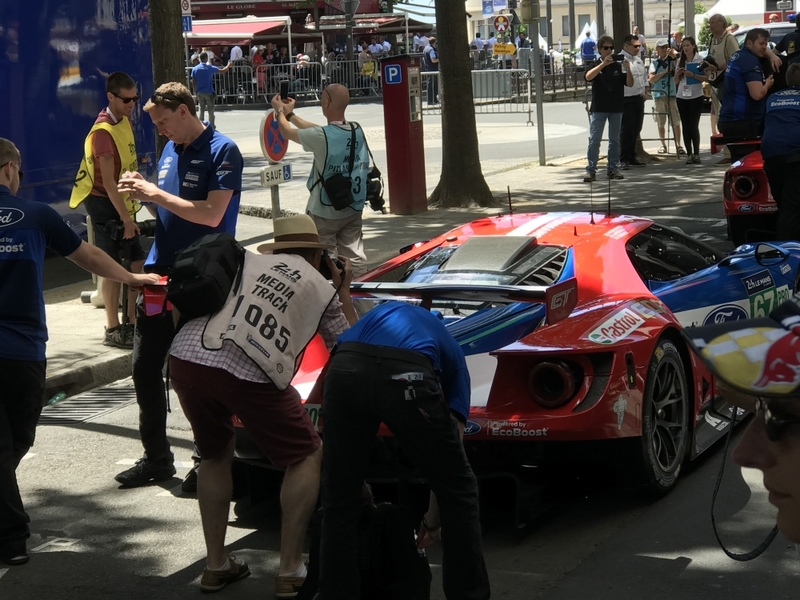 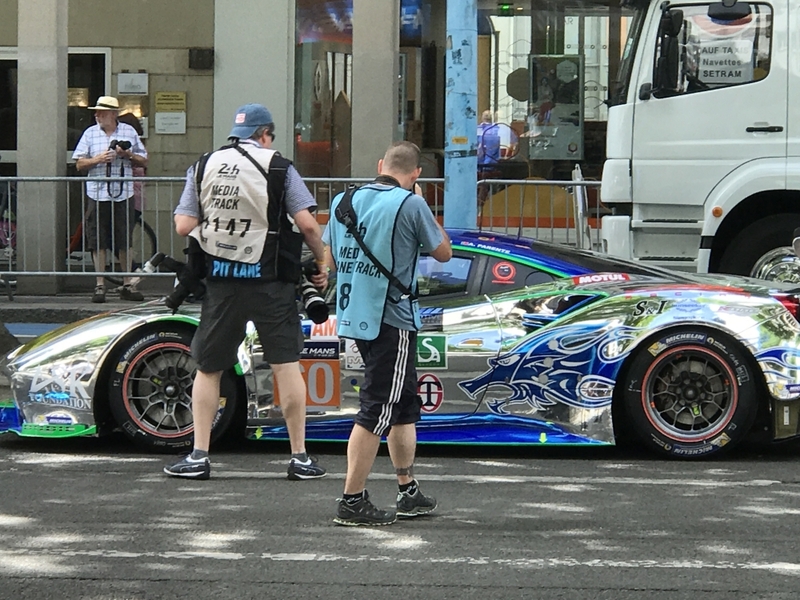 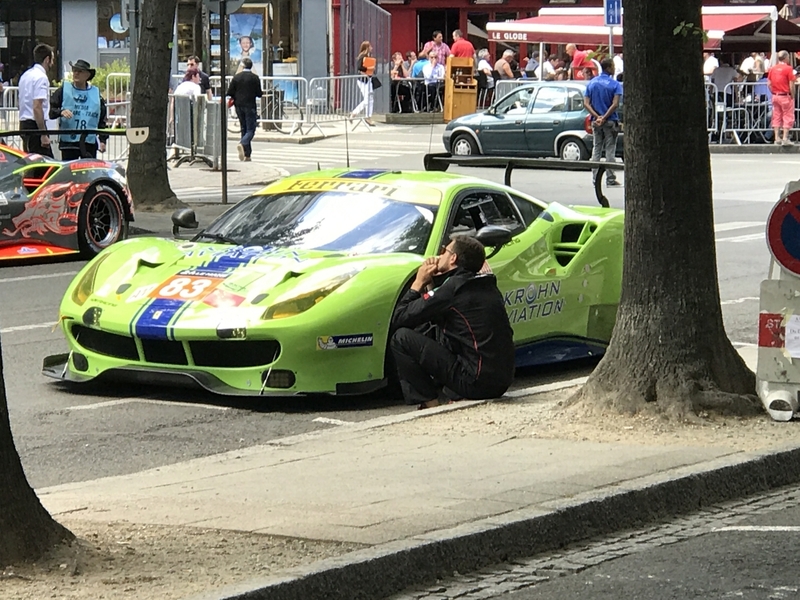 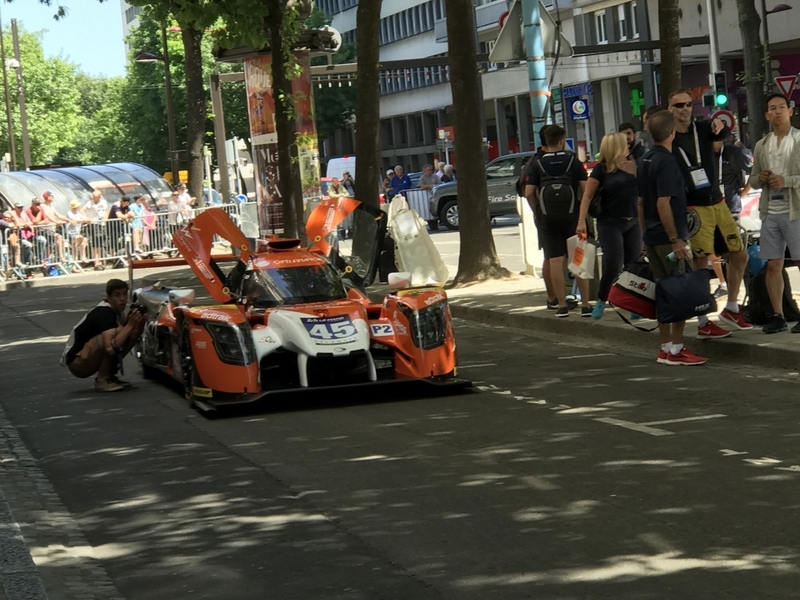 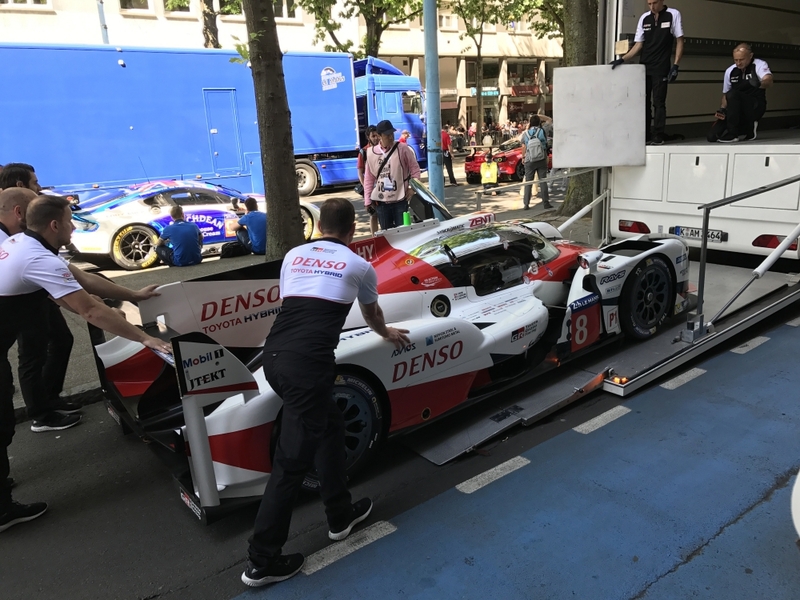 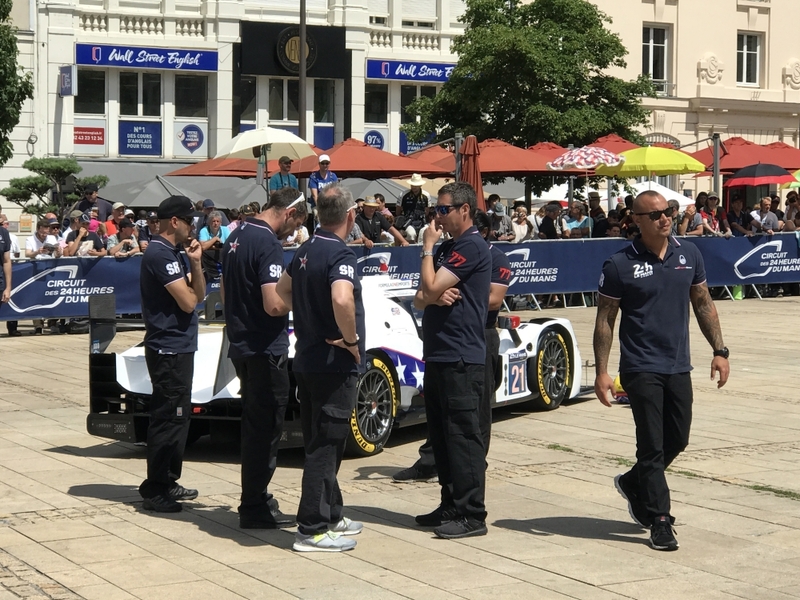 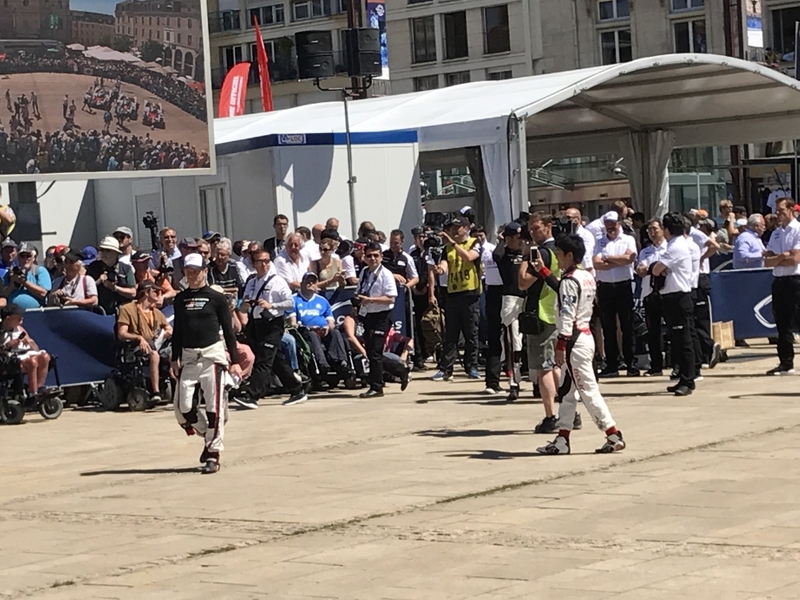 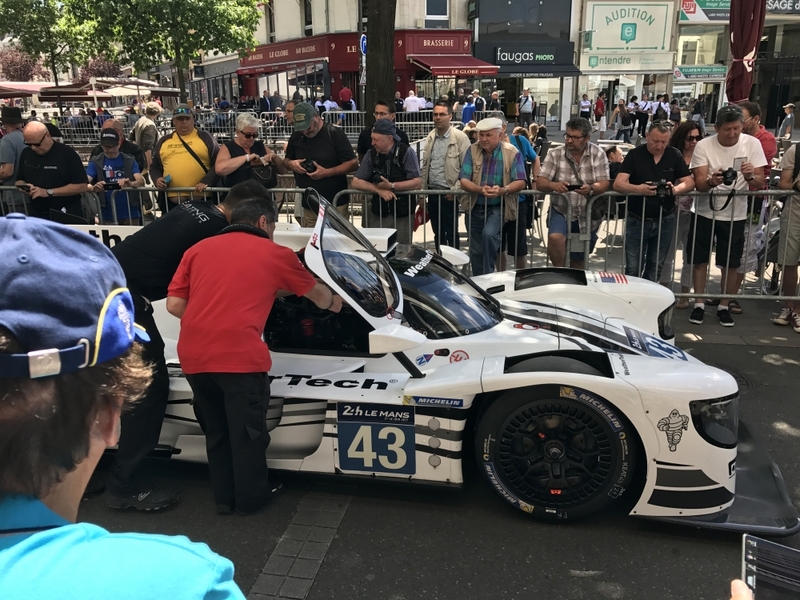 The teams and particularly the drivers play a massive part in this and most enter into it in the right spirit, even though this means hanging around in the centre of town for long periods of time when they would no doubt prefer to be doing other things. 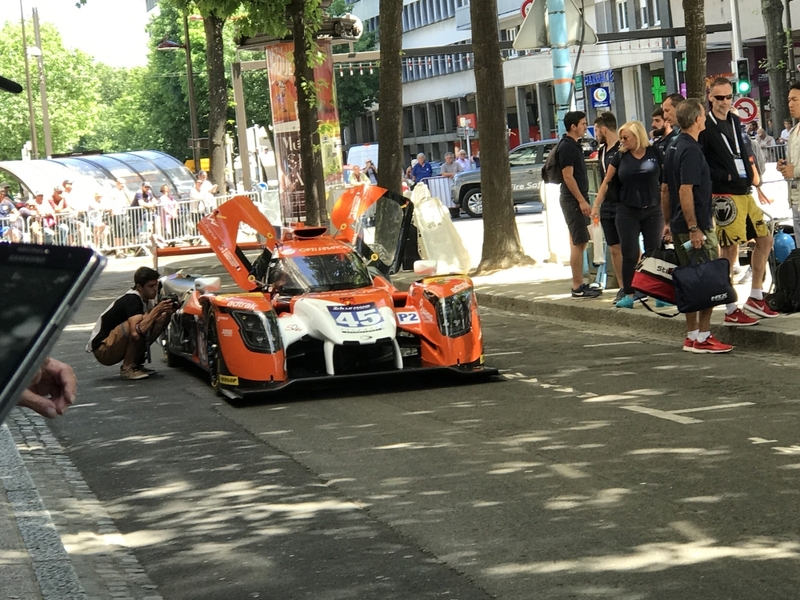 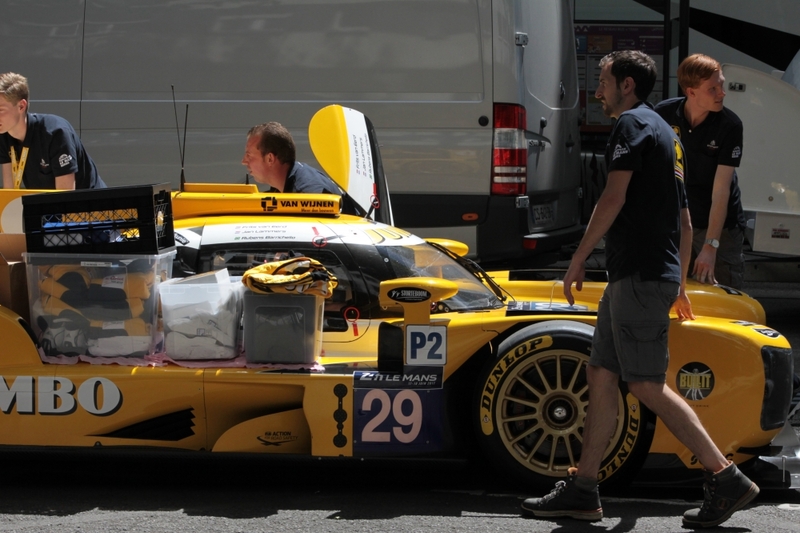 The drivers also have to wait for the 'photo shoot' that takes place once the cars emerge from scrutineering. 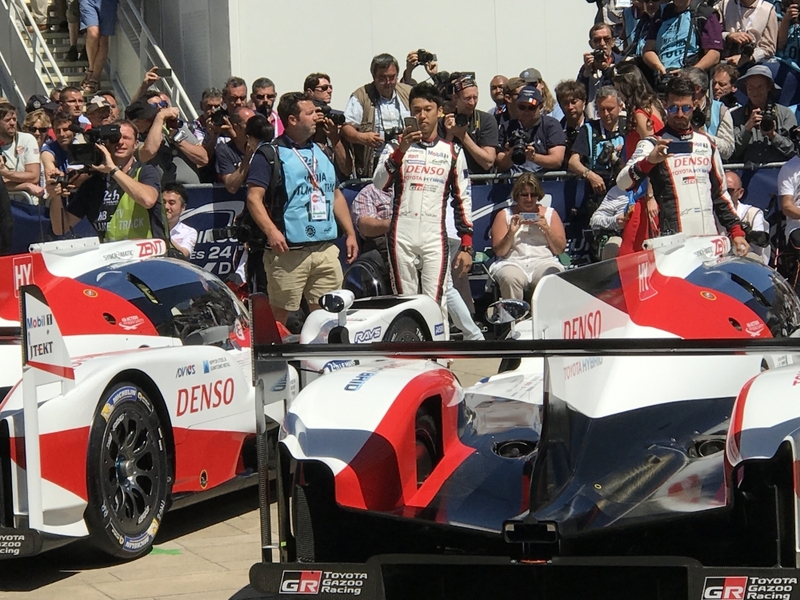 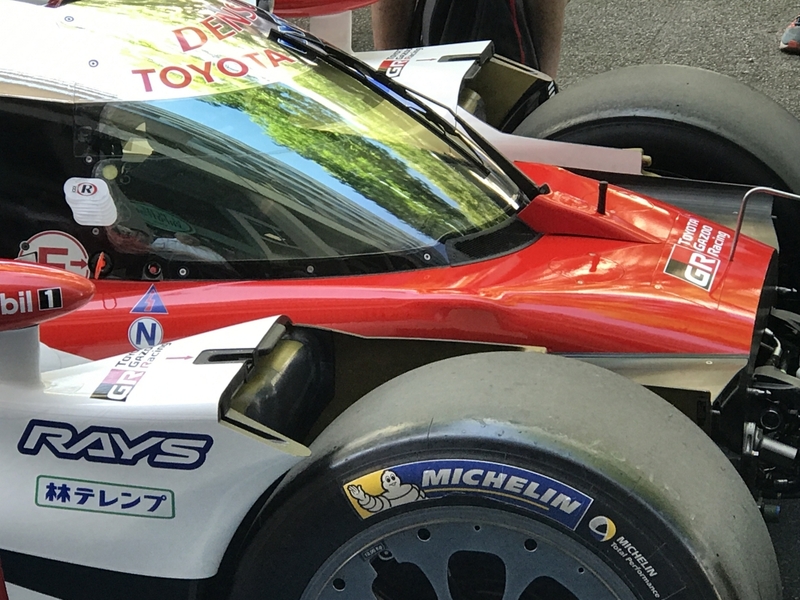 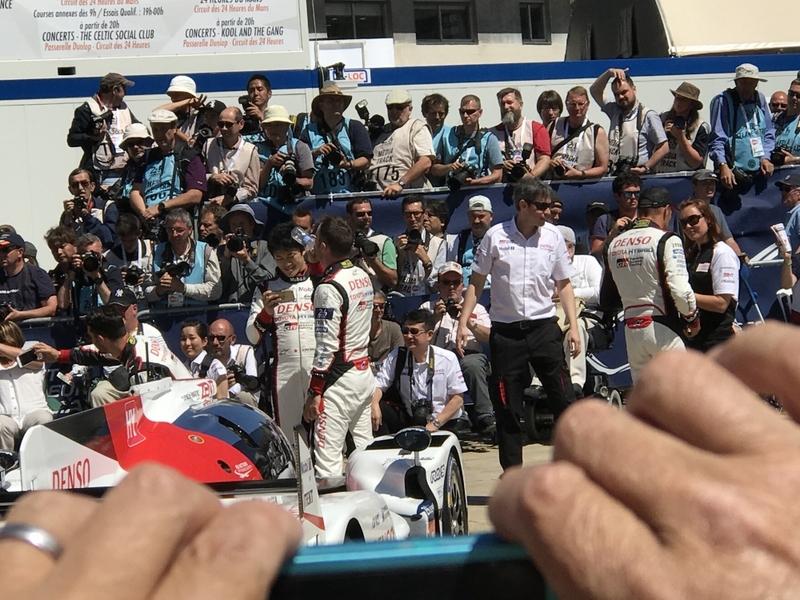 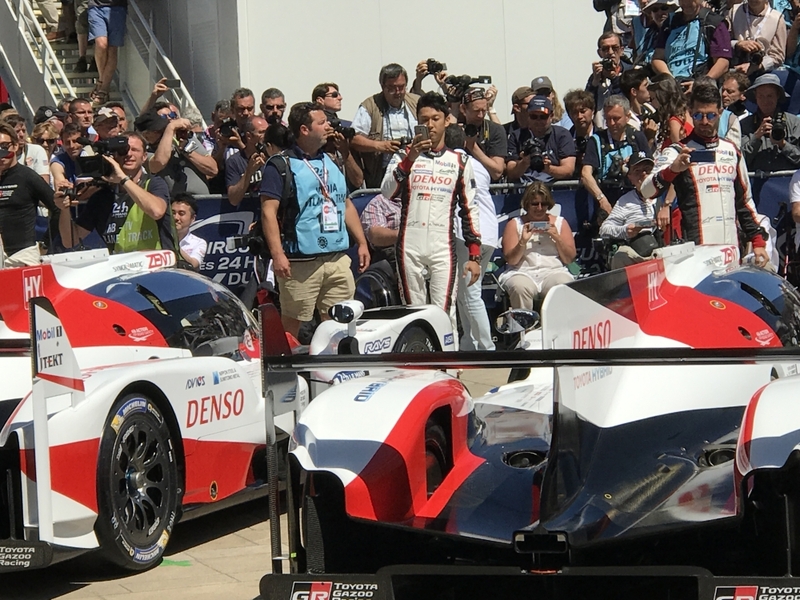 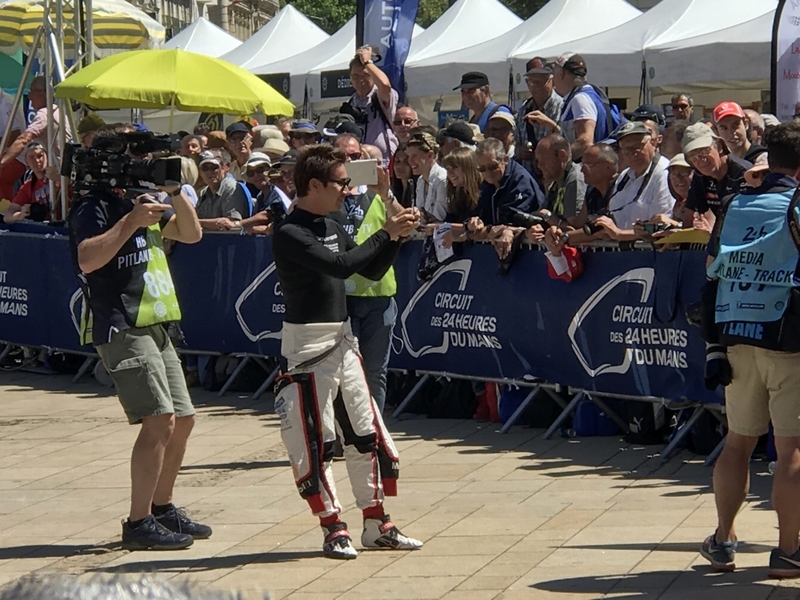 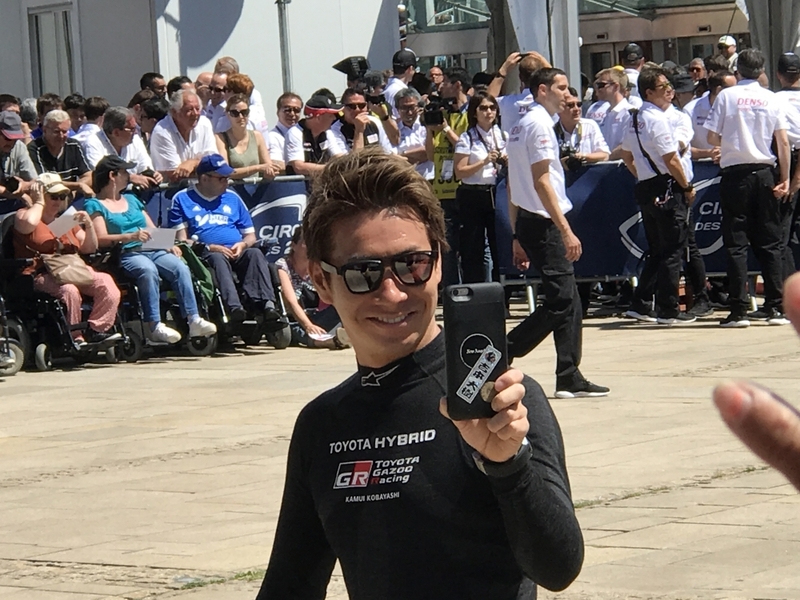 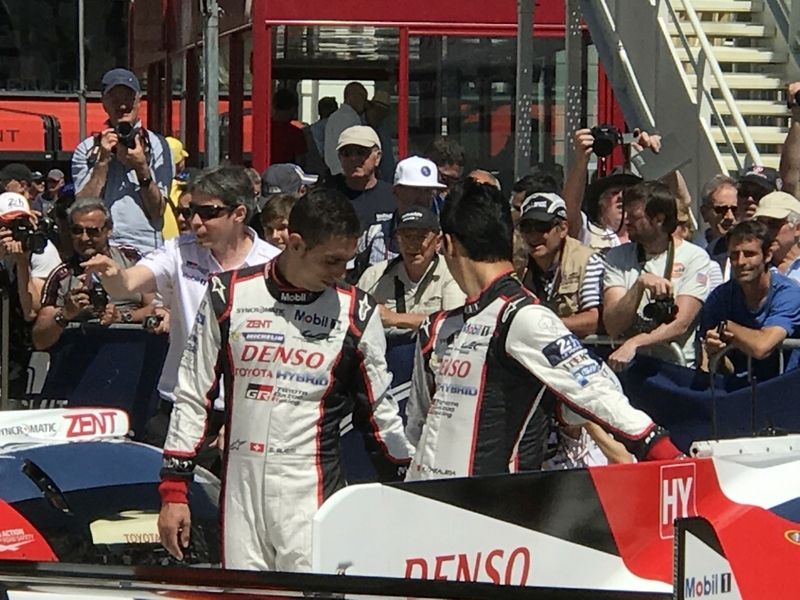 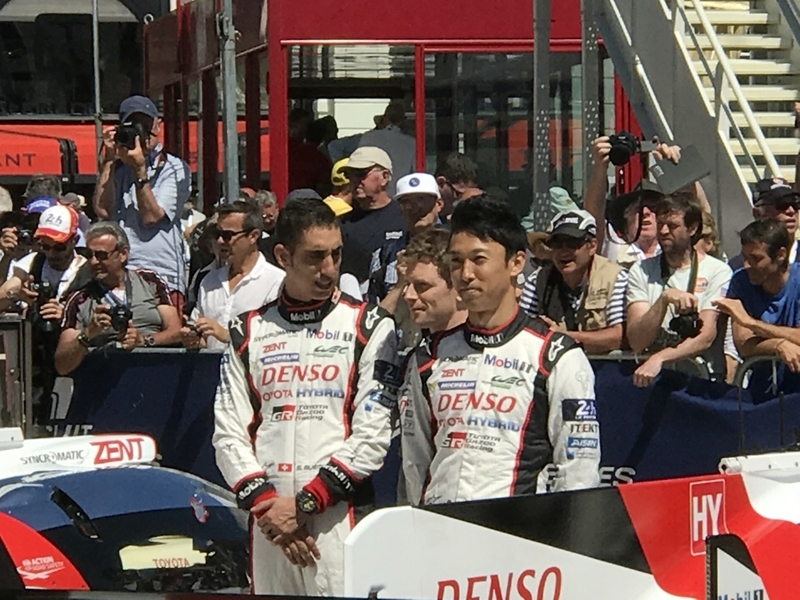 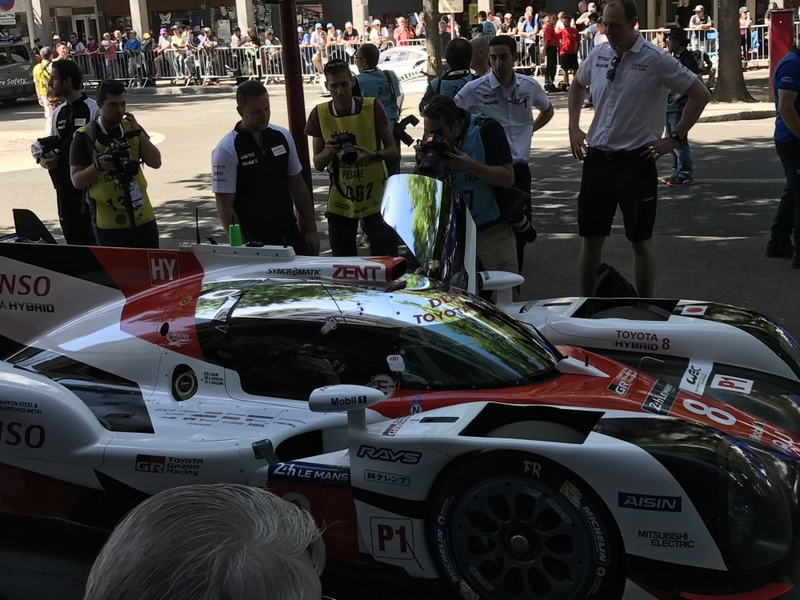 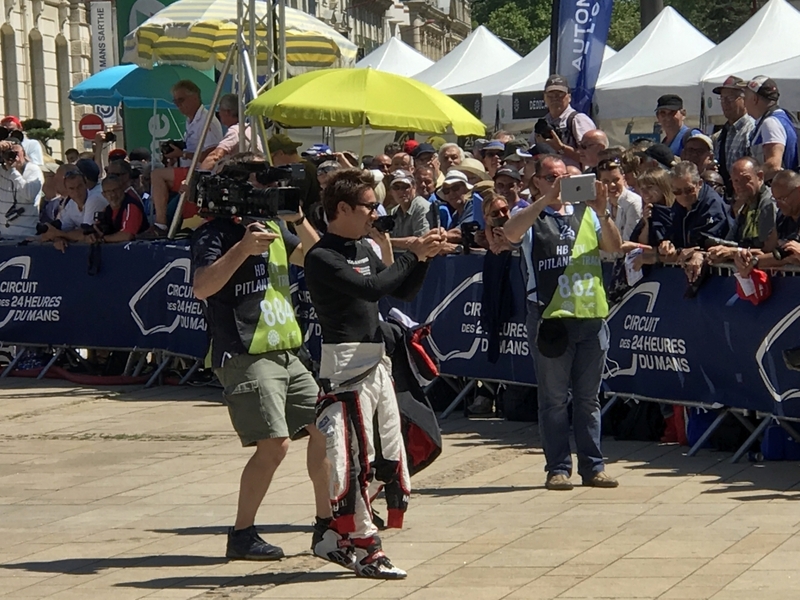 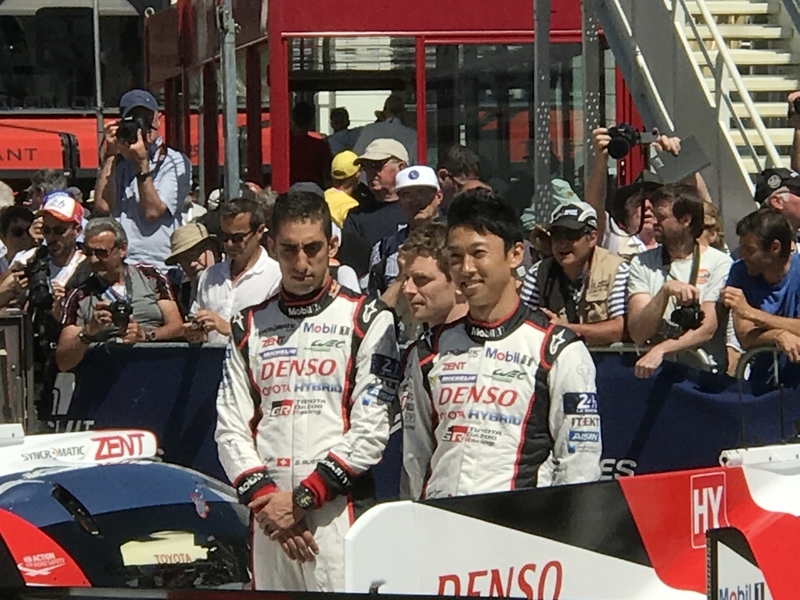 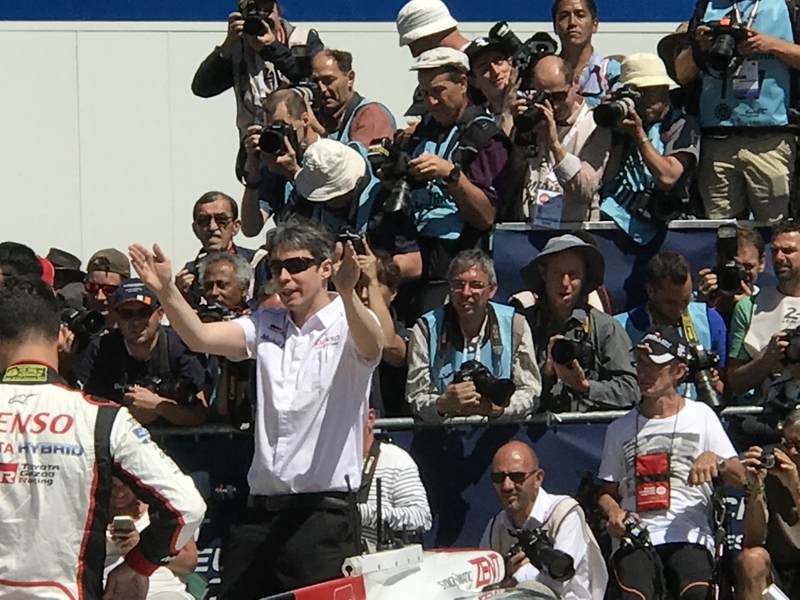 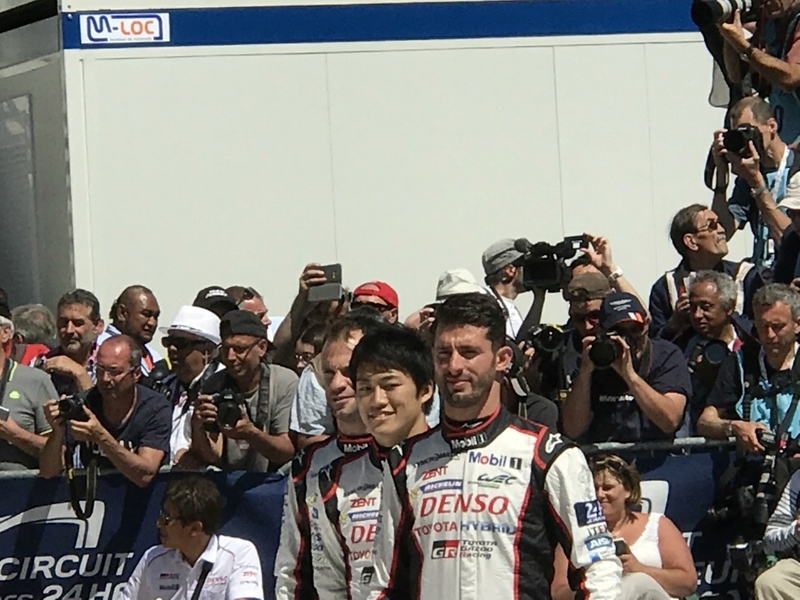 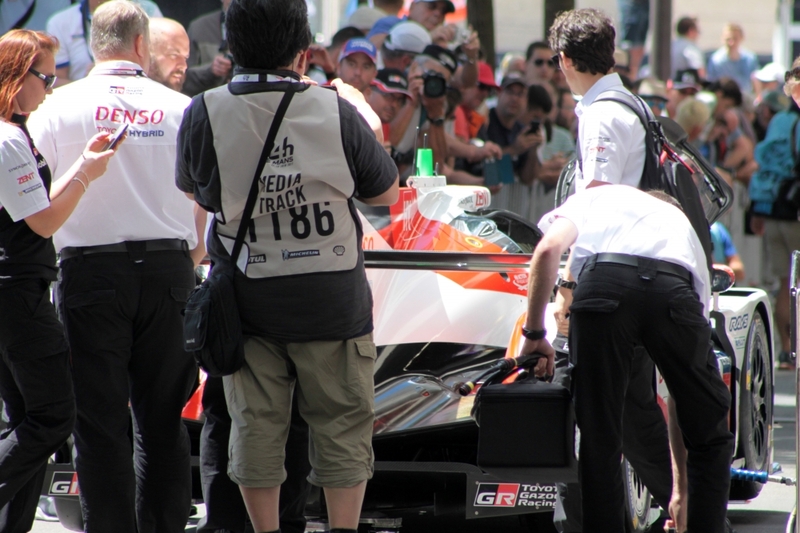 As the first of the Toyotas was pushed out into the photography area out came Kamui Kobayashi, chatting to the fans and filming the whole thing on his mobile phone, taking selfies with the crowd. 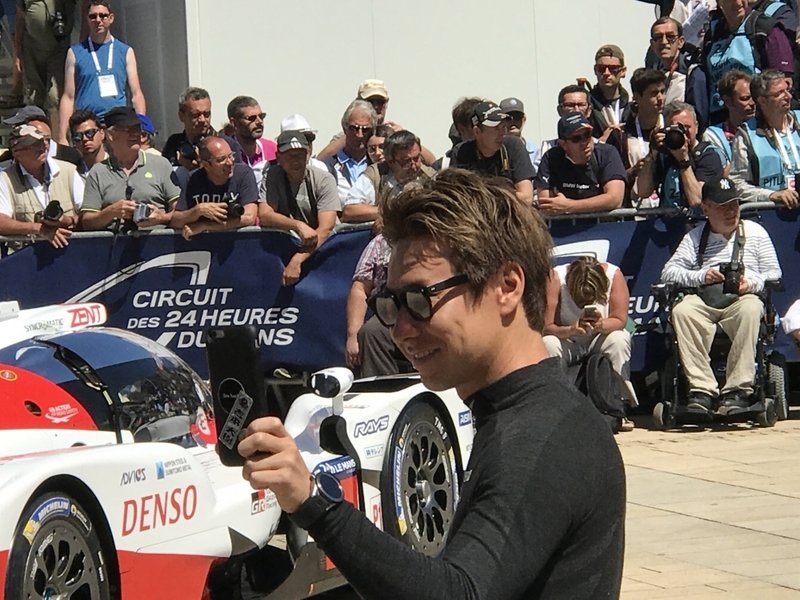 He wandered around, filming the spectators and the delightful thing was that he wasn't doing it because he had to, he appeared to be doing it because he wanted to and he was clearly enjoying it very much. 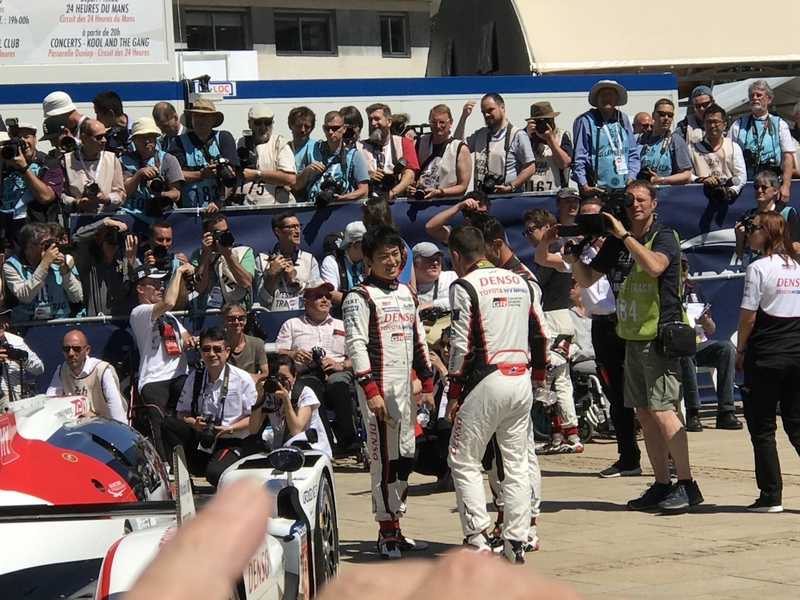 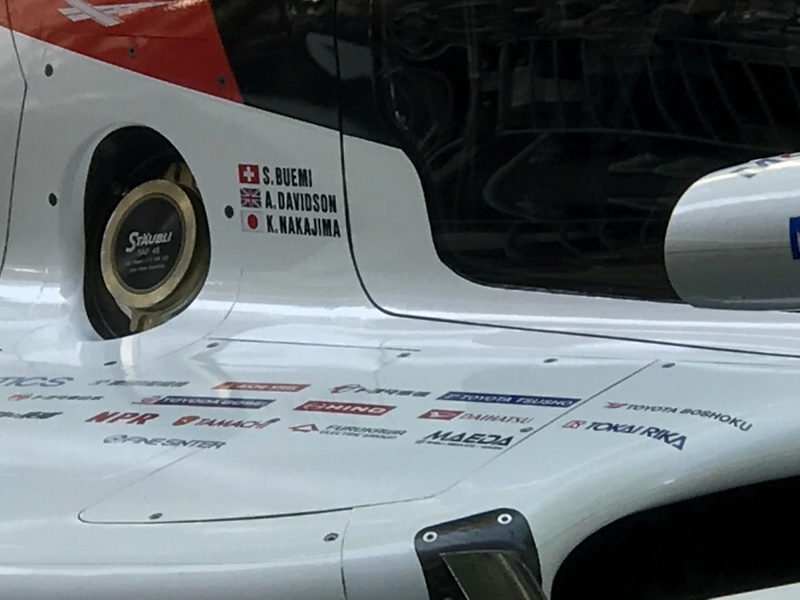 If Toyota weren't already a crowd favourite, this display did them no harm at all and it certainly endeared Kamui in particular to many of the fans present at that moment, including me. 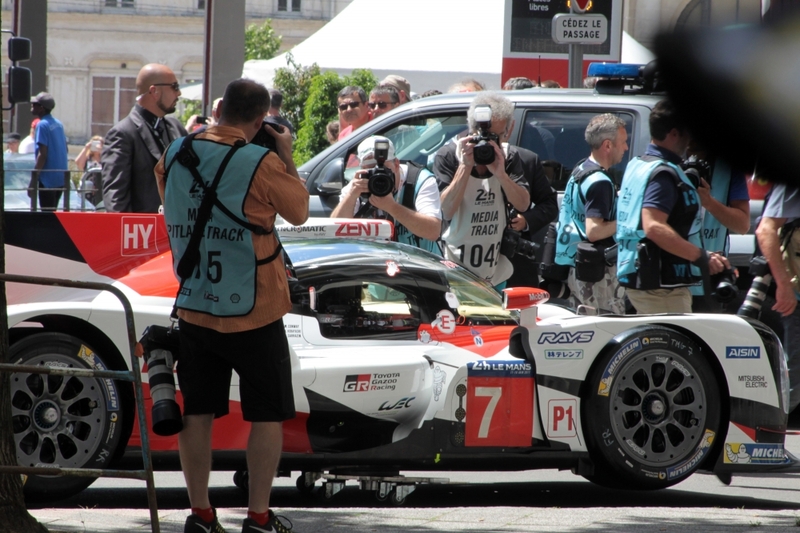 By the time the Toyota photo-session was over we concluded that we had seen all that we wanted to see for the day, however we did return to the 'arrivals' road for a time and lucked into a good spot while the Toyota team were putting their cars away. 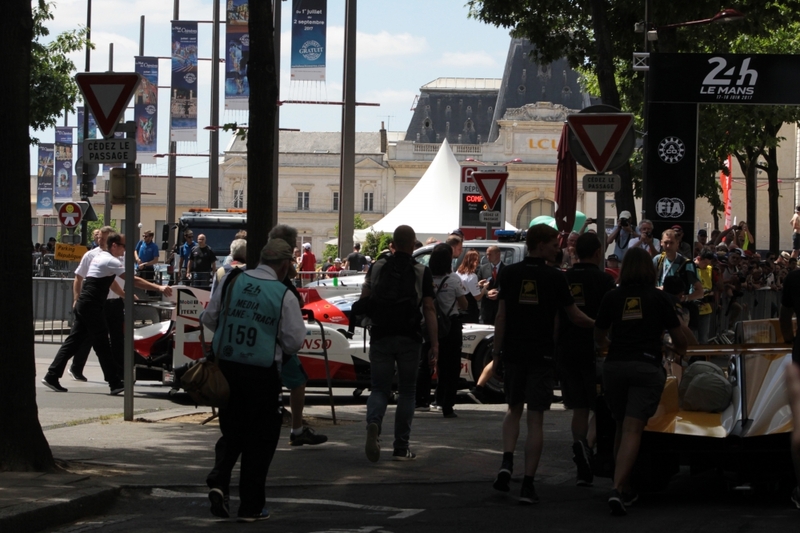 It was still incredibly hot and I was already feeling quite weary, so we left the square and set off to find the car park. 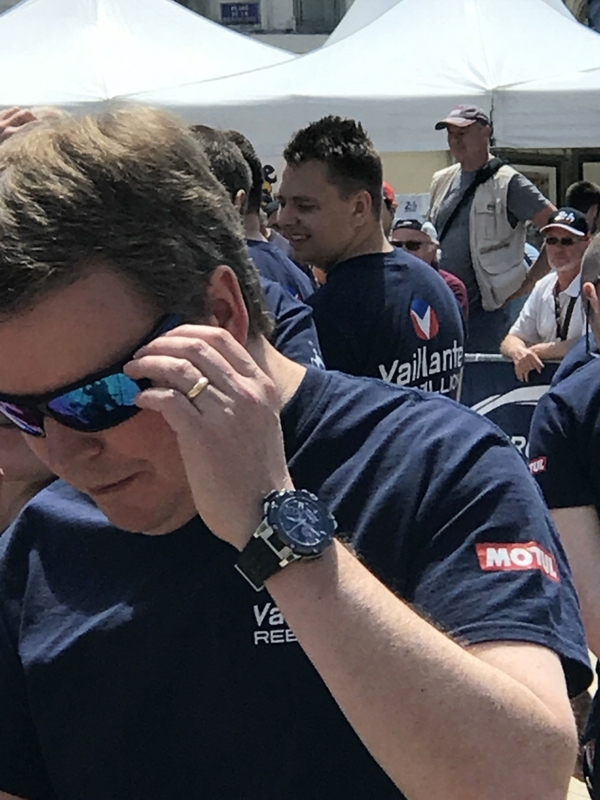 We stopped in a road just off the square to admire a beautiful Aston Martin DB5, pausing while the owner fired it up, almost asphyxiating us with the exhaust fumes as we stood behind it! 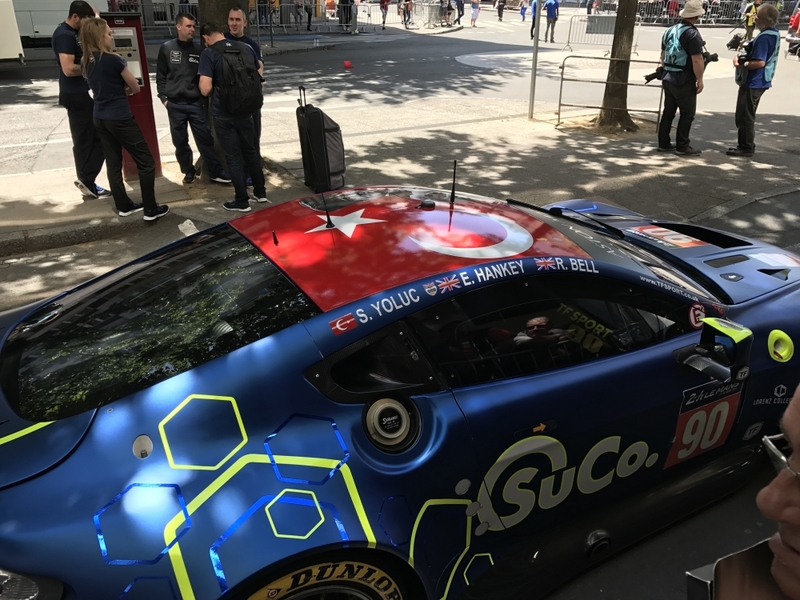 On setting off again James spotted a pharmacy just down the road where I was able to top up my supply of 'Dog Cream', the analgesic cream 'St Bernard' that I first discovered in 2015 and have used regularly ever since. 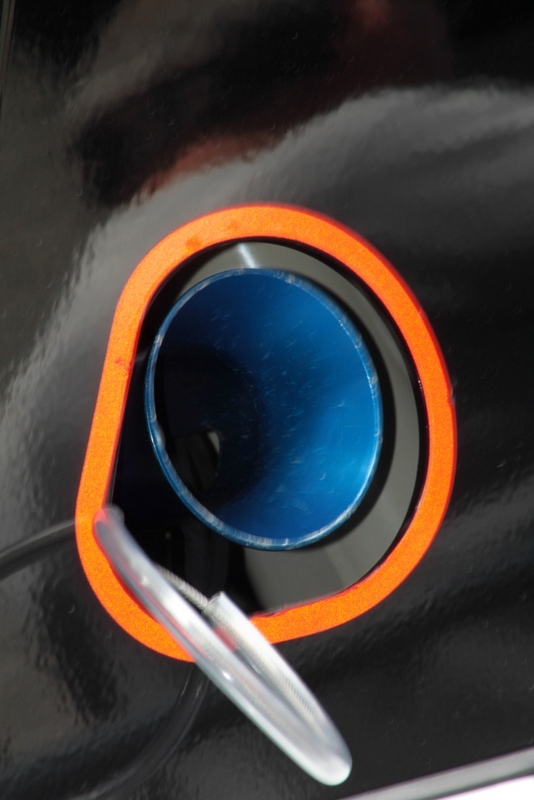 Even better, it was on special offer, so I bought three tubes! 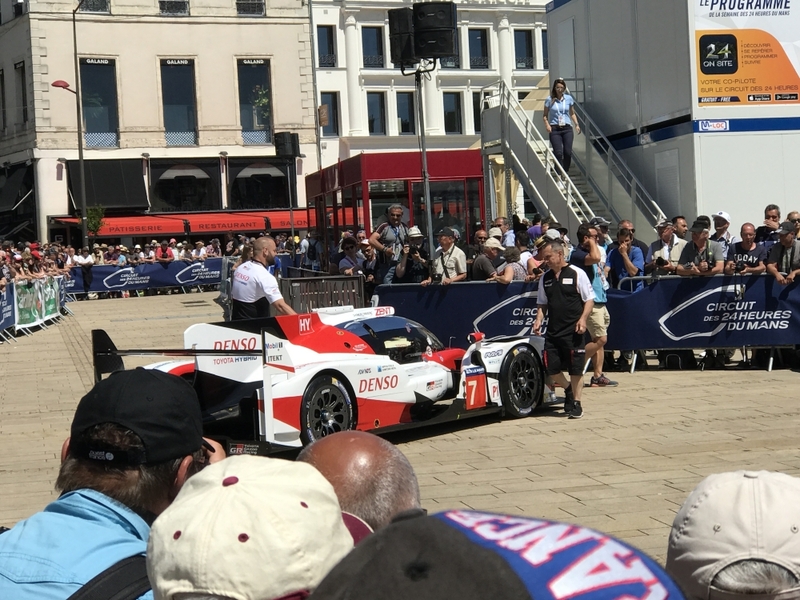 We found our way back to the car easily enough and the car park was still almost empty and just as disconcerting as it had been when we left it a few hours earlier. 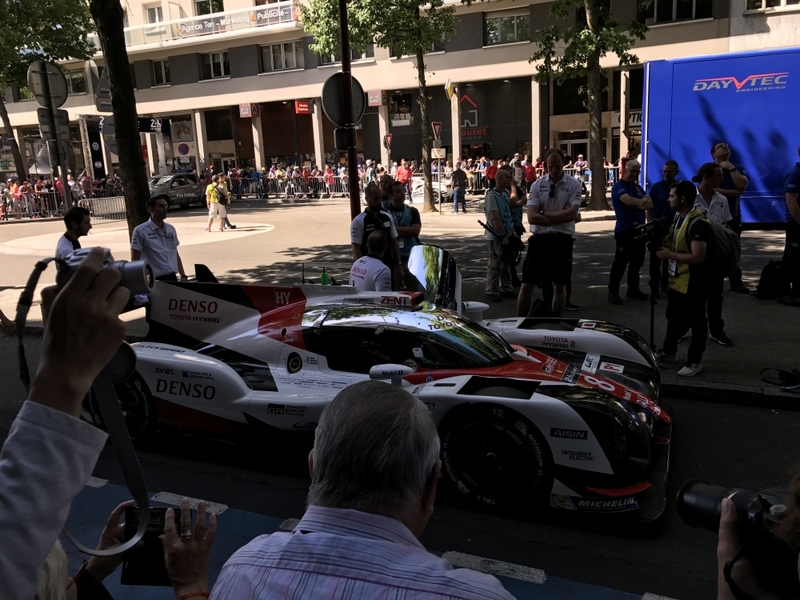 Having paid what I recall was a very reasonable amount for parking there for much of the day we set off back to the hotel, arriving about 5.15 pm. 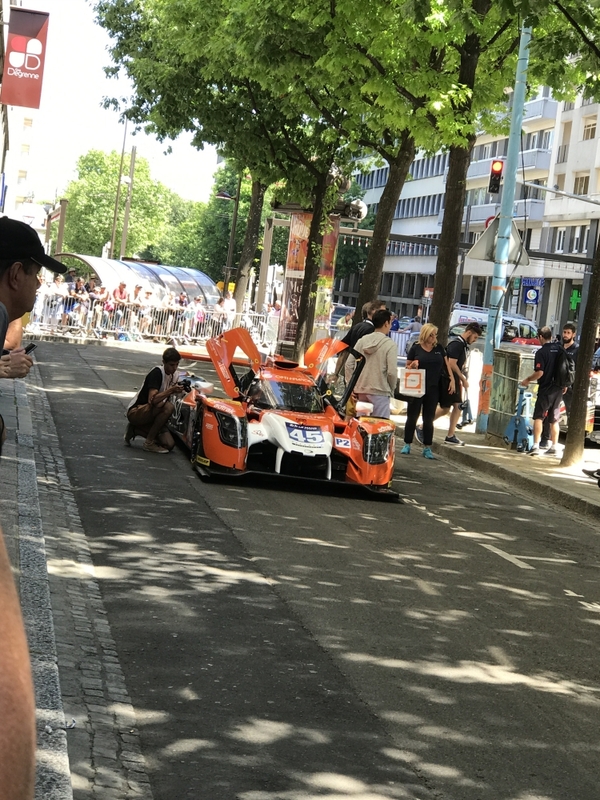 After a quick shower our thoughts inevitably turned to food and we decided to pay a visit to another old 'haunt' the Hippo Grill, for foie gras, steak brochettes and for me, panna cotta to finish. 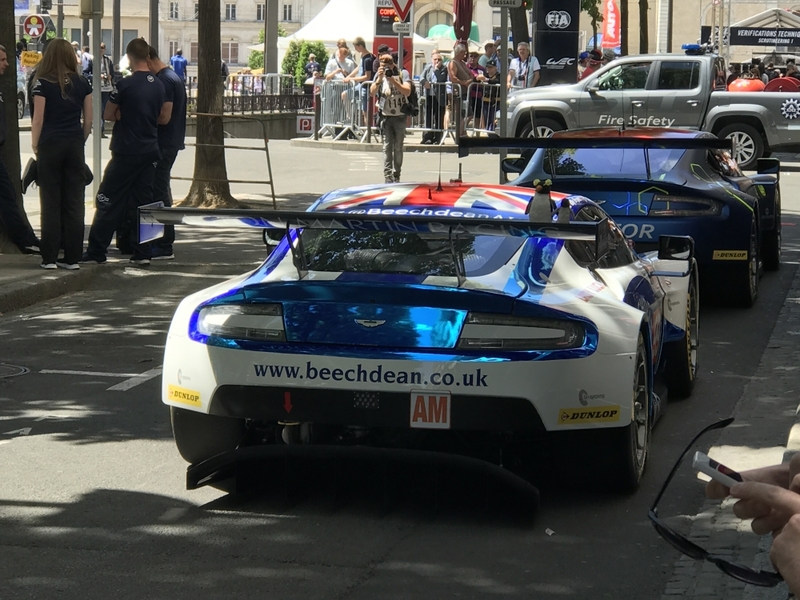 It was a very nice meal taken outside in the sun and I also indulged in what was for me, a very rare beer, my first alcohol in fact since my cider at Le Gouland on the way back from Le Mans the previous June! 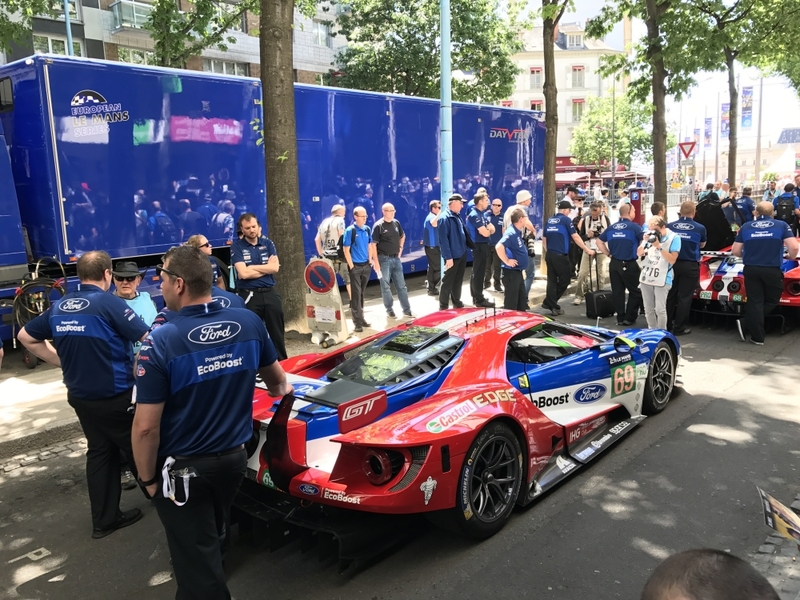 The service however was rather 'inattentive', something which we didn't know at the time would become a bit of a theme for our meals on this trip. 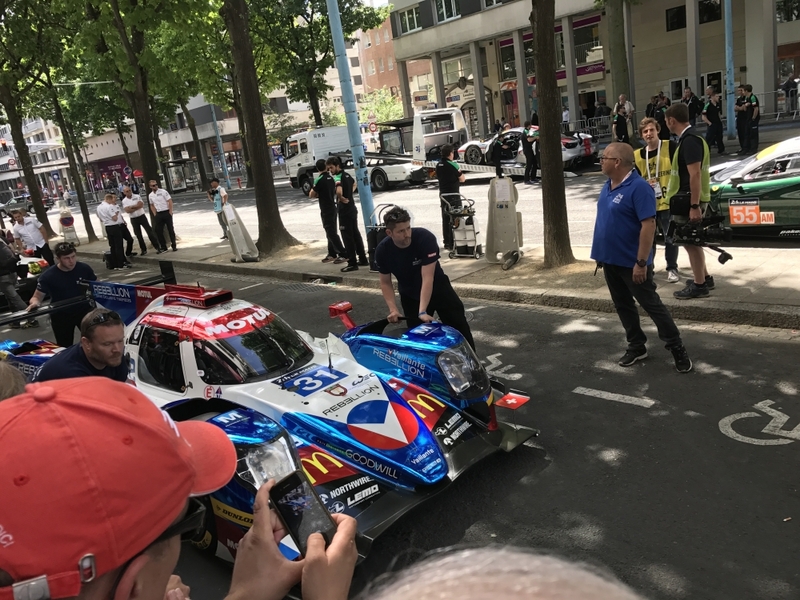 Having gone out early to eat, we were still back to our rooms by 8.30 and after copying my videos and photos for the day to my laptop, I turned in eventually around 11 pm.